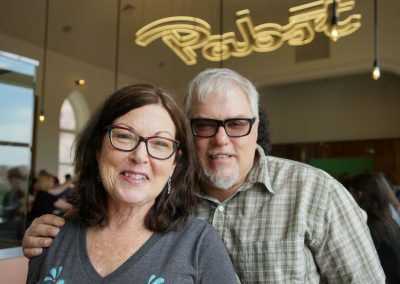 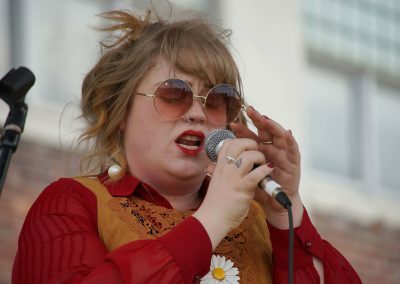 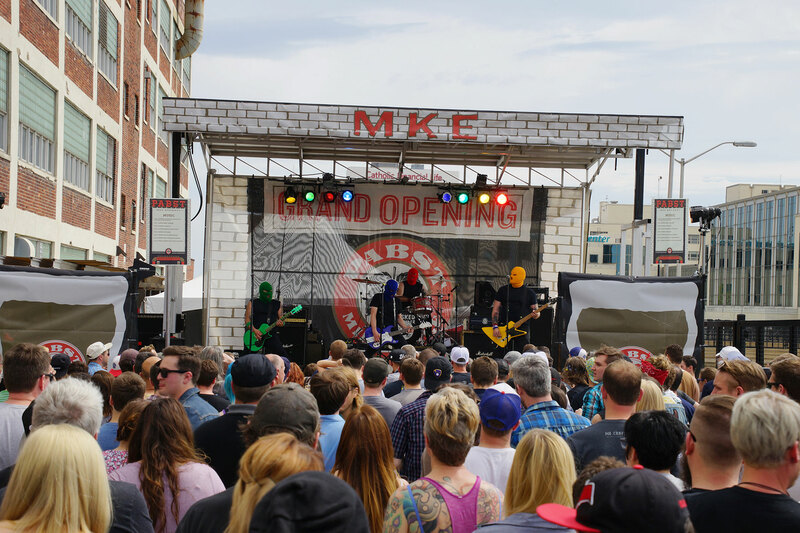 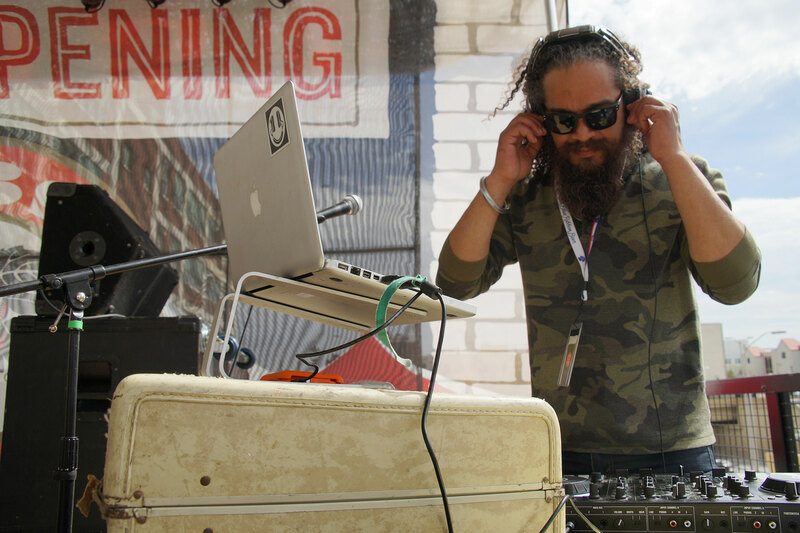 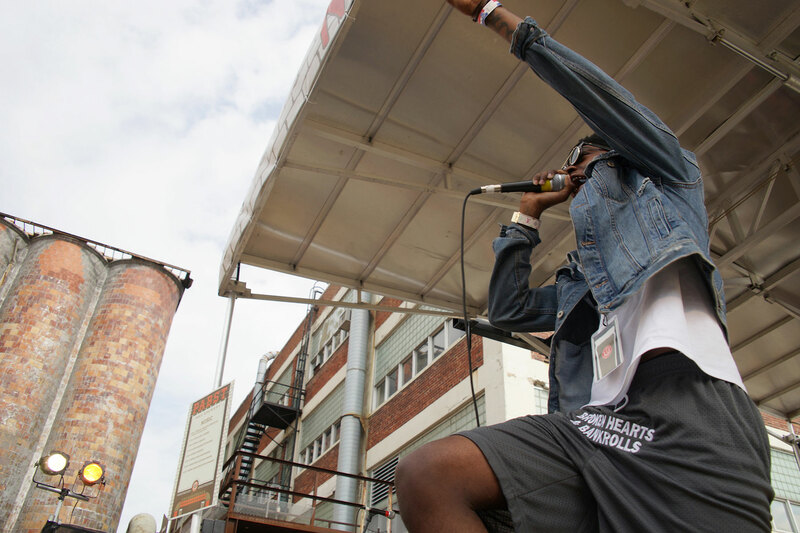 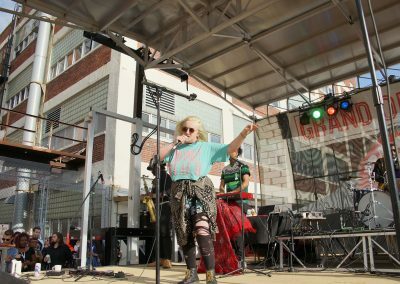 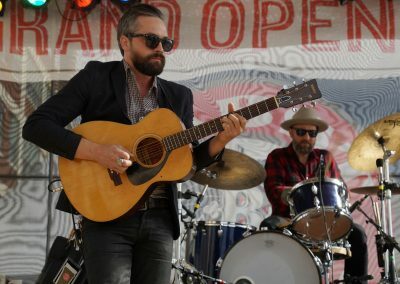 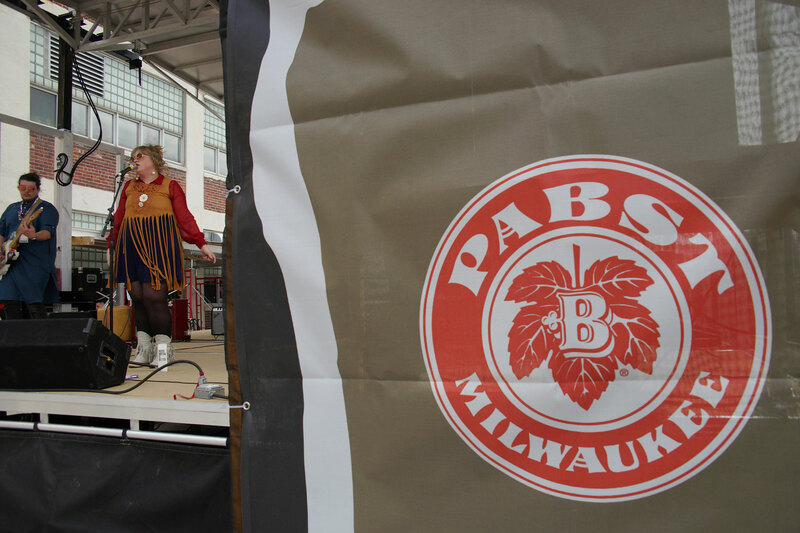 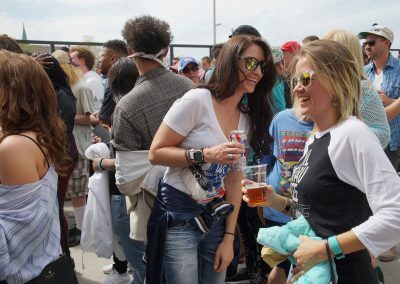 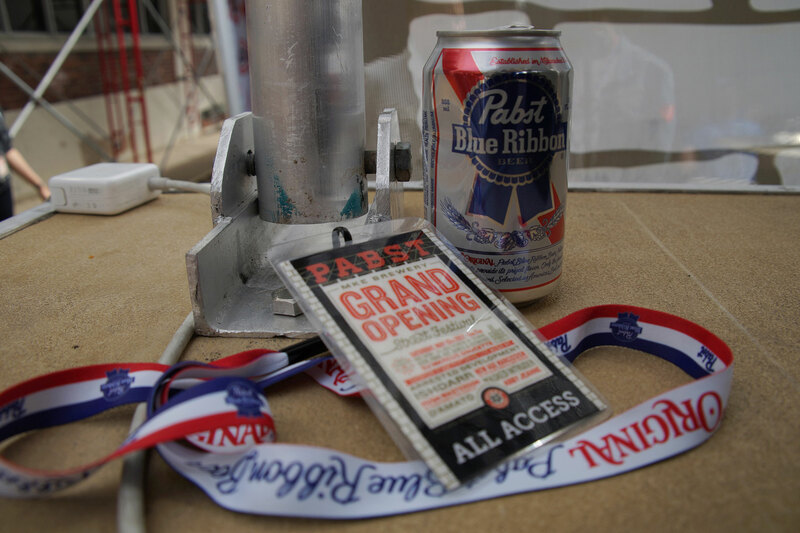 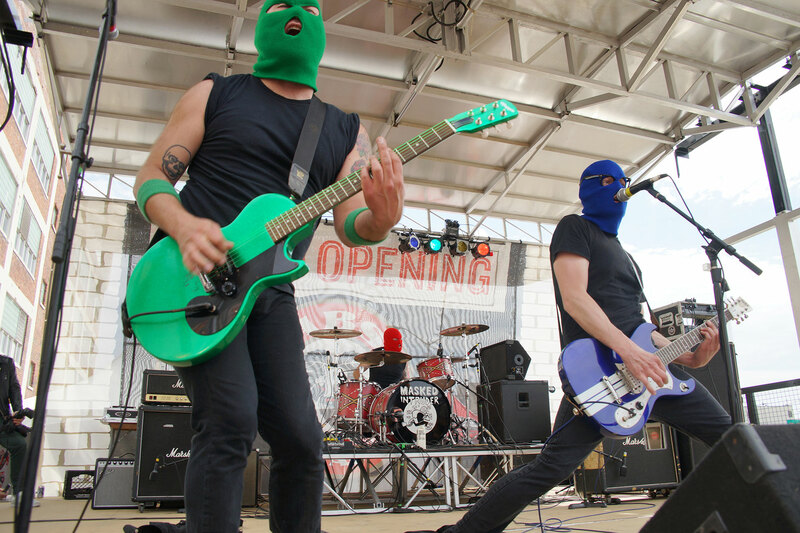 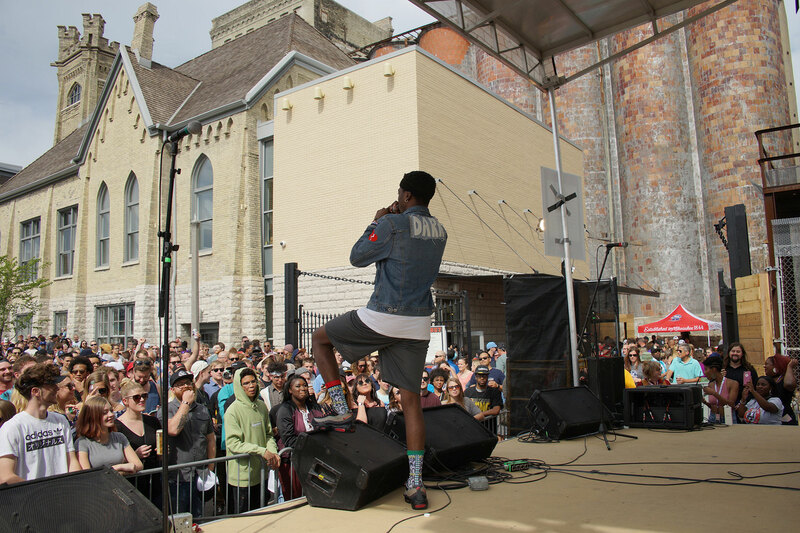 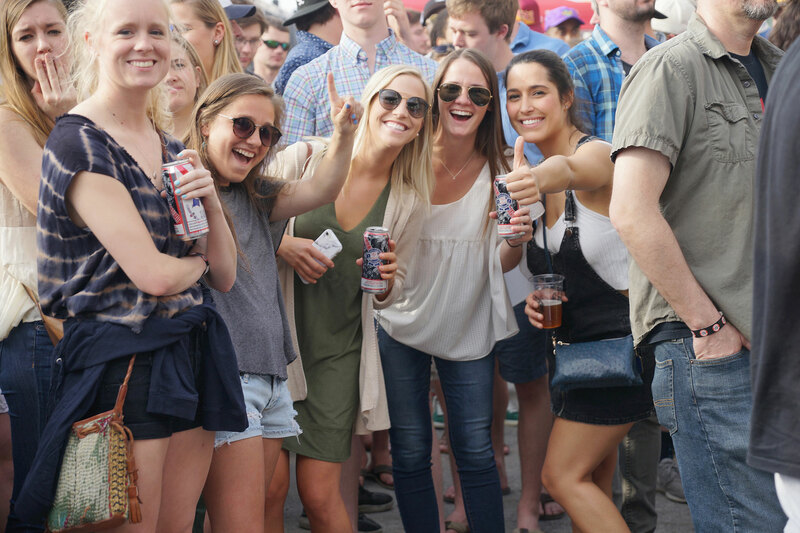 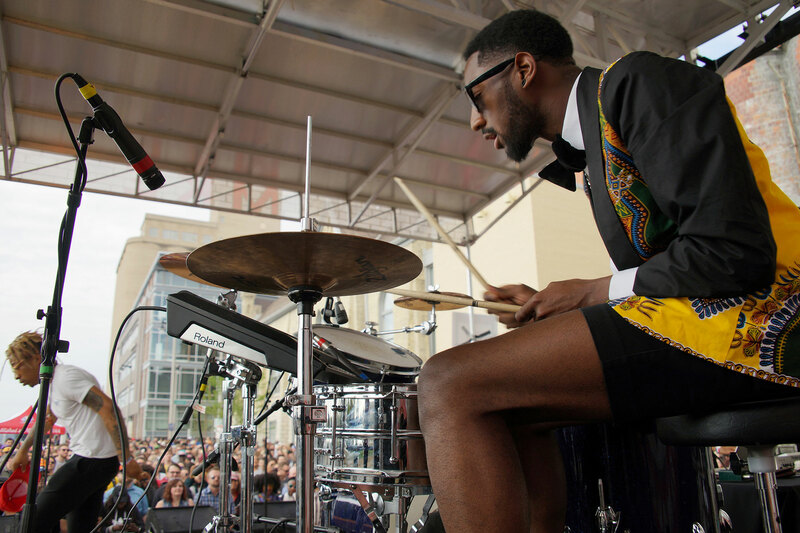 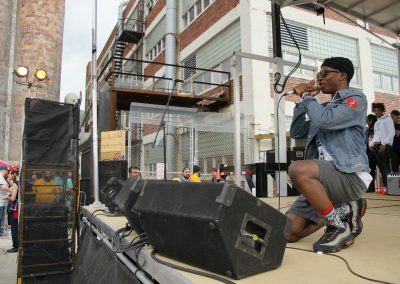 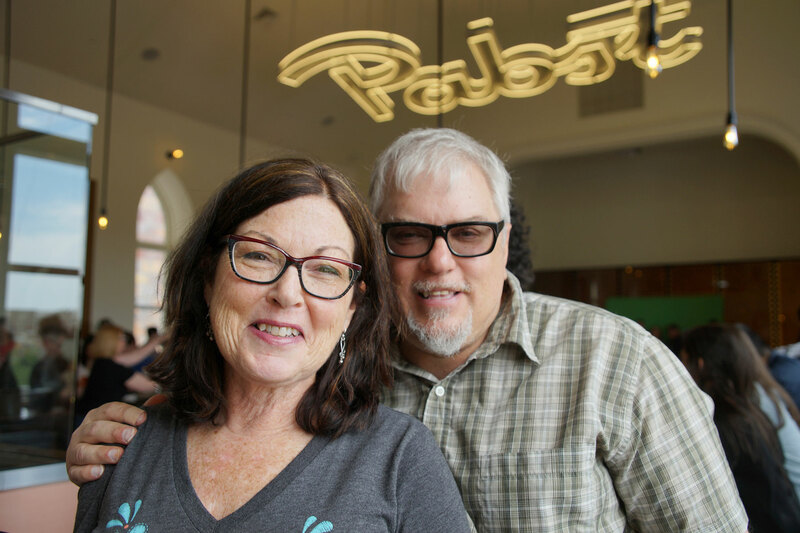 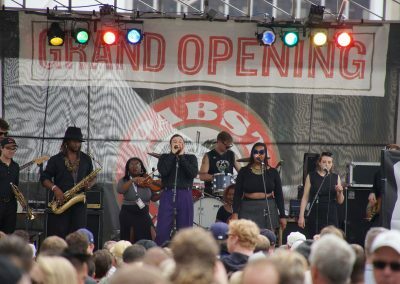 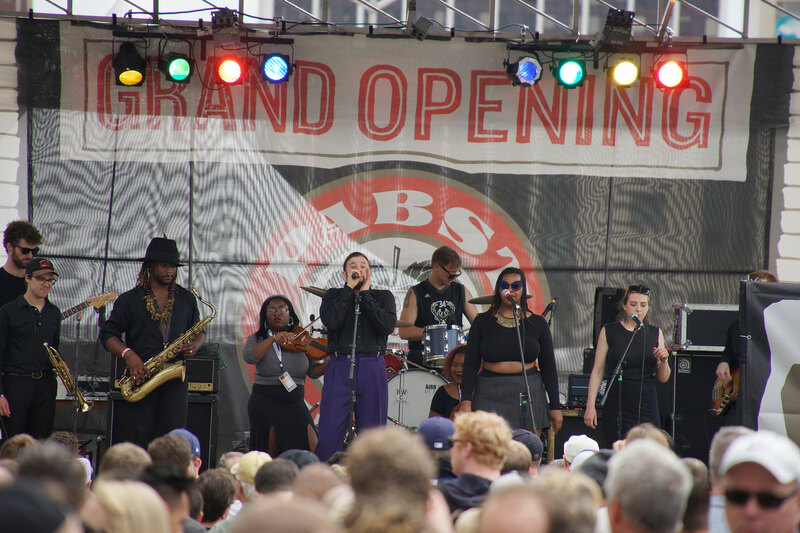 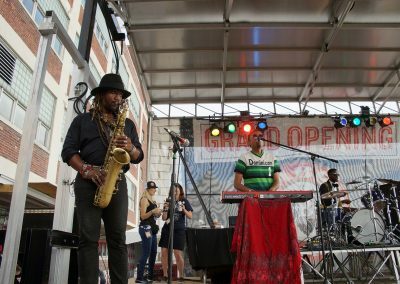 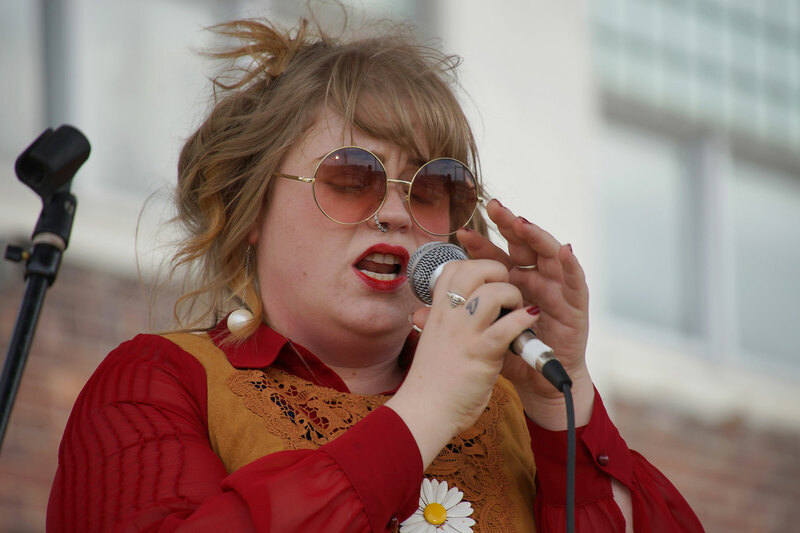 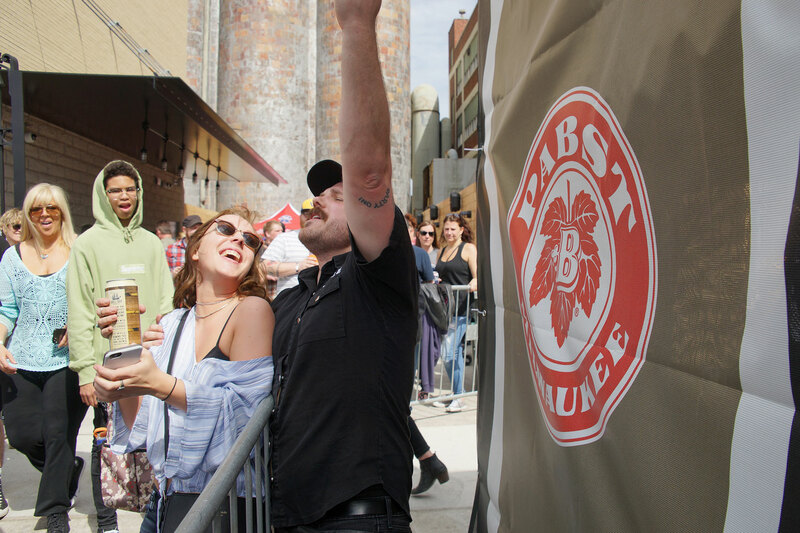 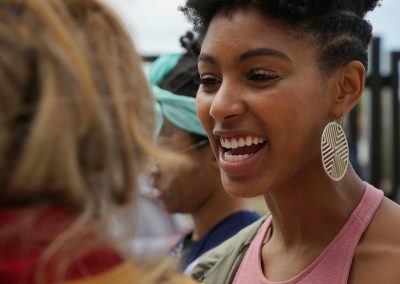 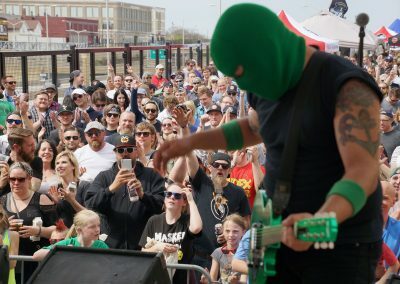 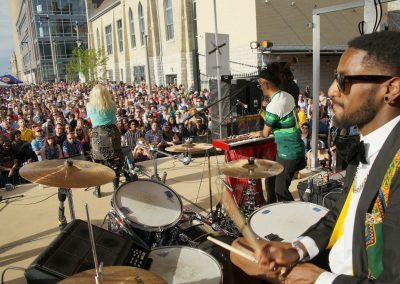 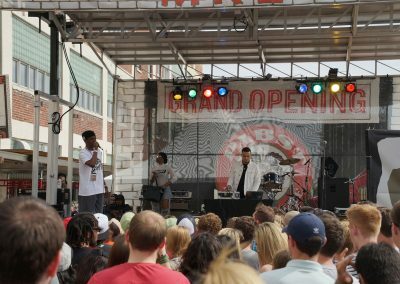 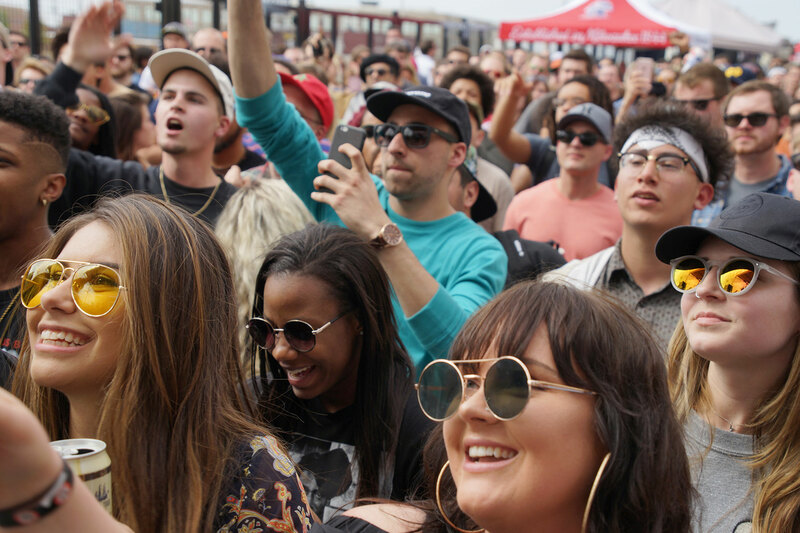 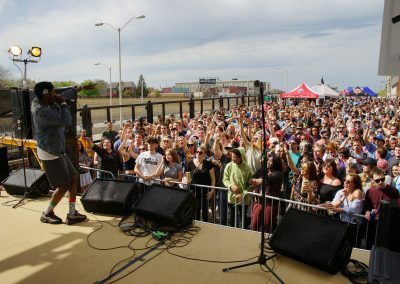 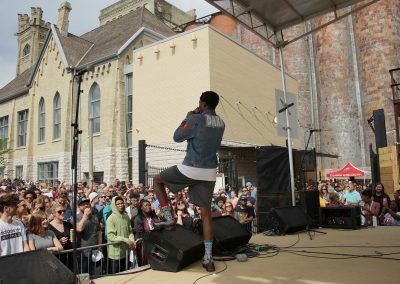 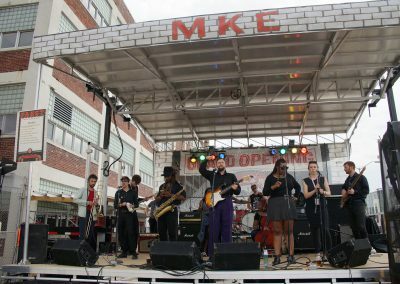 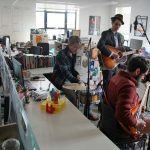 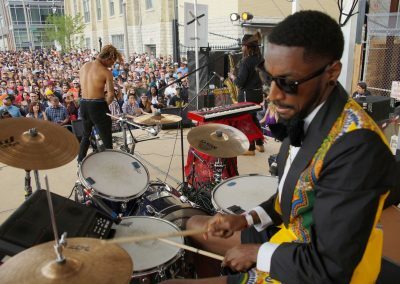 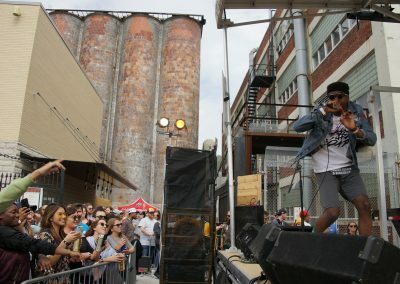 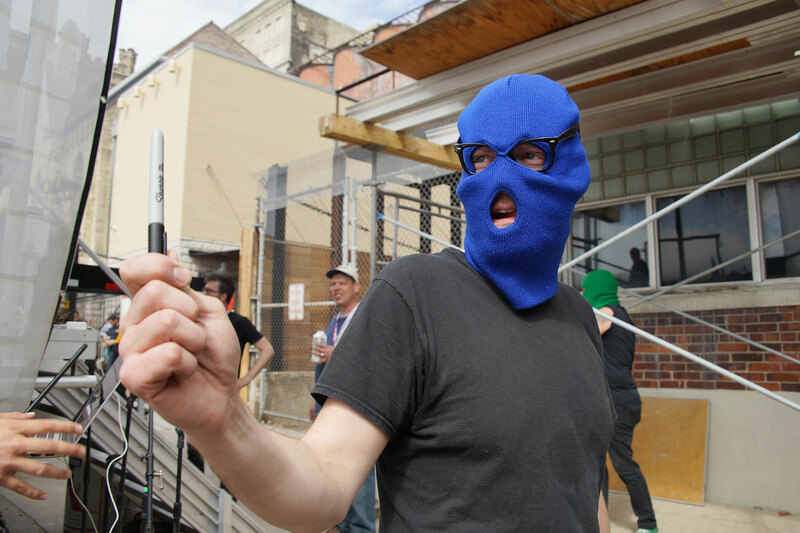 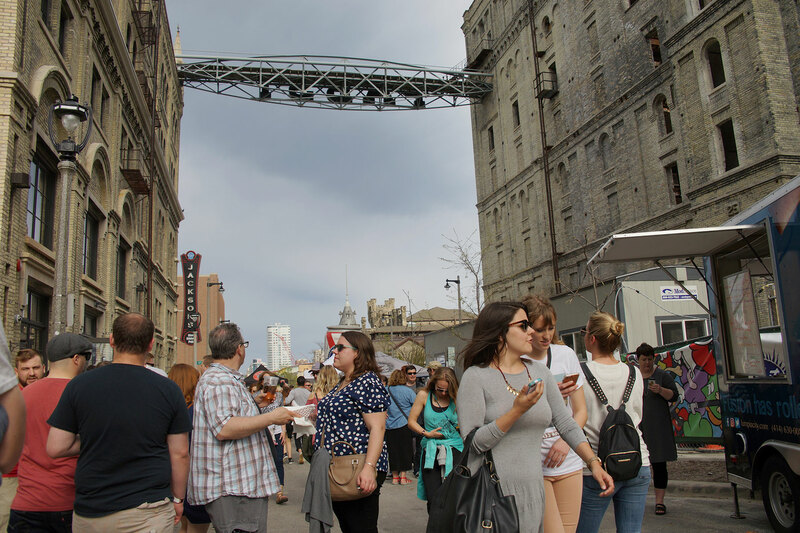 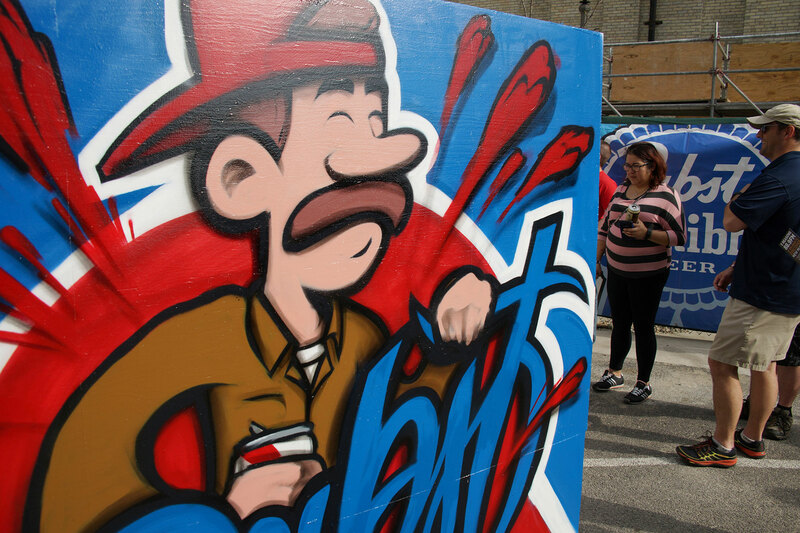 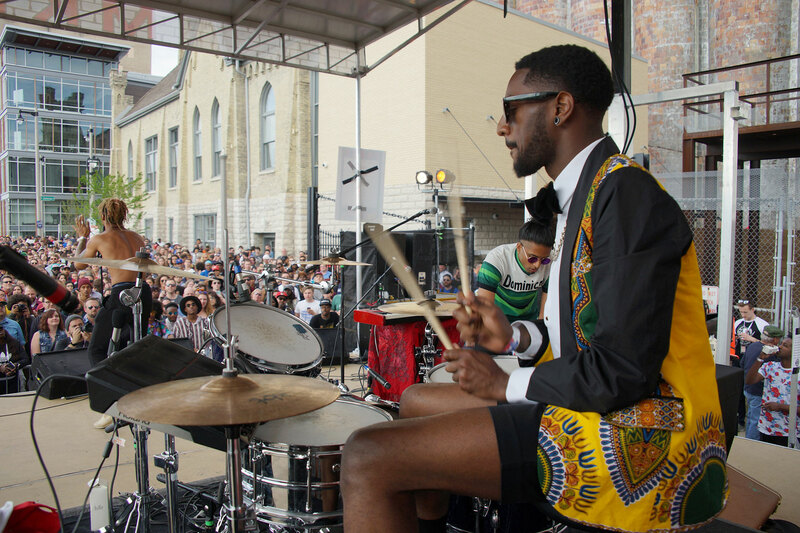 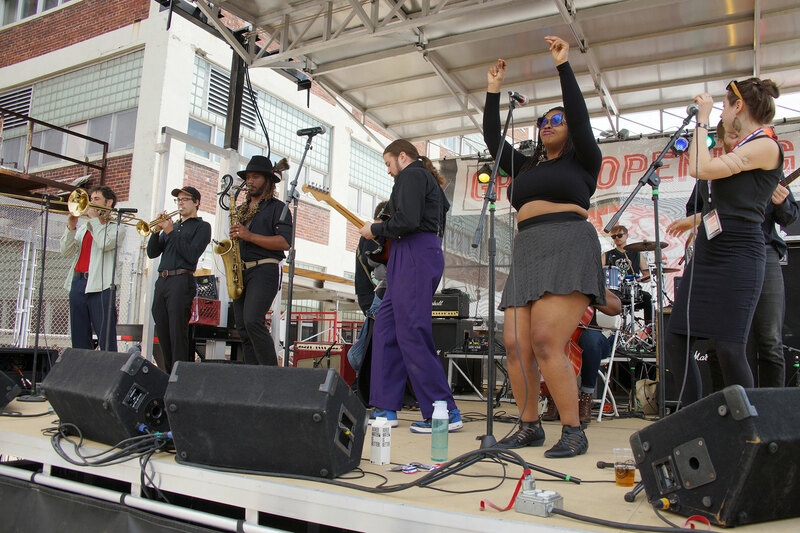 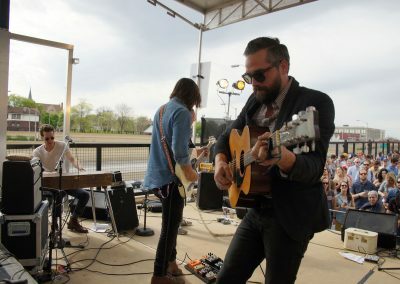 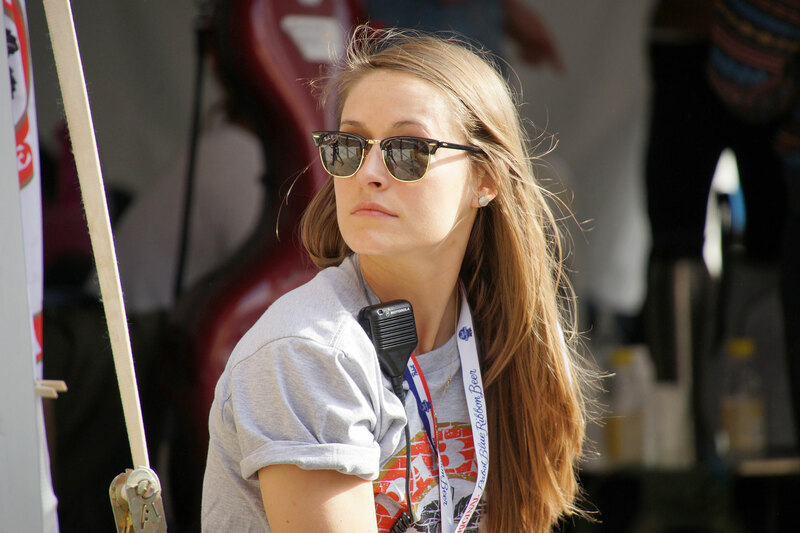 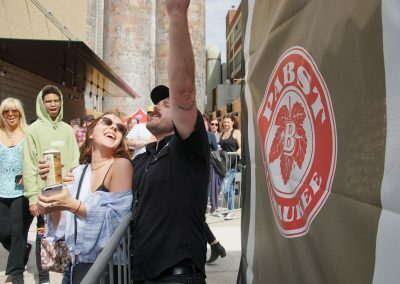 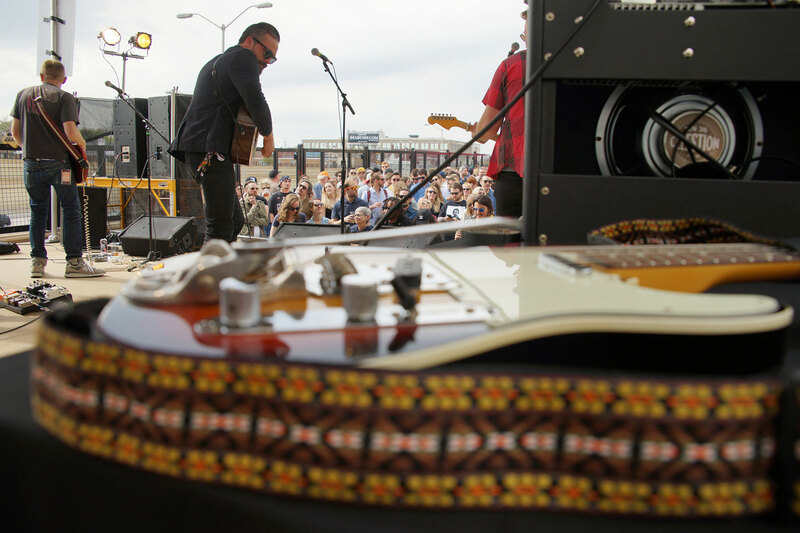 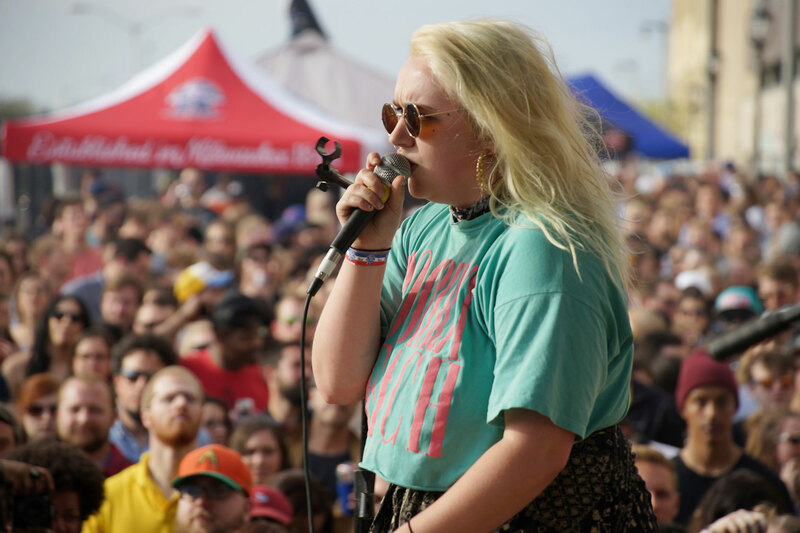 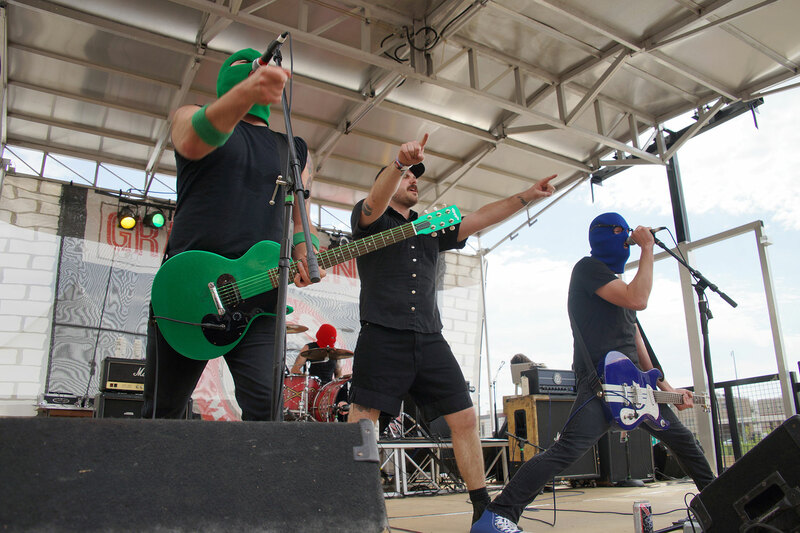 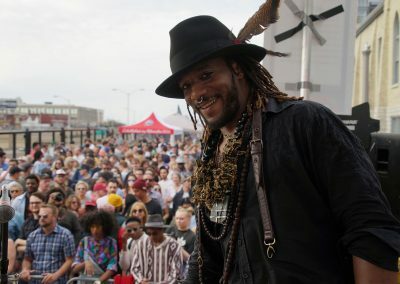 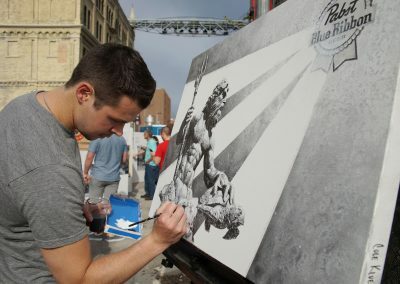 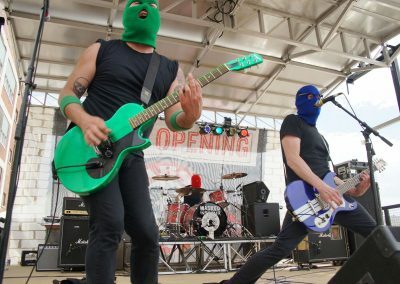 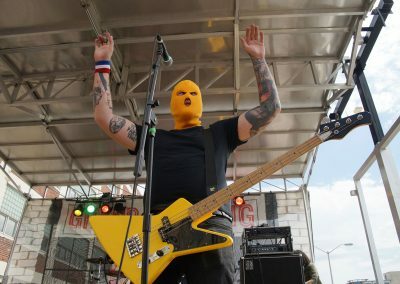 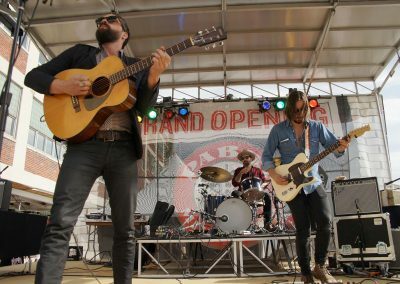 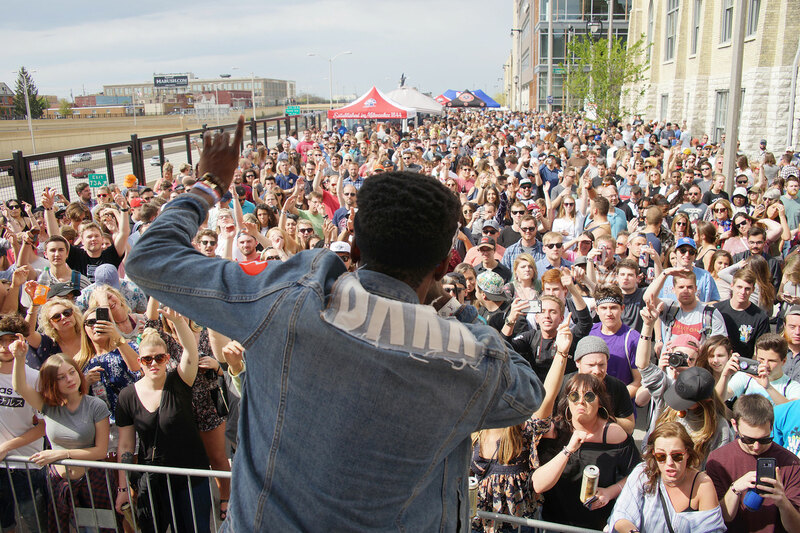 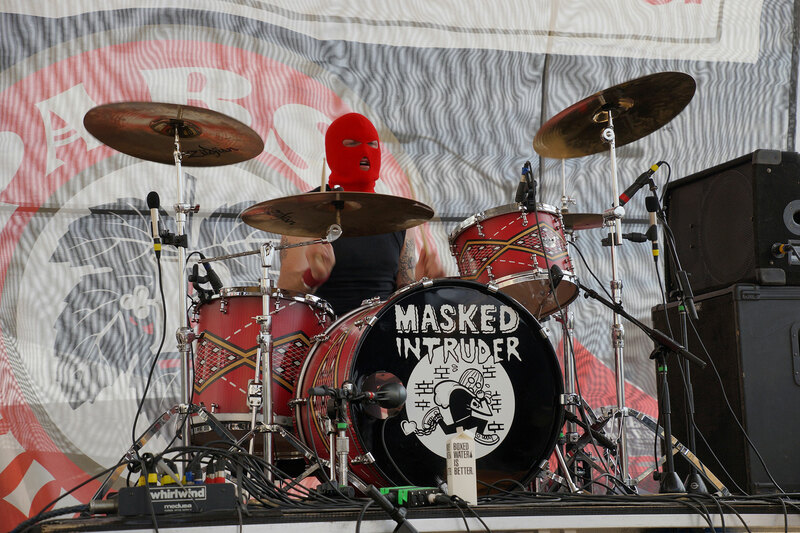 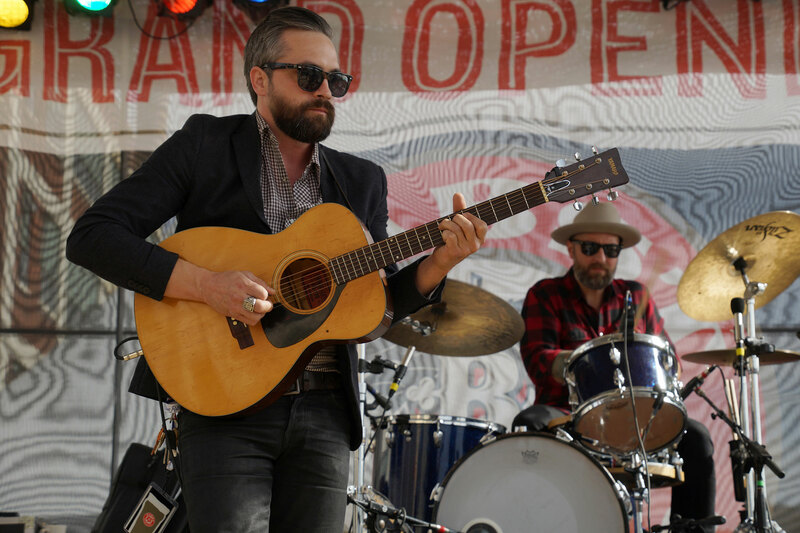 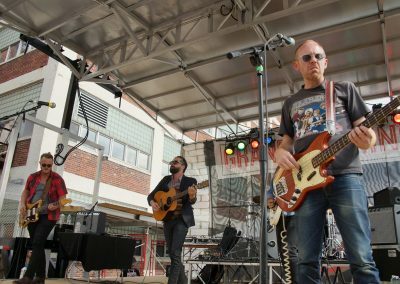 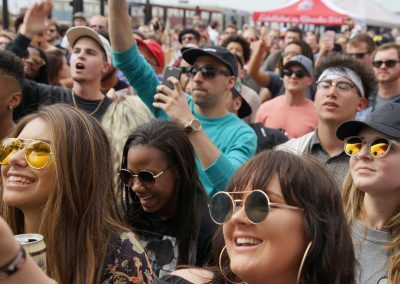 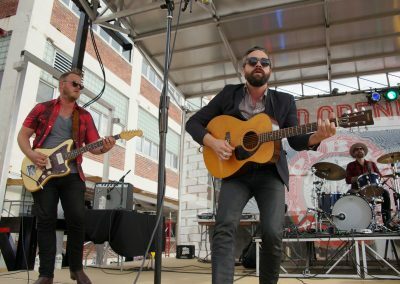 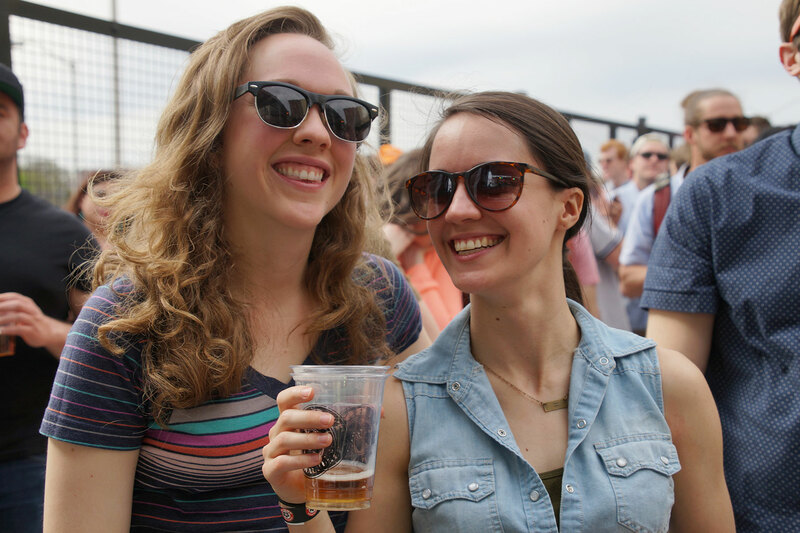 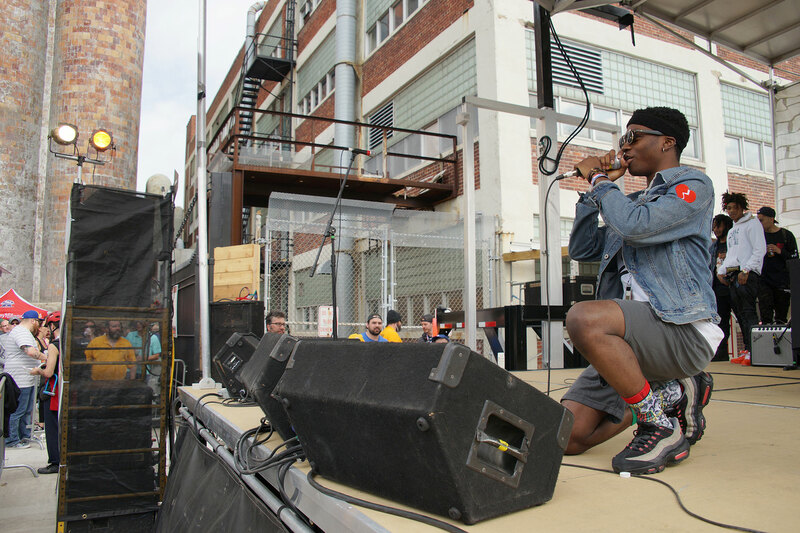 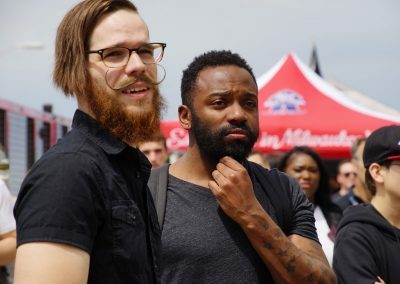 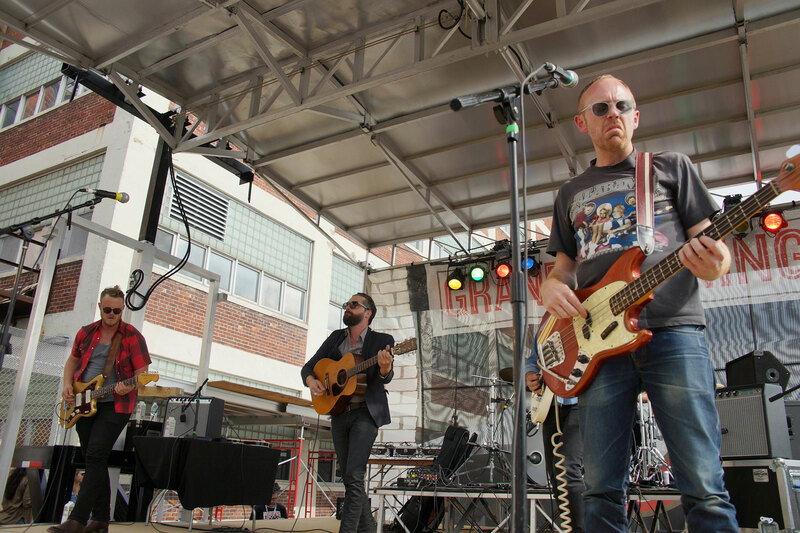 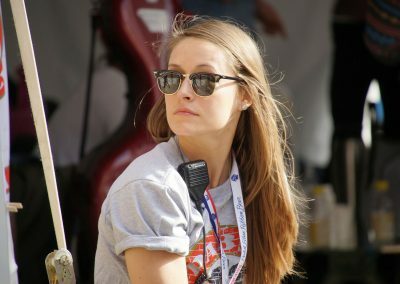 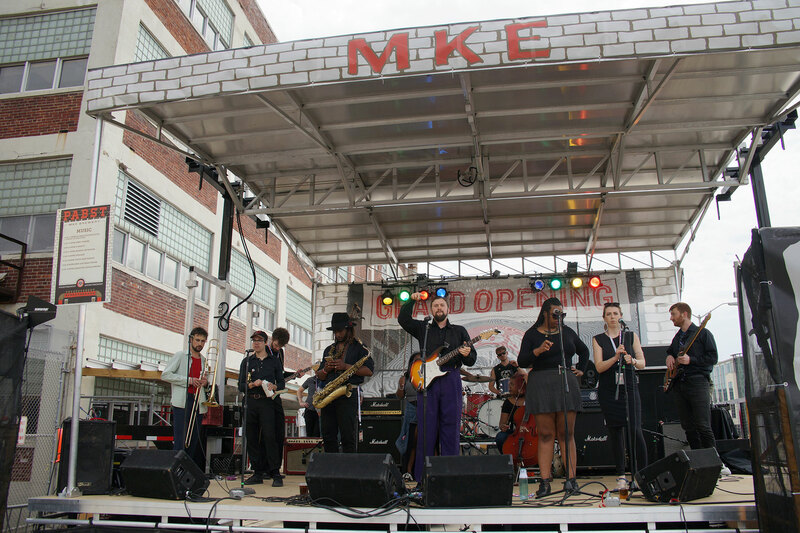 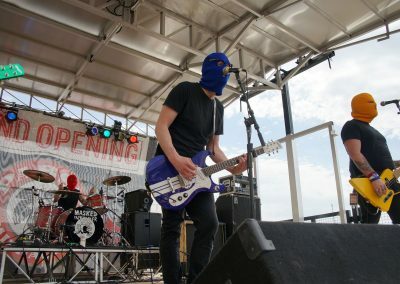 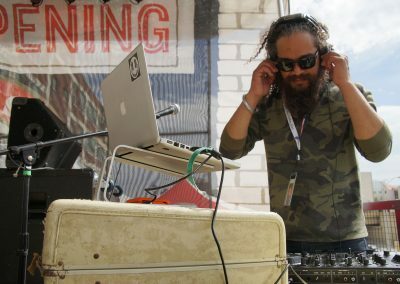 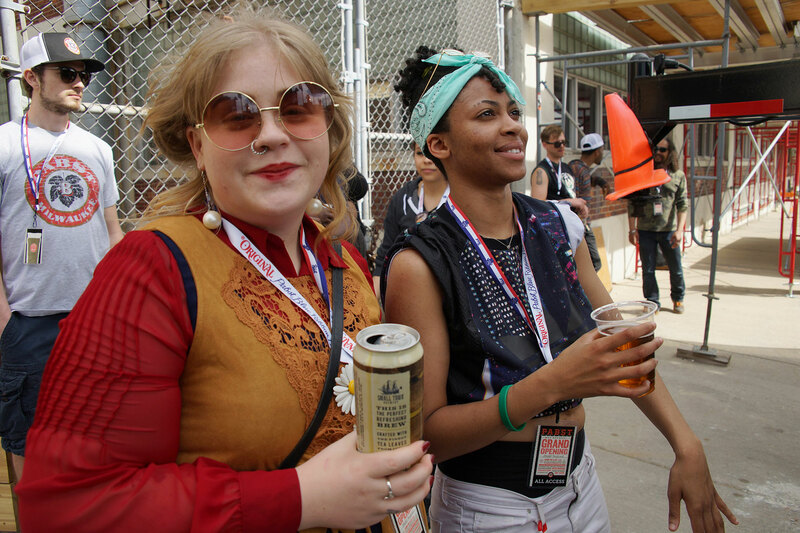 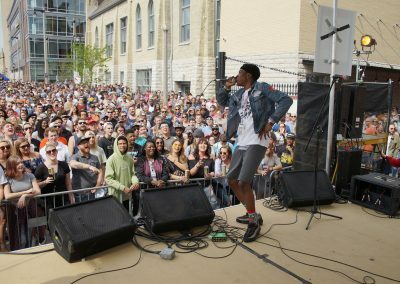 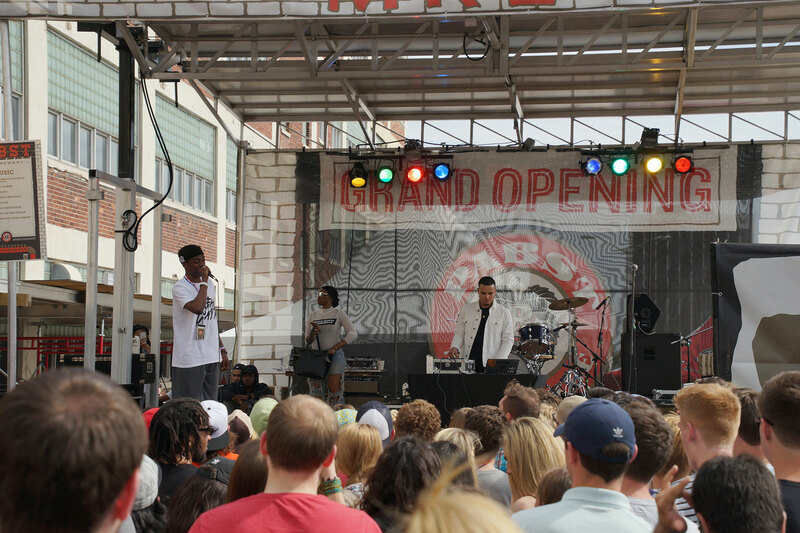 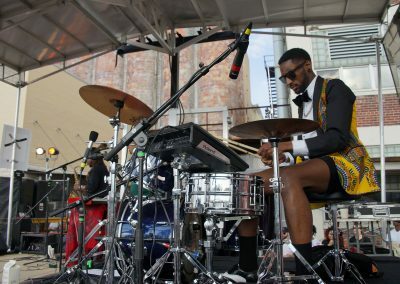 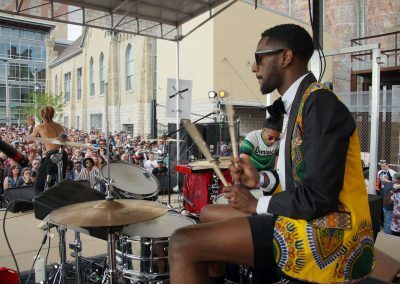 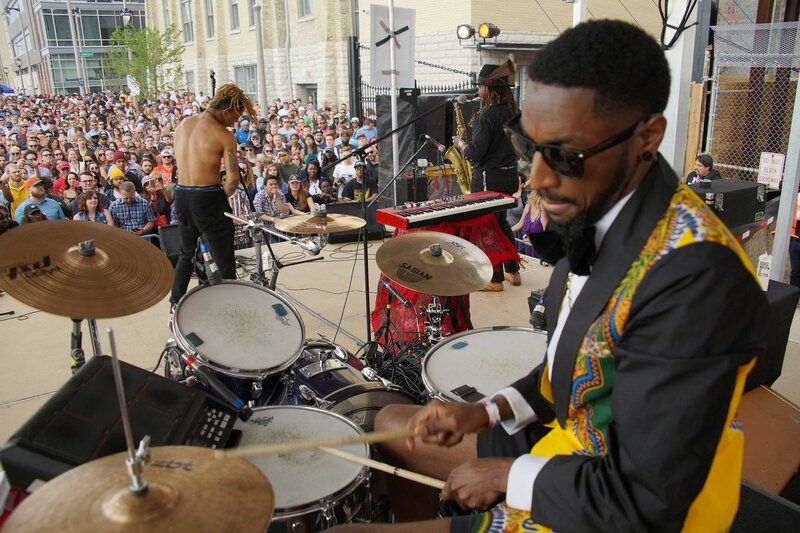 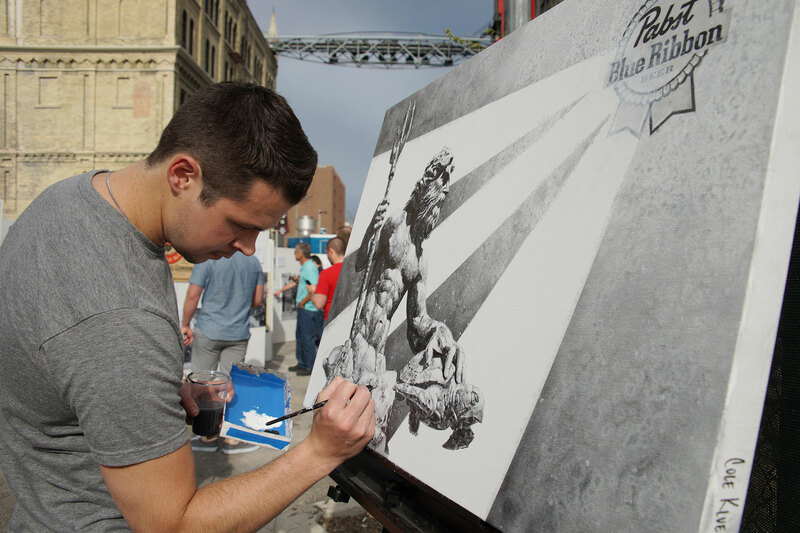 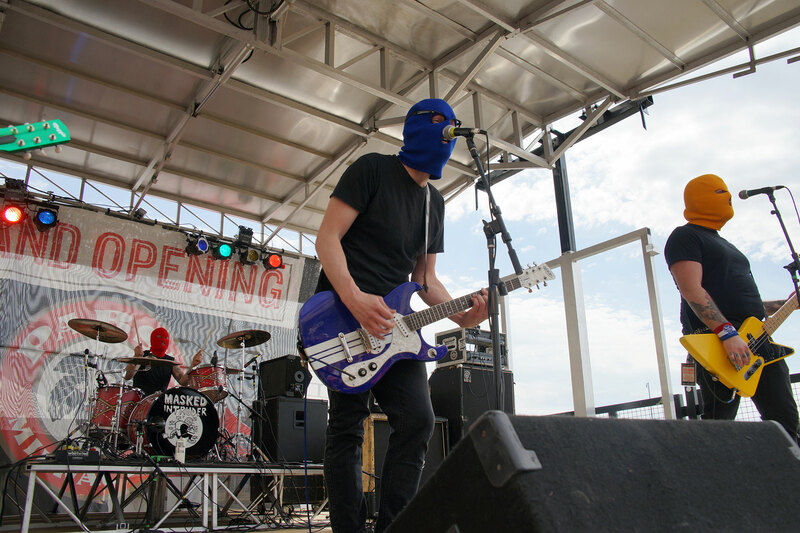 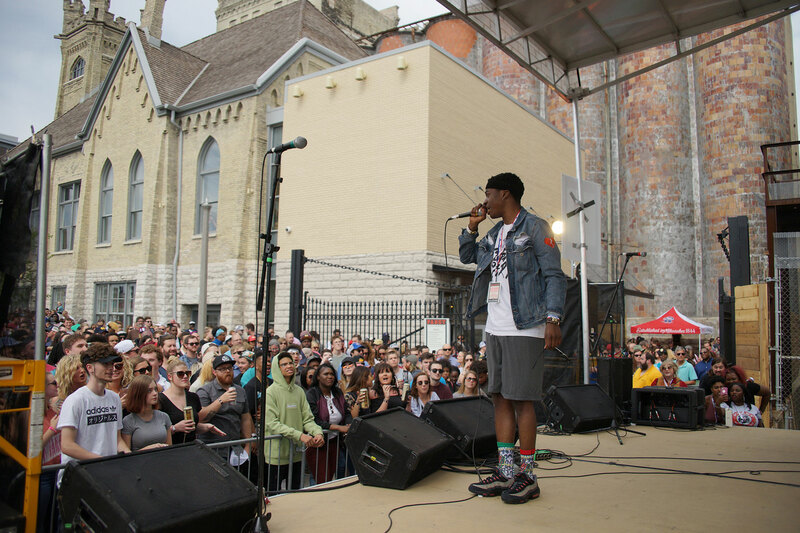 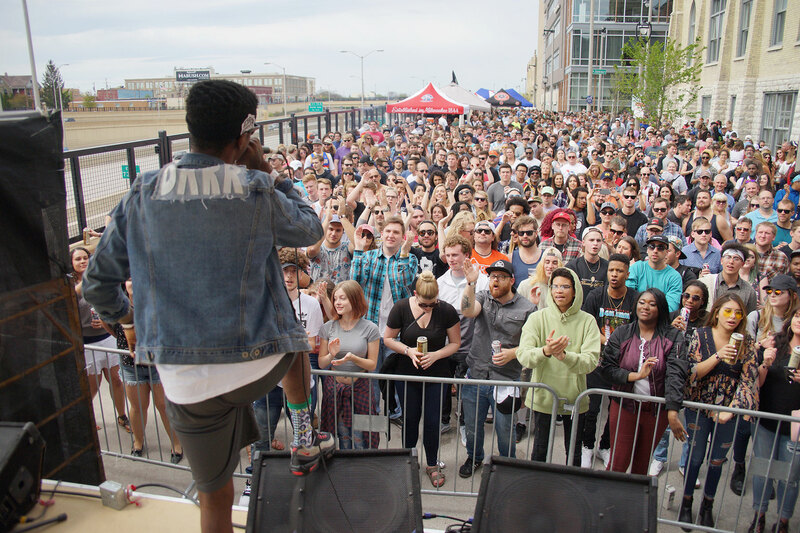 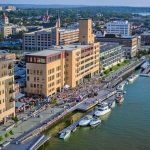 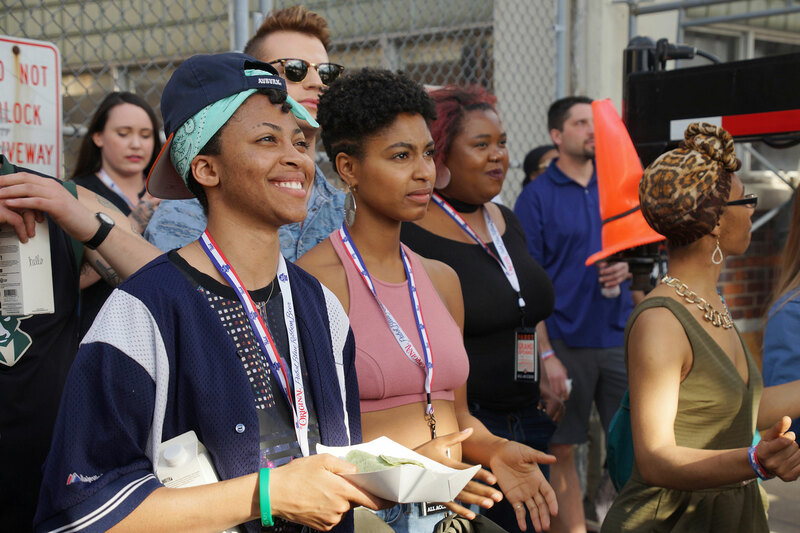 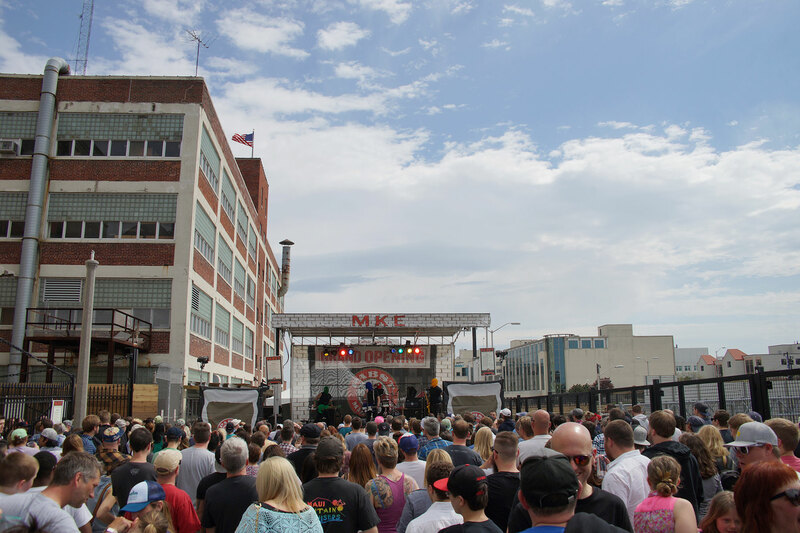 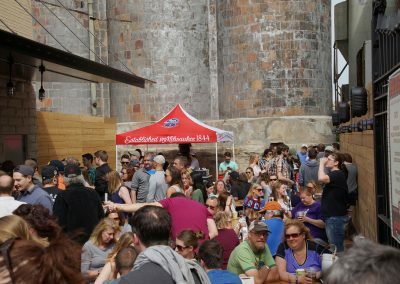 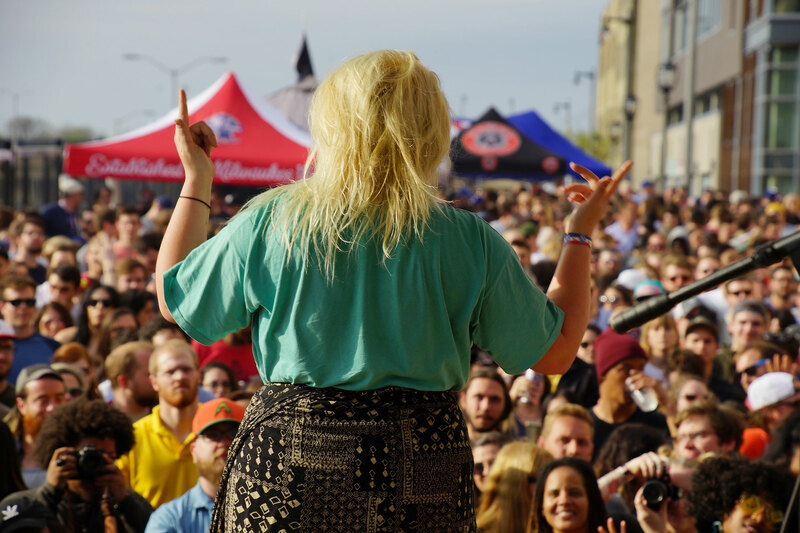 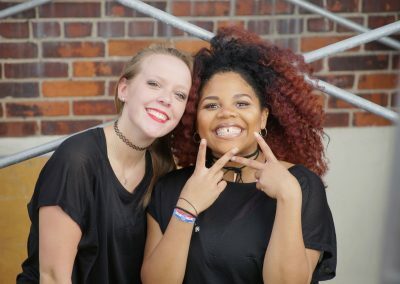 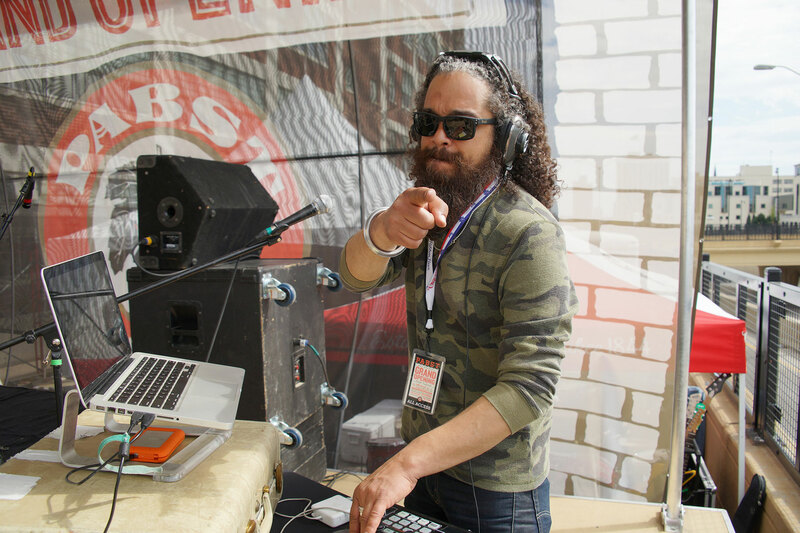 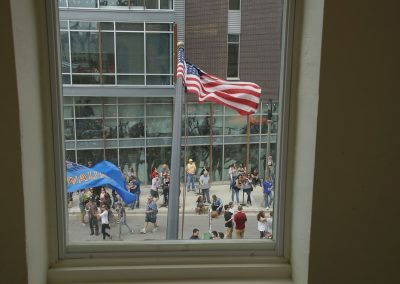 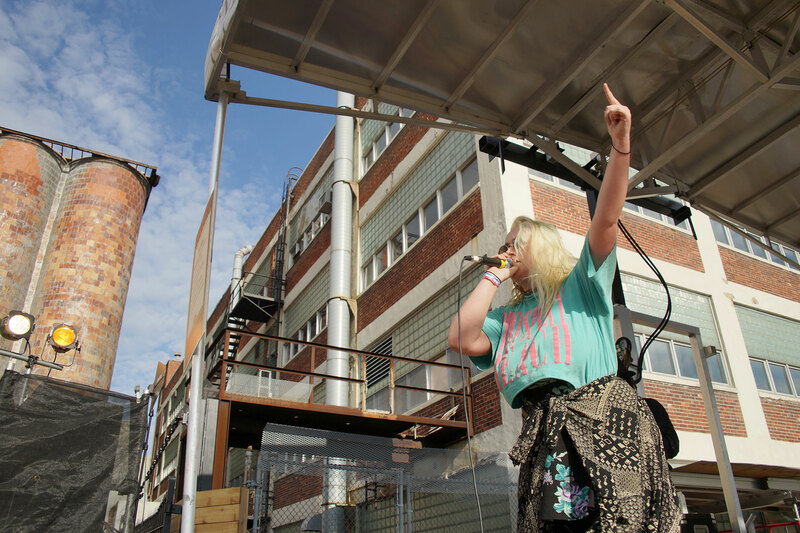 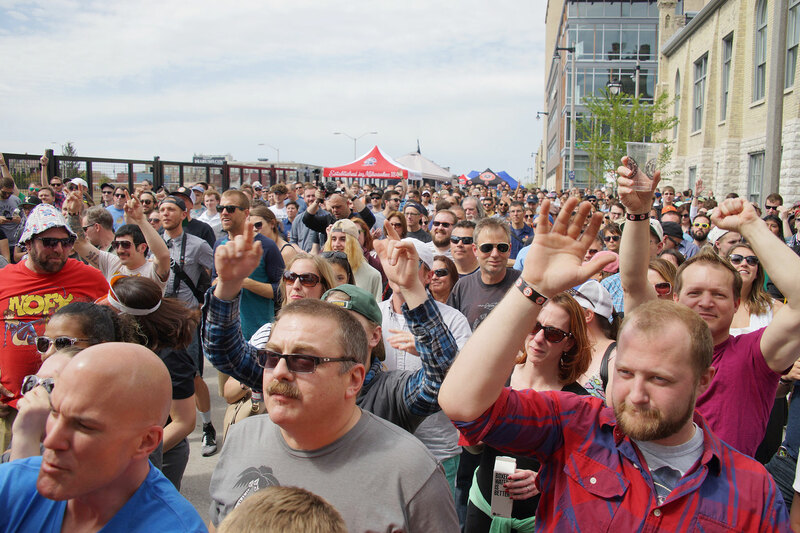 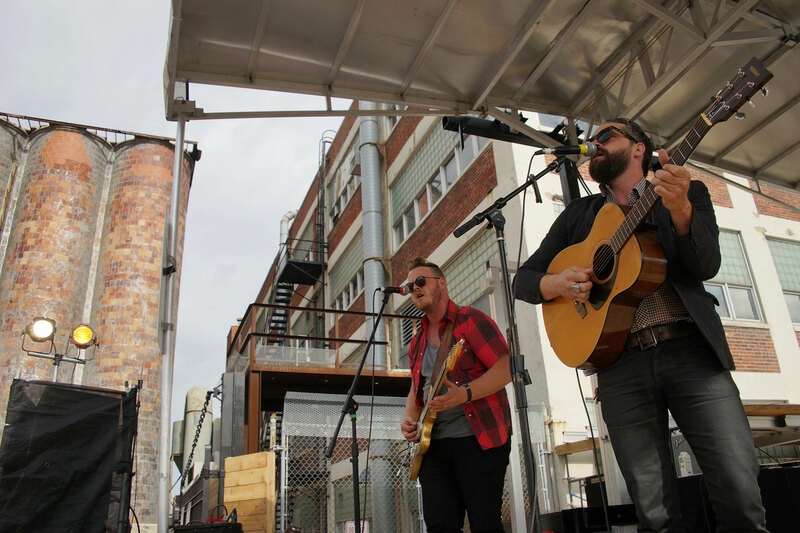 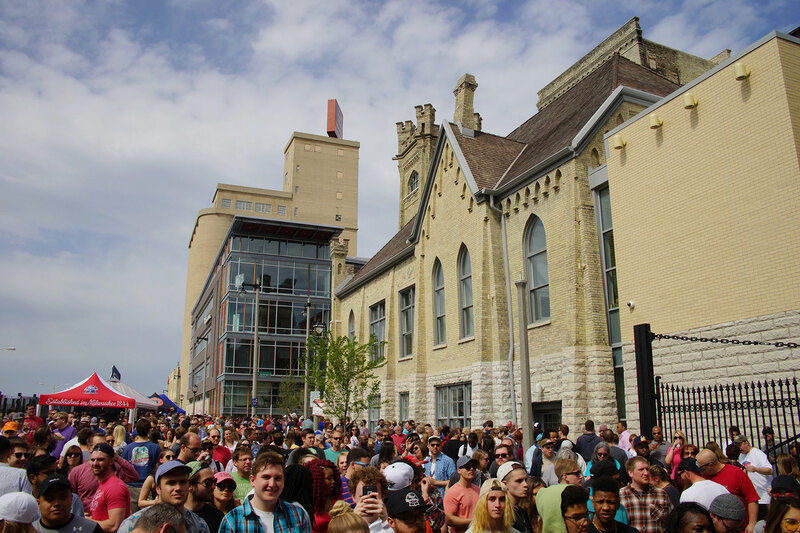 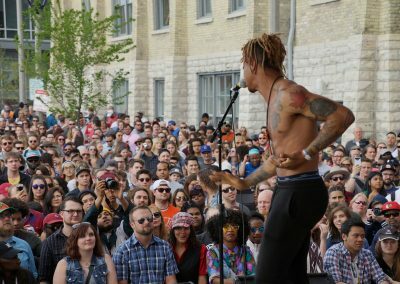 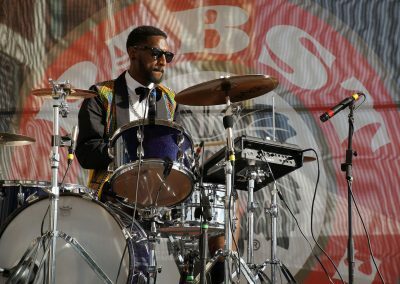 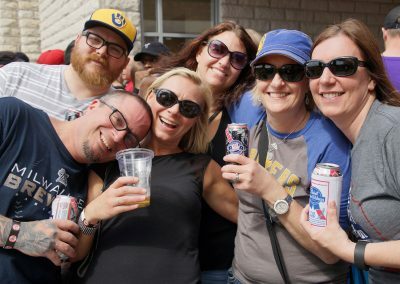 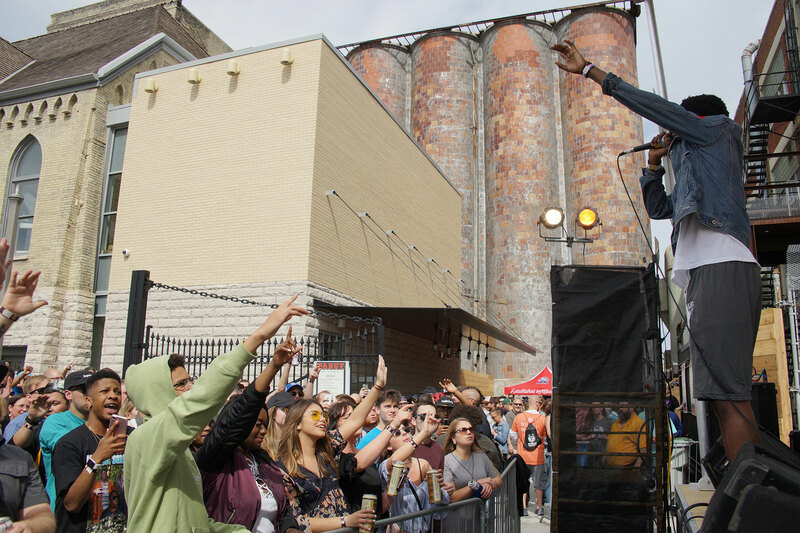 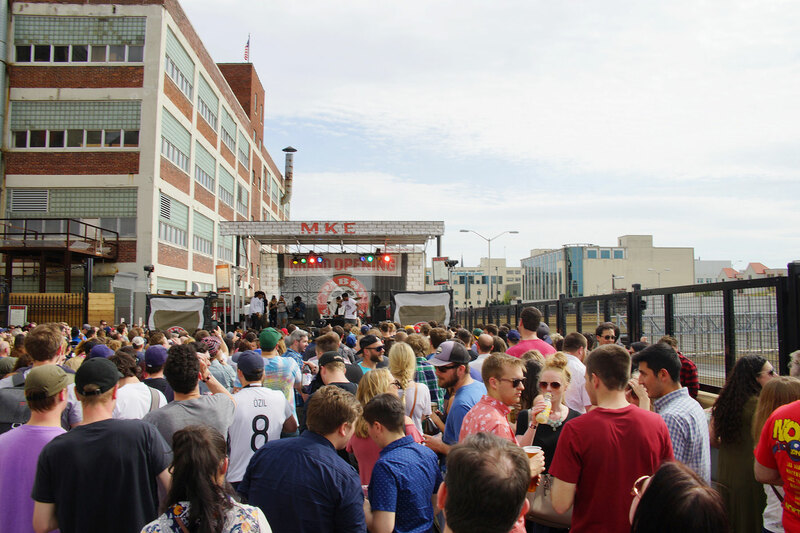 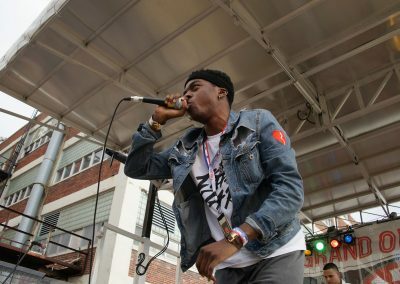 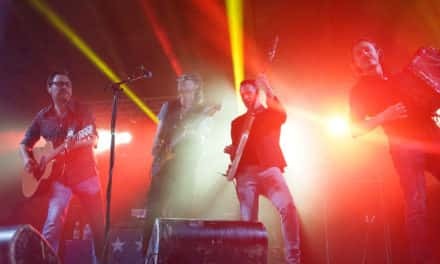 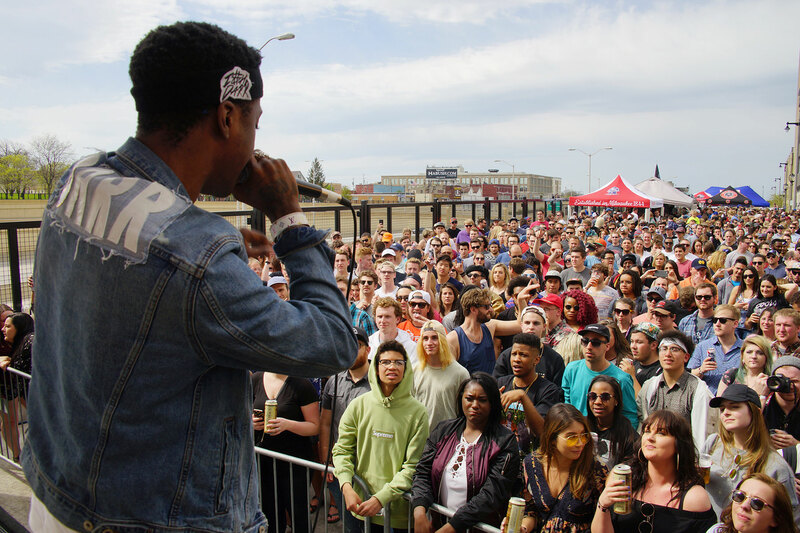 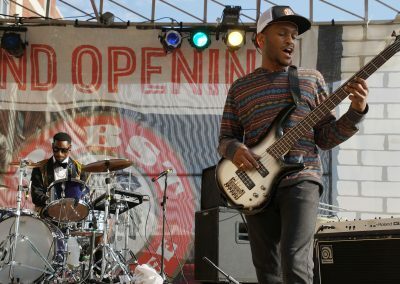 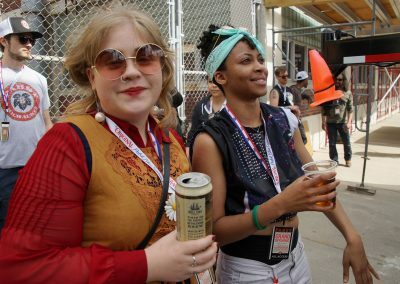 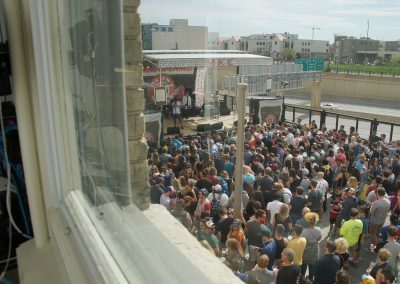 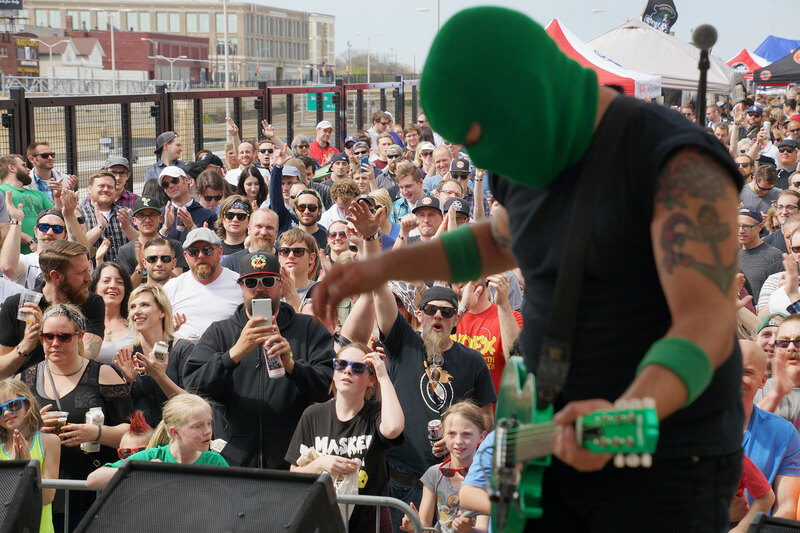 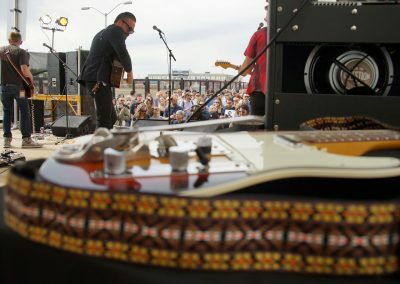 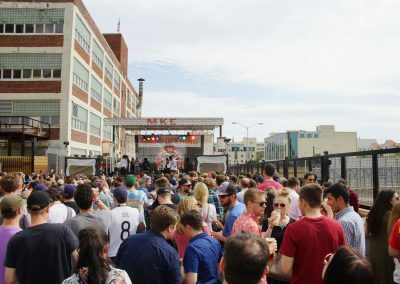 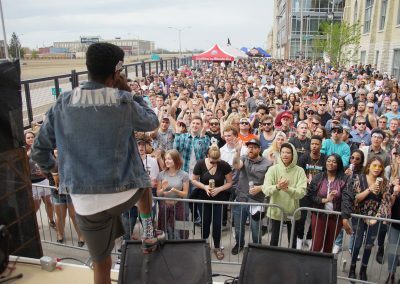 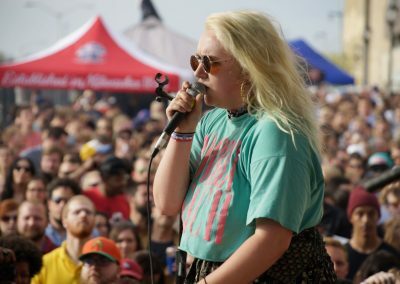 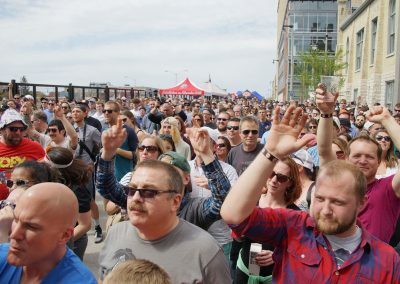 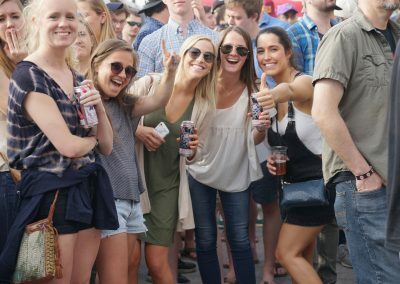 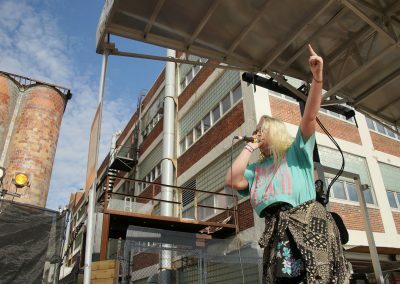 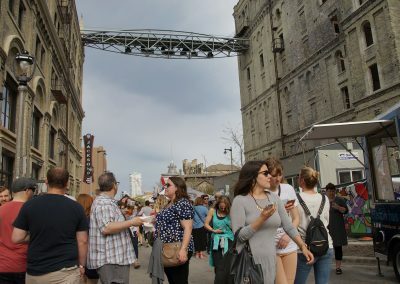 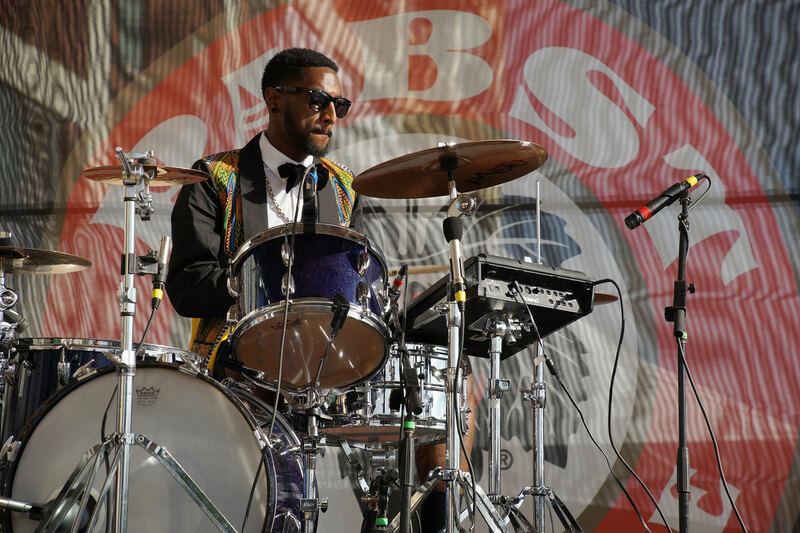 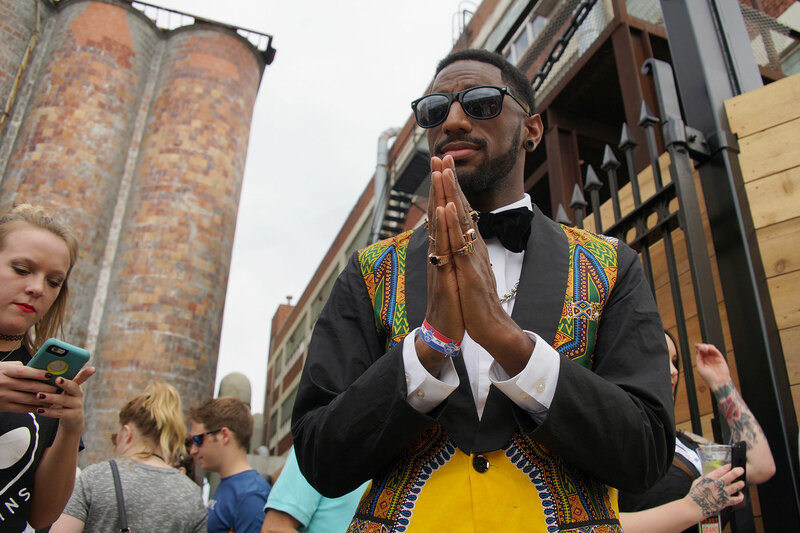 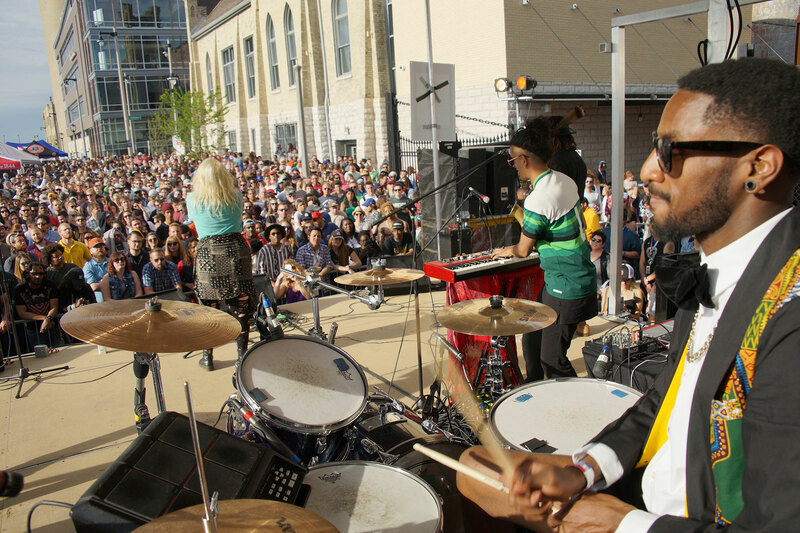 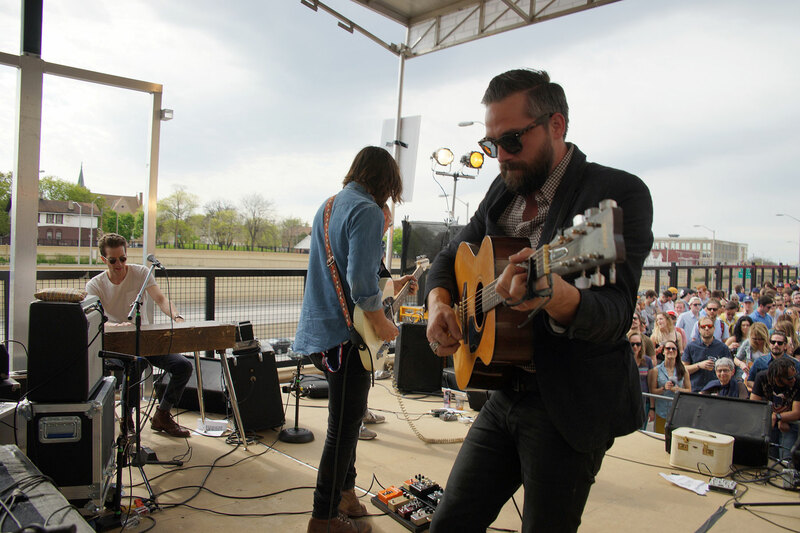 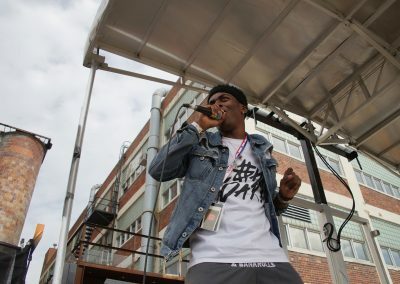 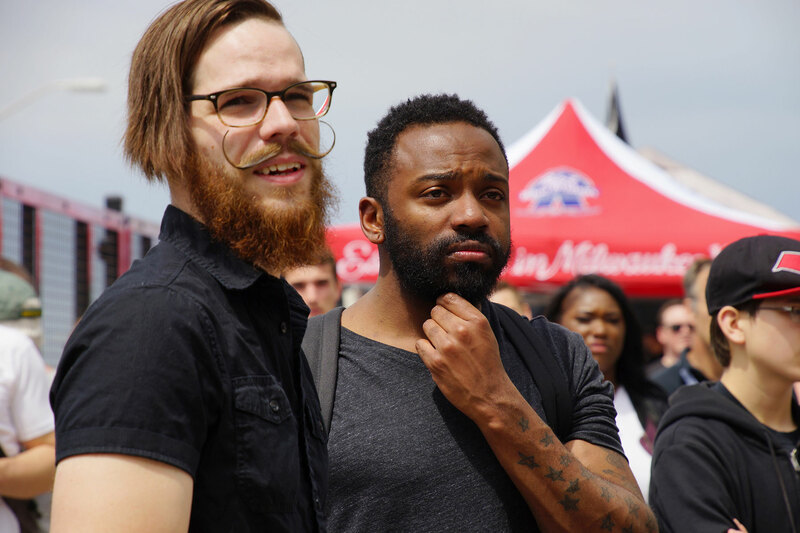 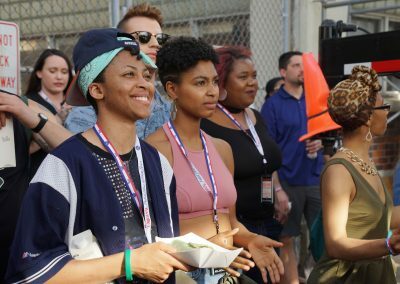 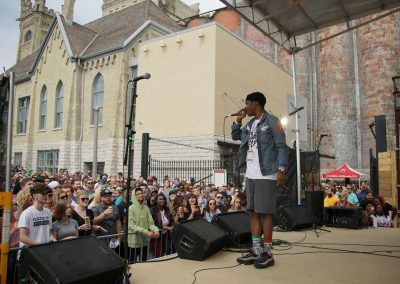 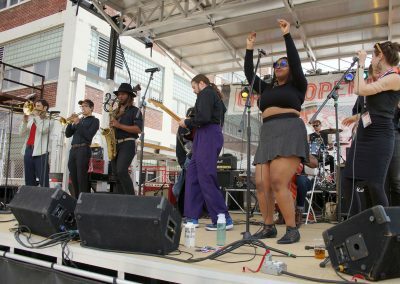 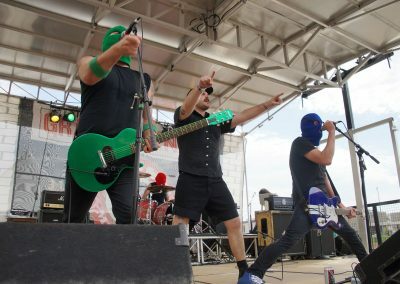 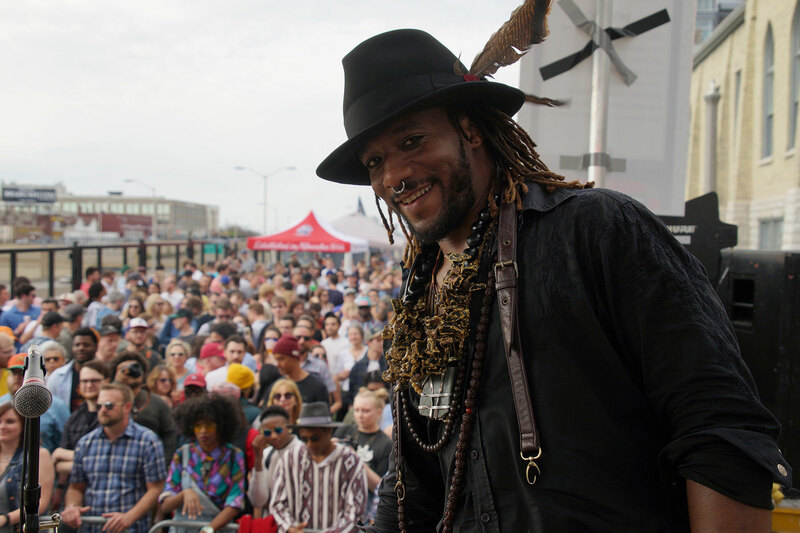 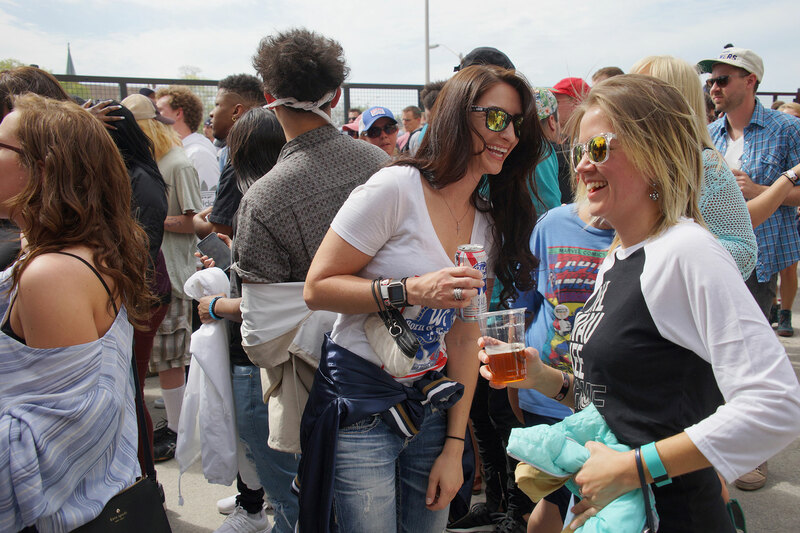 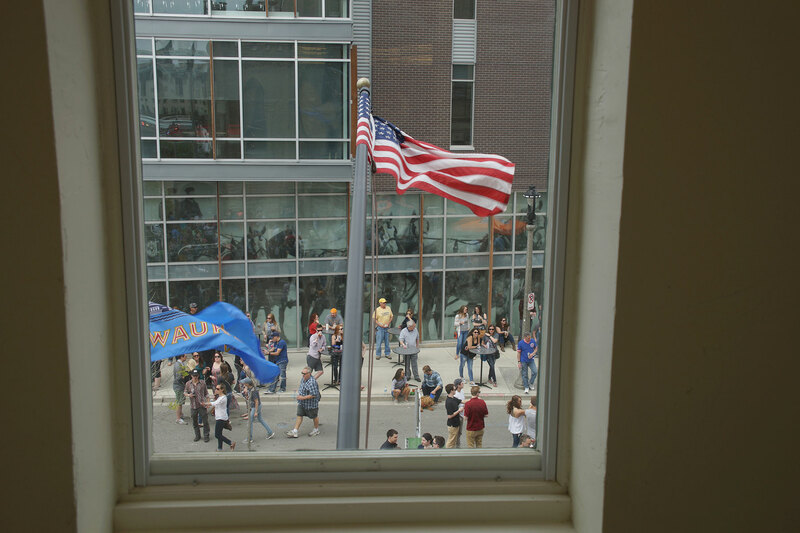 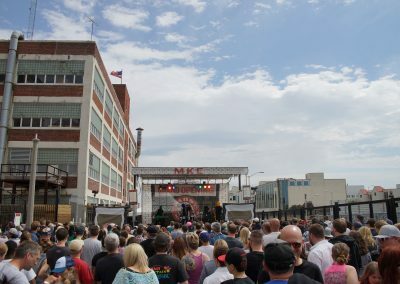 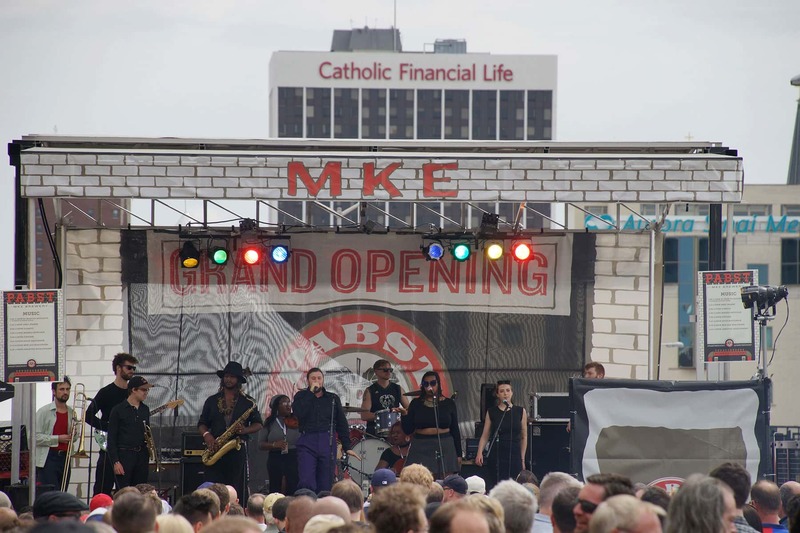 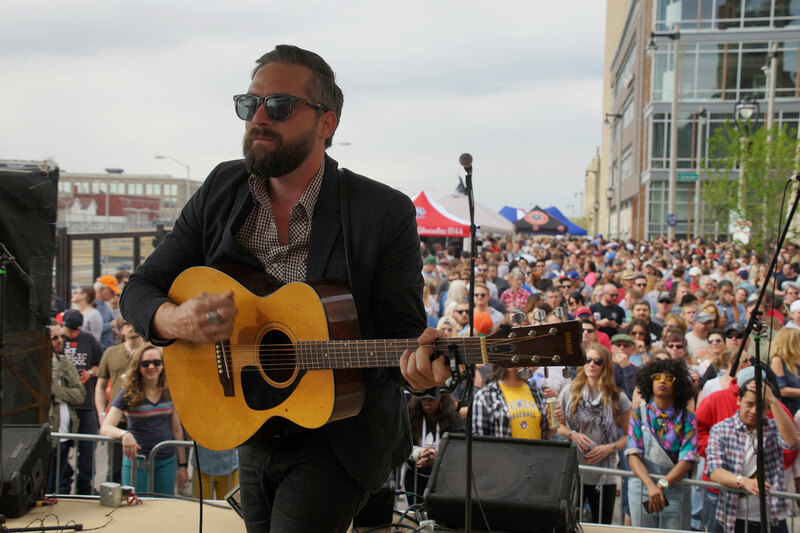 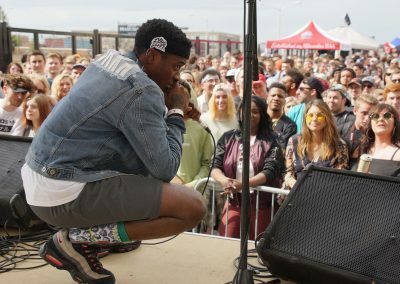 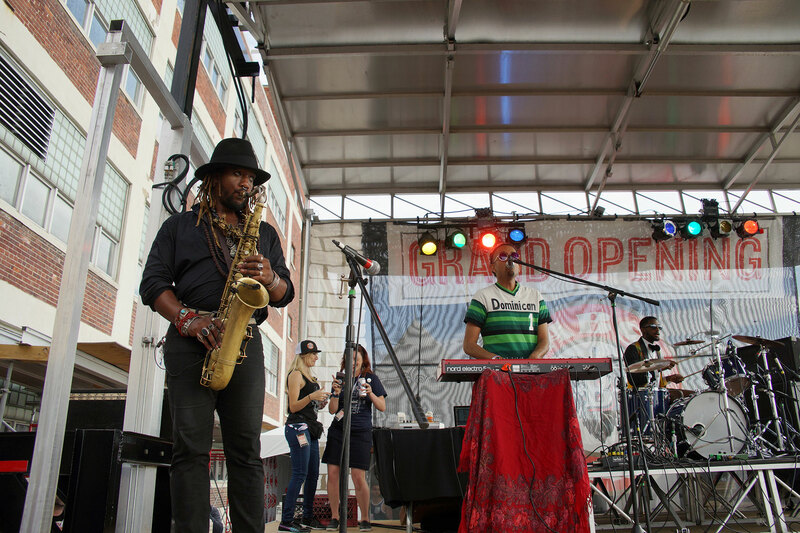 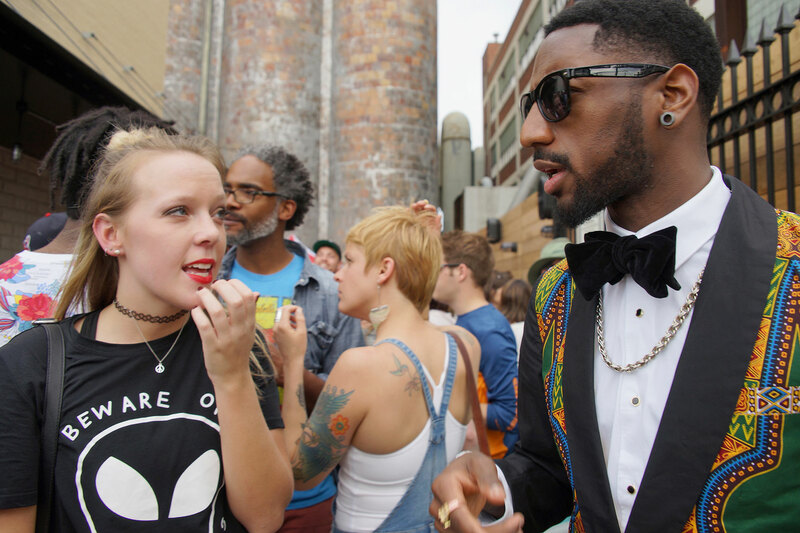 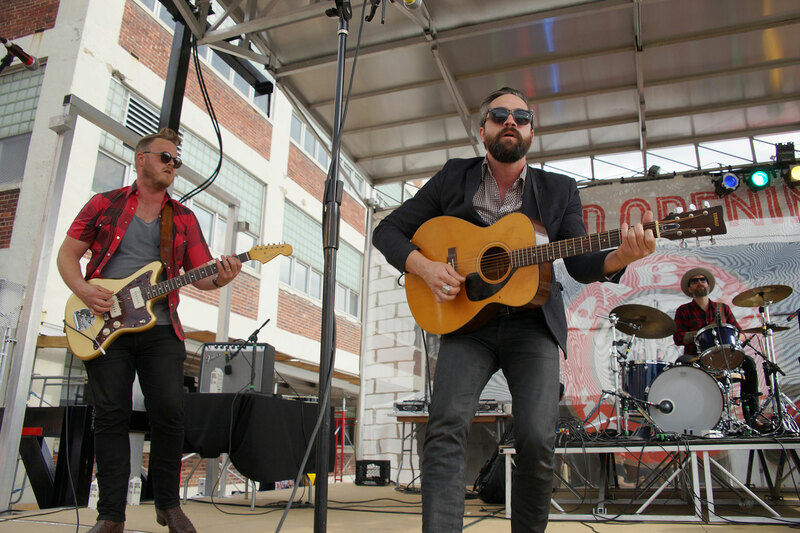 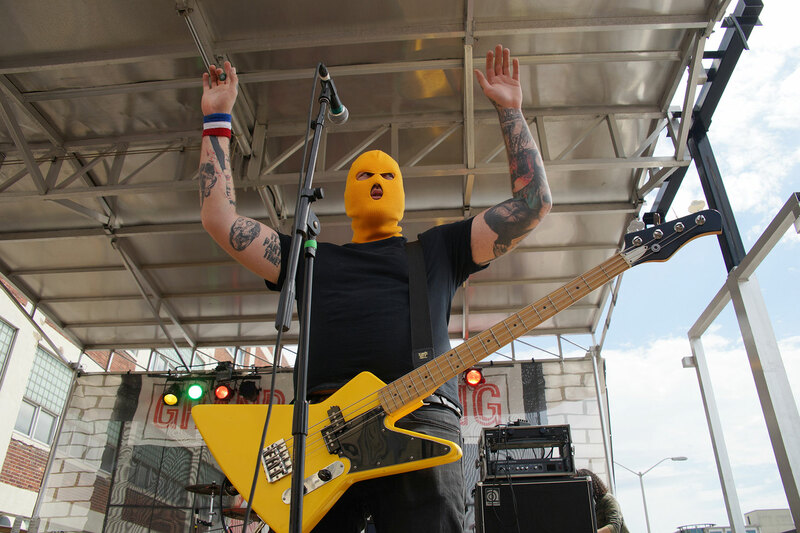 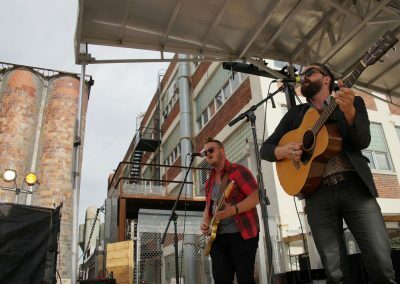 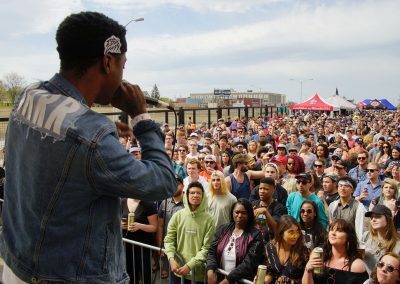 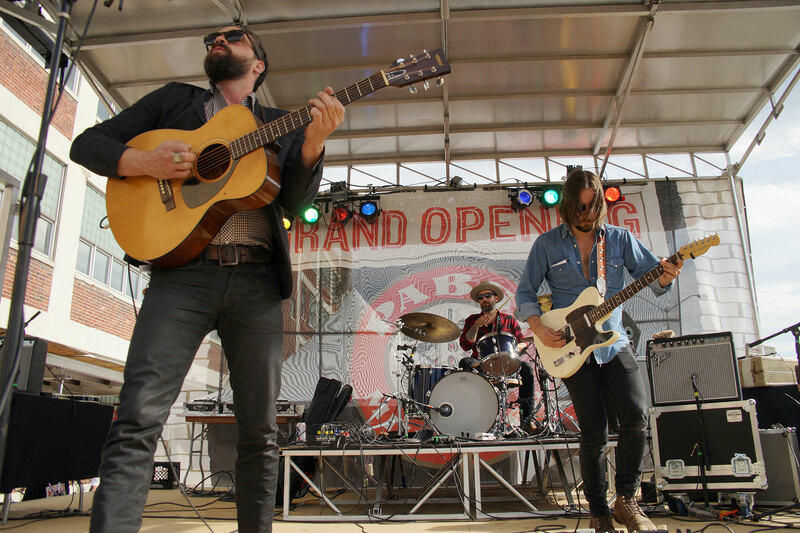 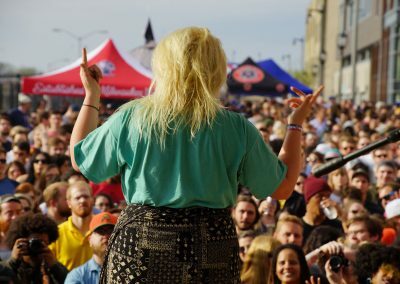 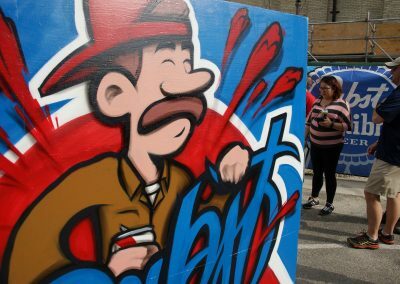 Pabst Brewery kicked off the summer music season with a street festival party to celebrate its grand opening on May 13. 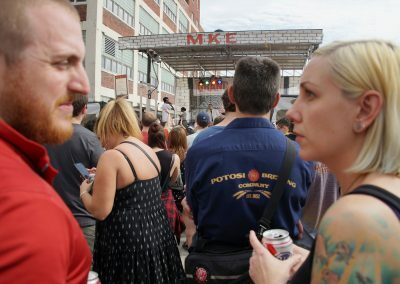 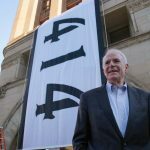 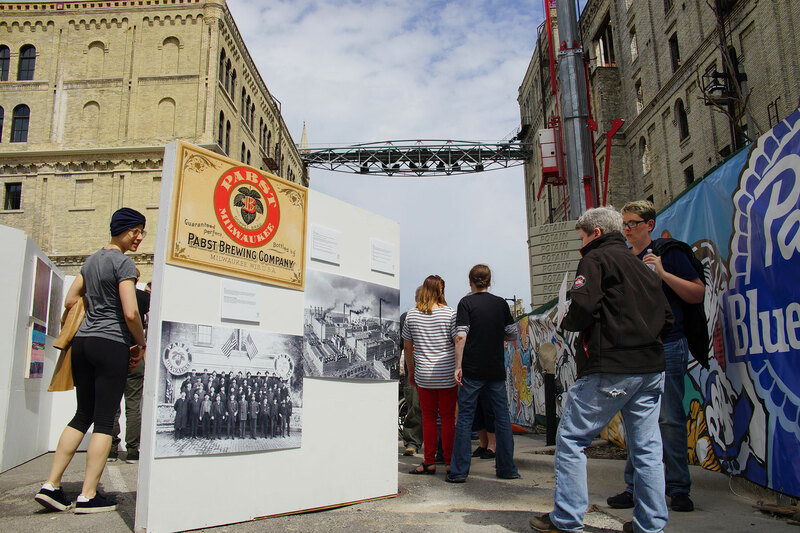 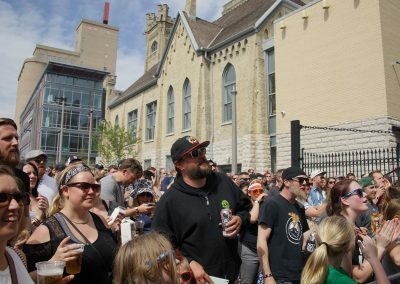 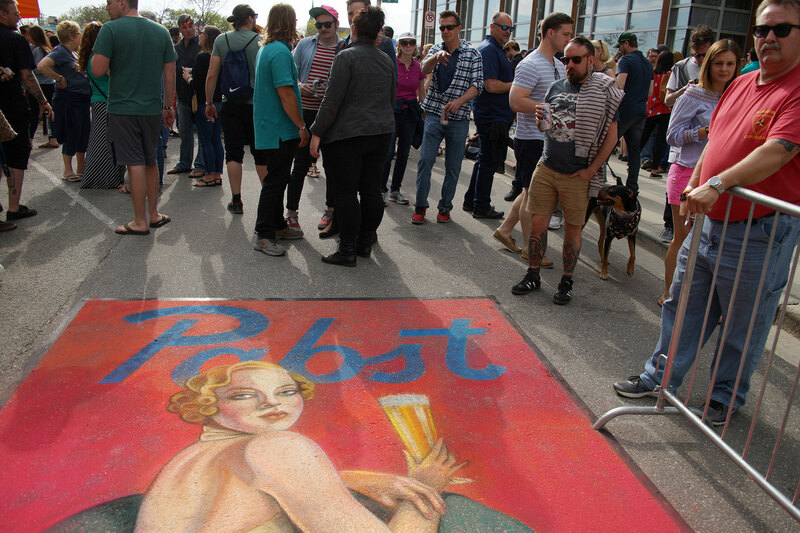 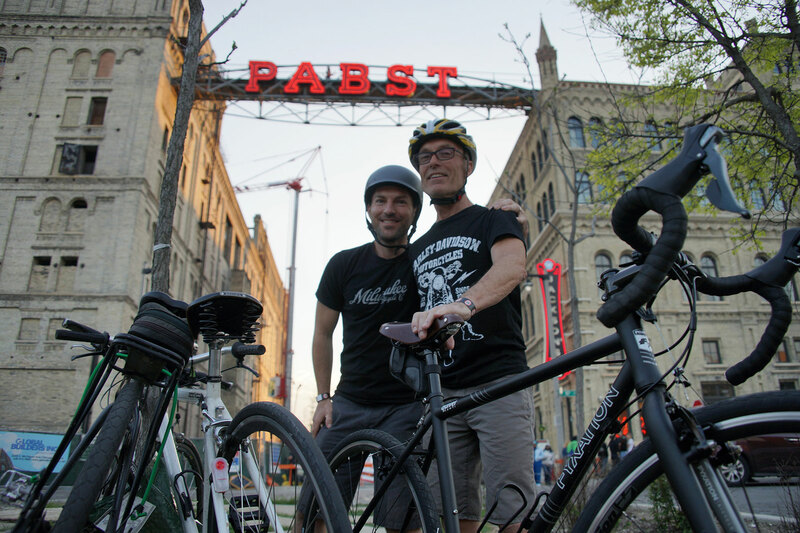 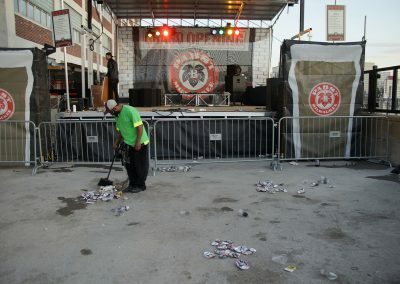 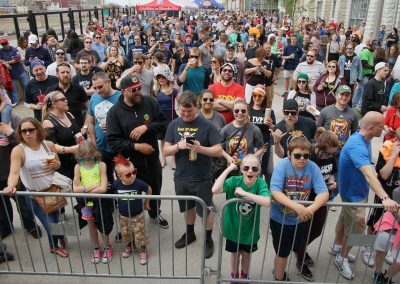 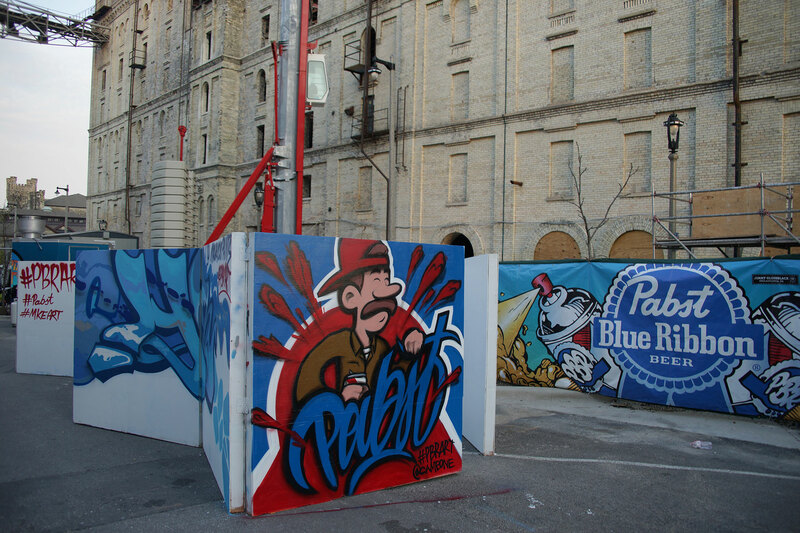 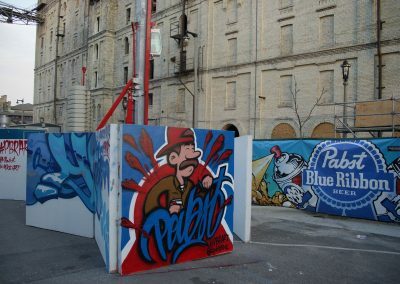 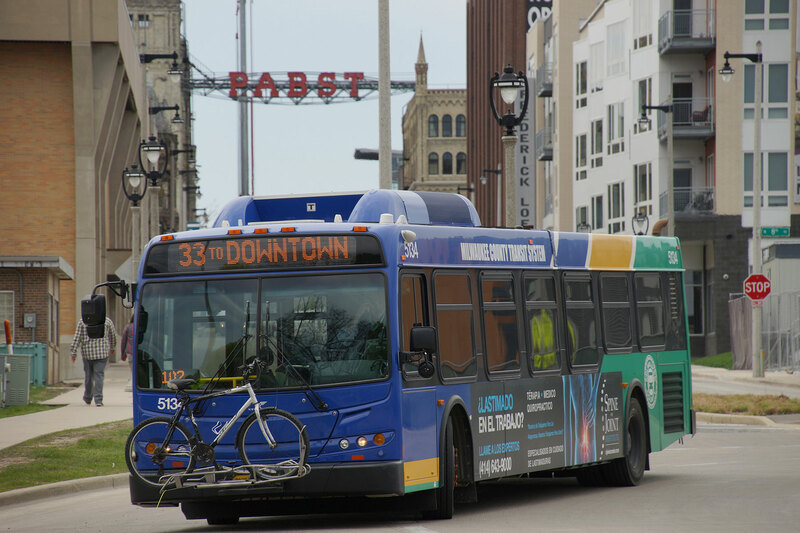 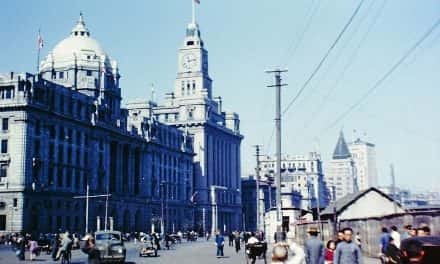 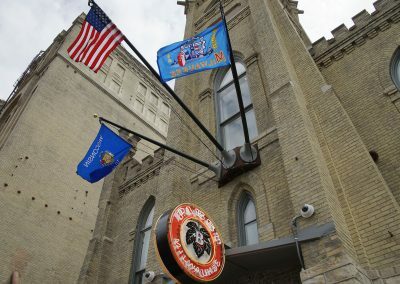 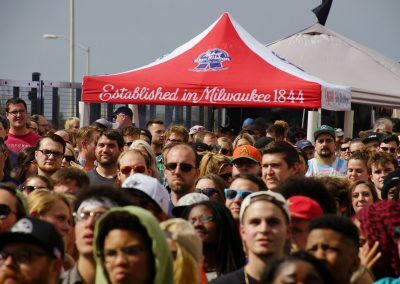 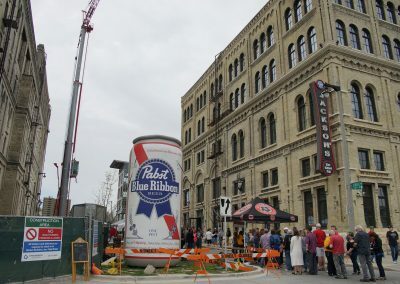 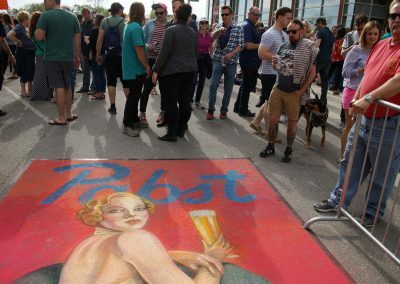 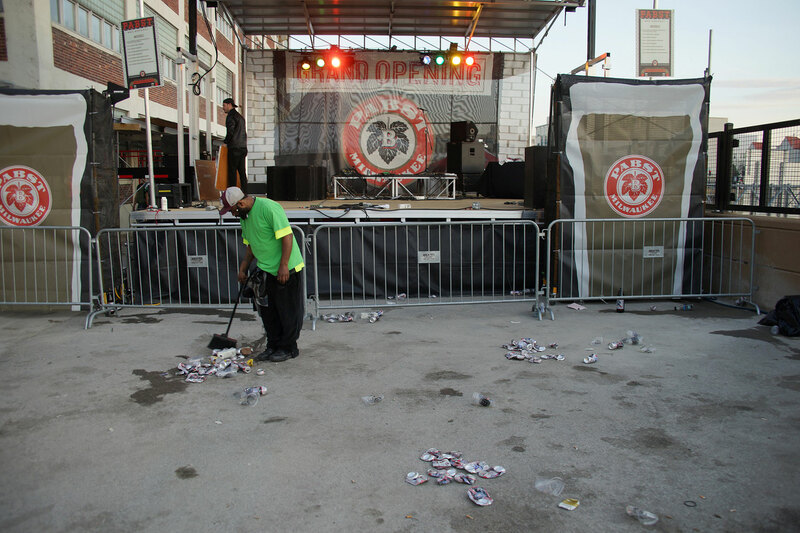 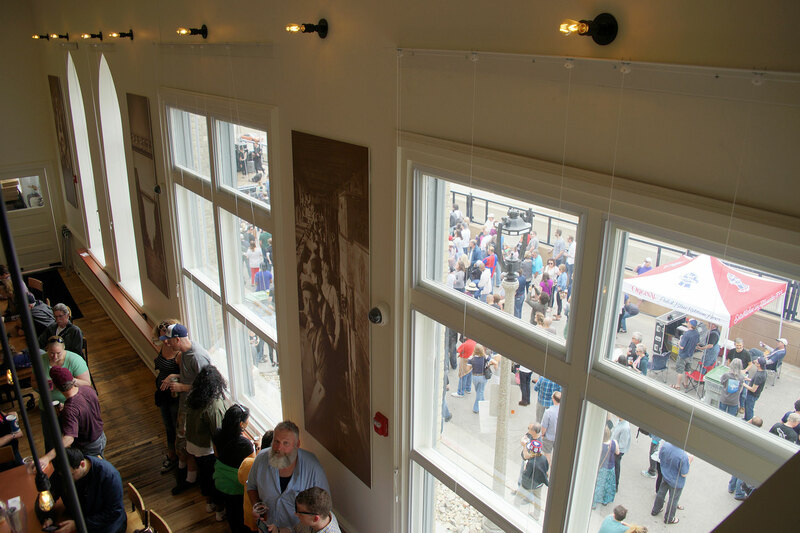 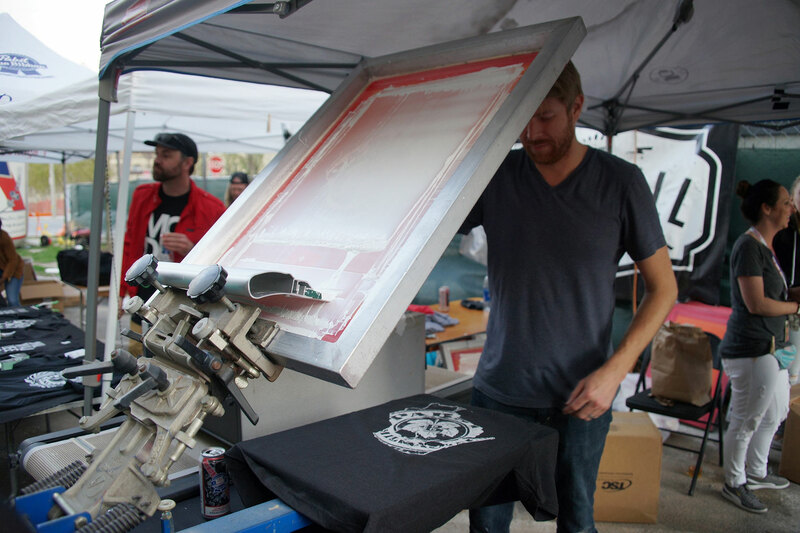 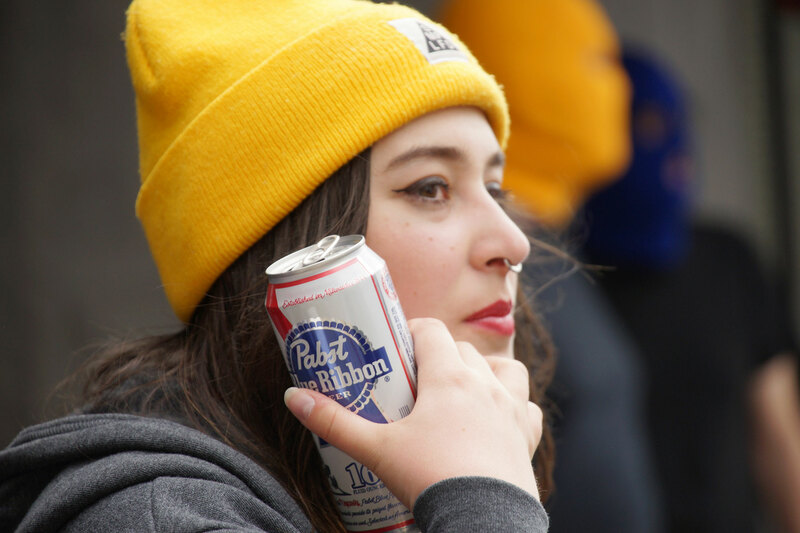 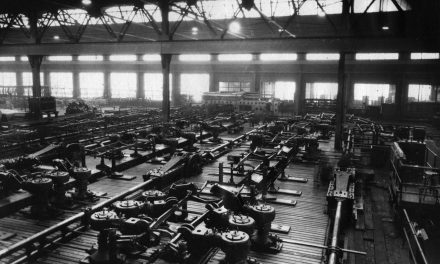 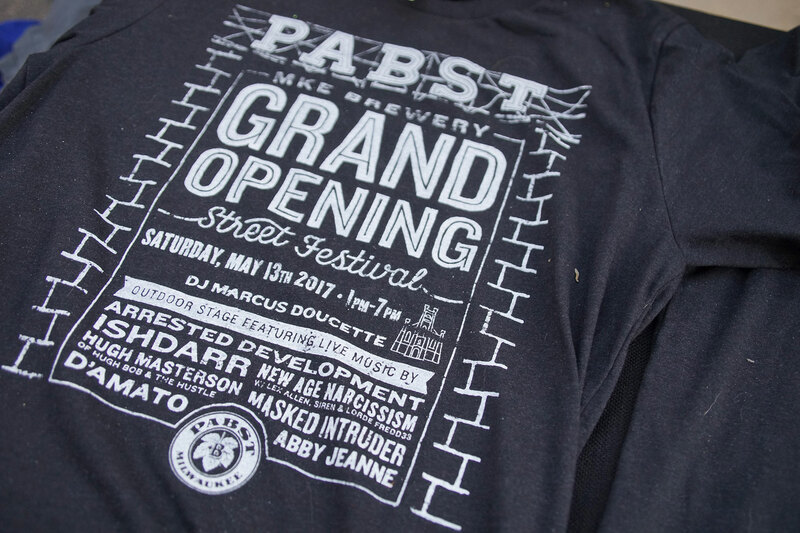 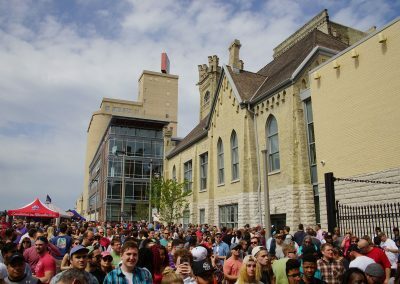 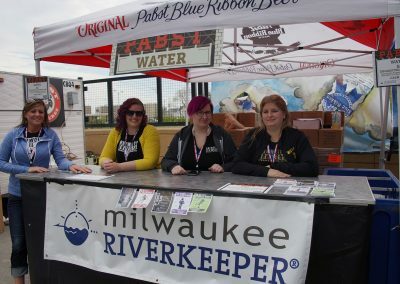 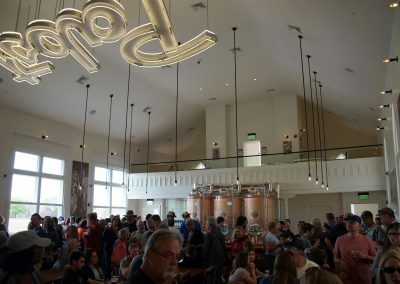 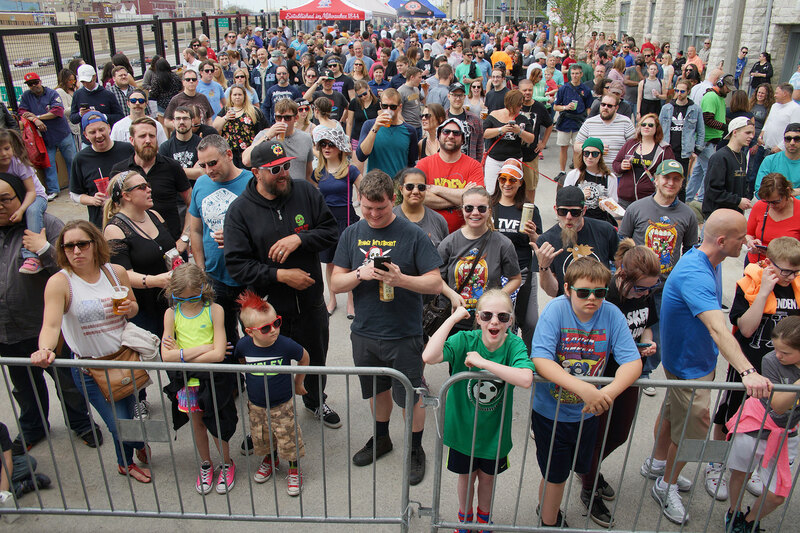 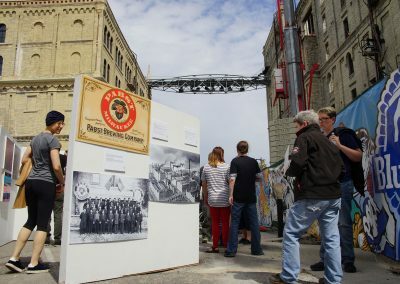 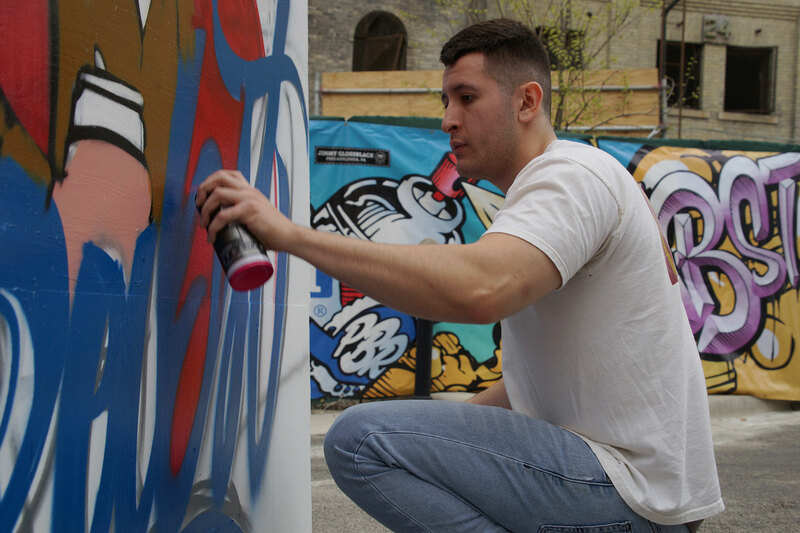 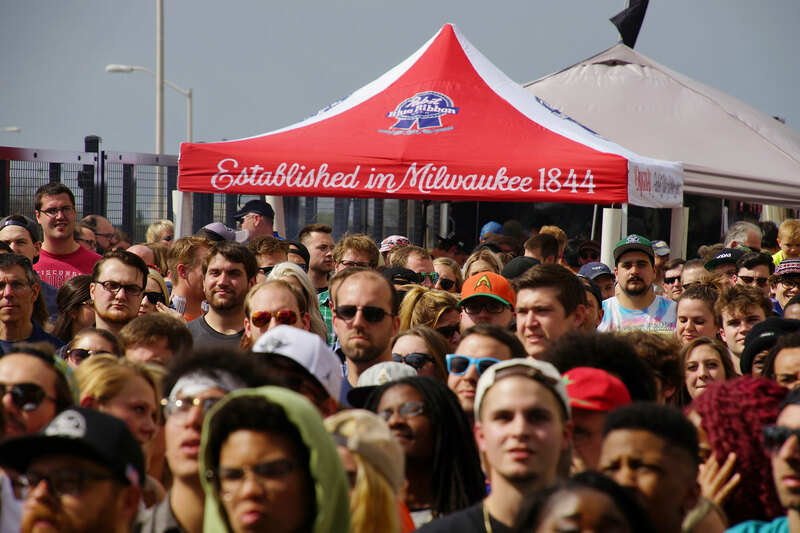 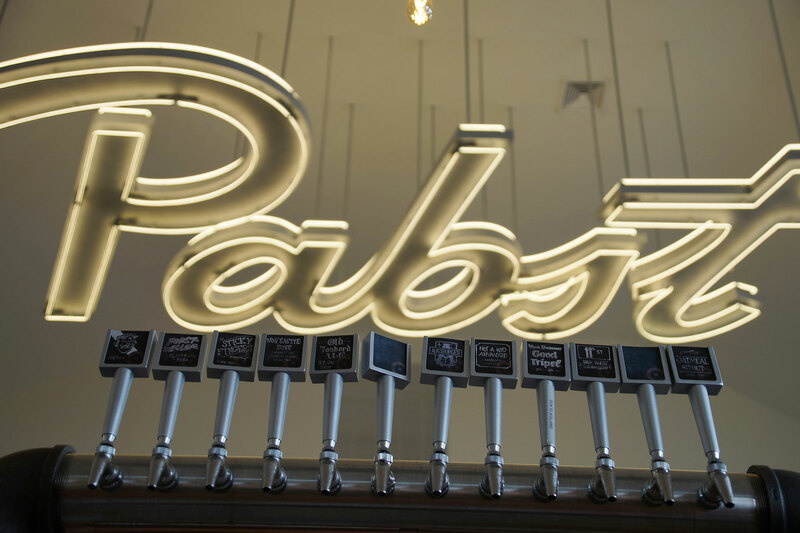 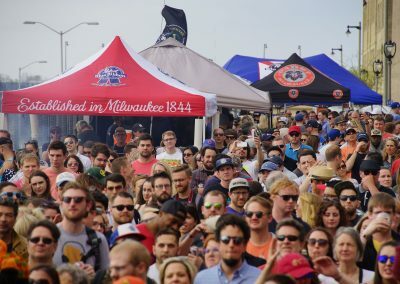 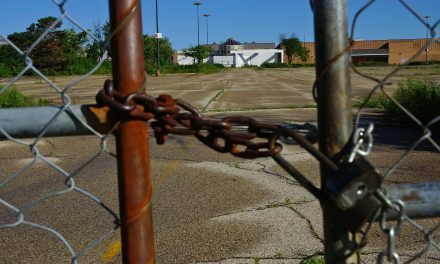 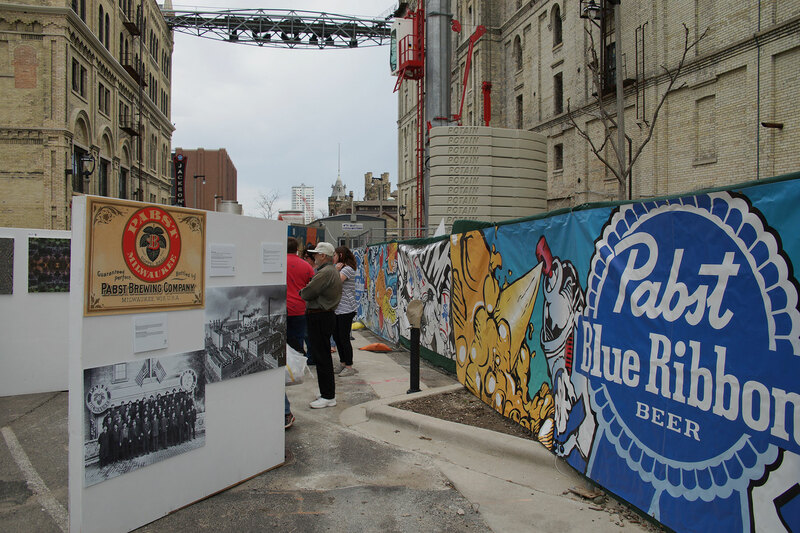 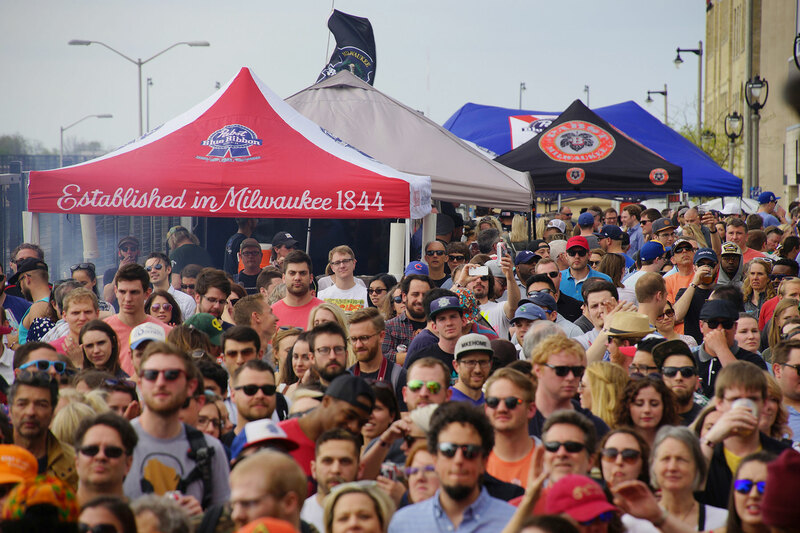 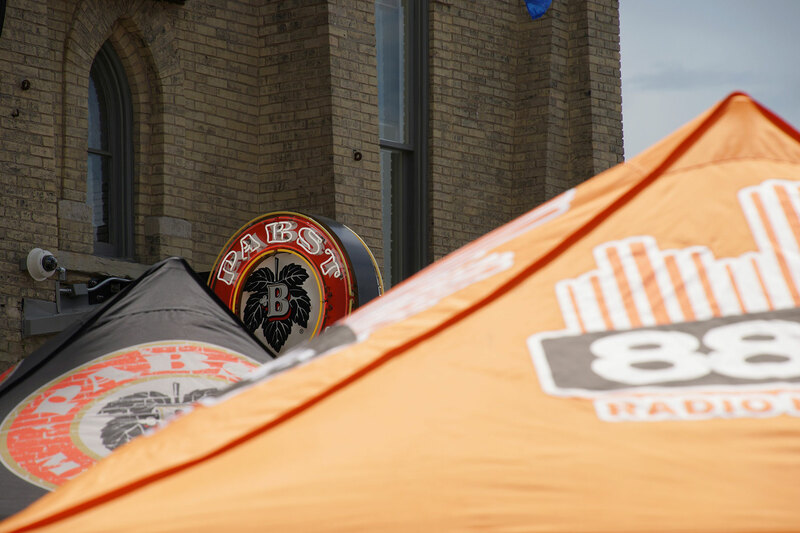 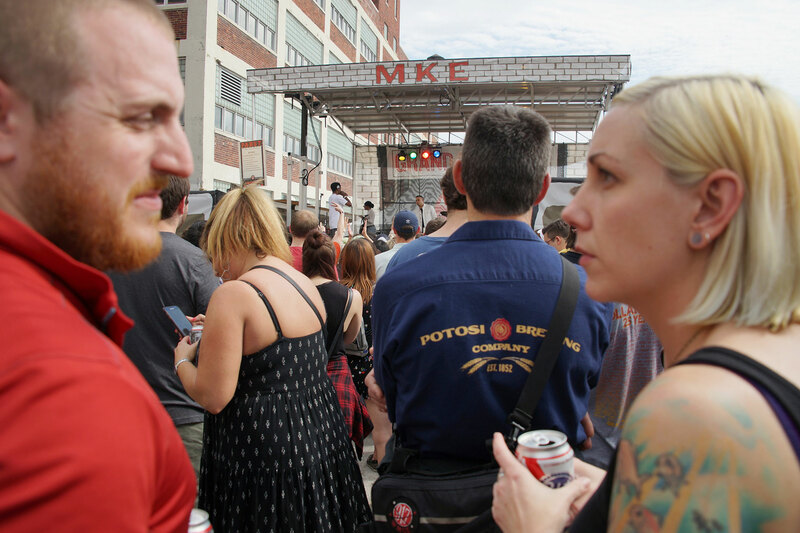 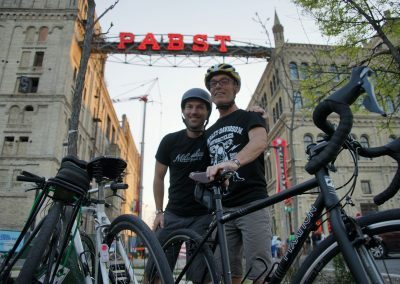 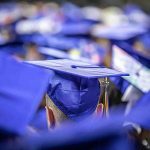 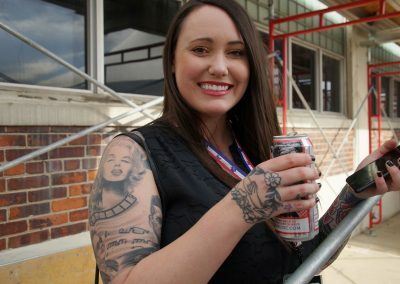 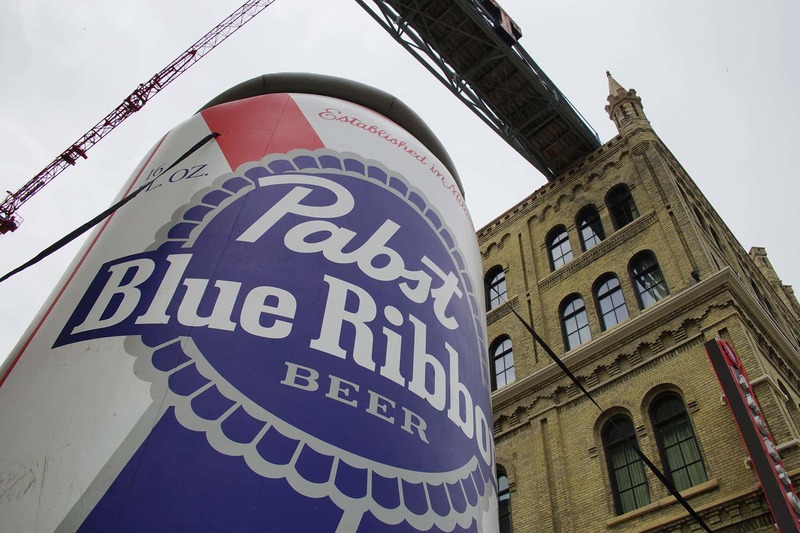 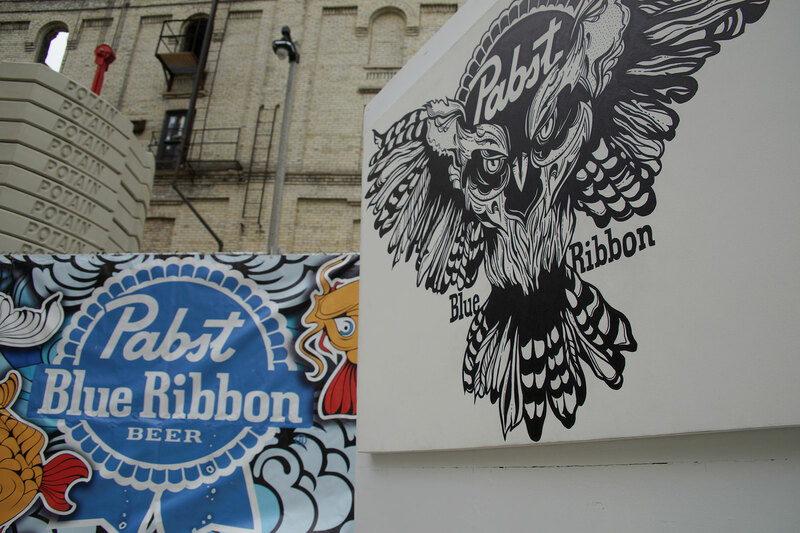 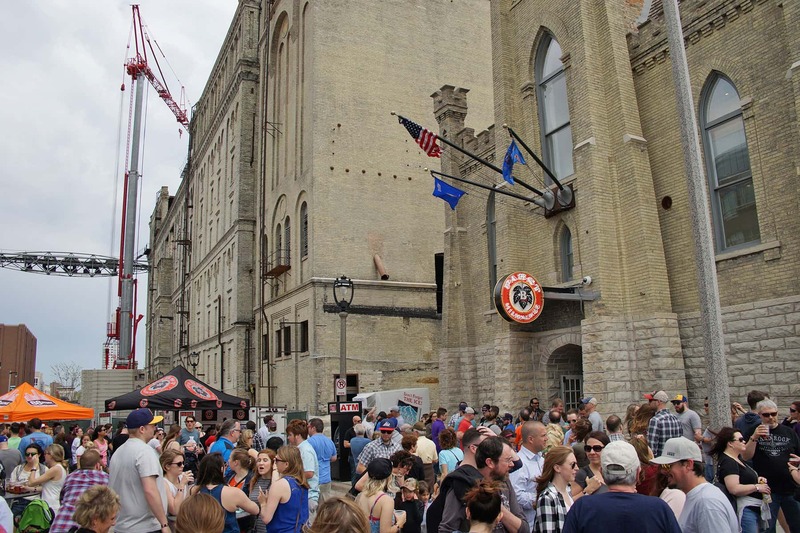 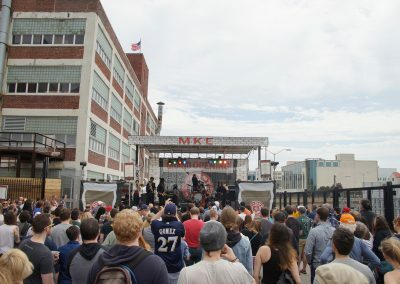 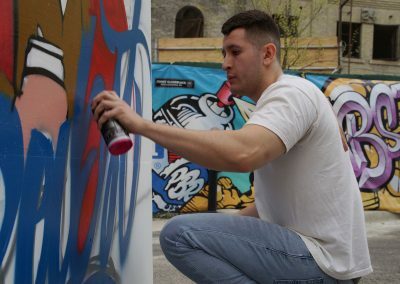 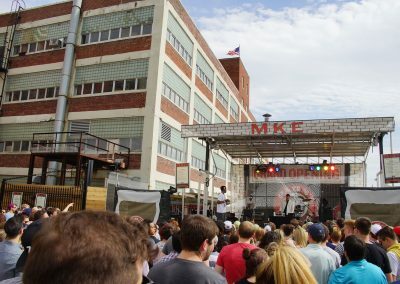 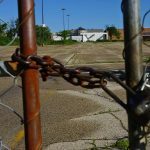 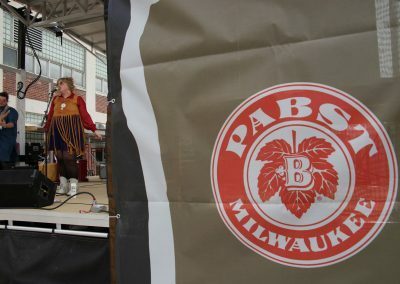 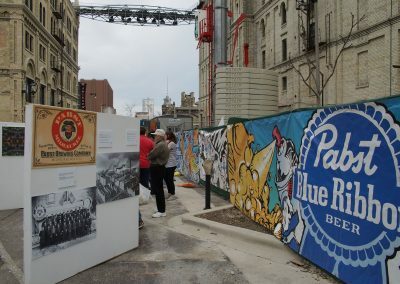 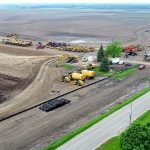 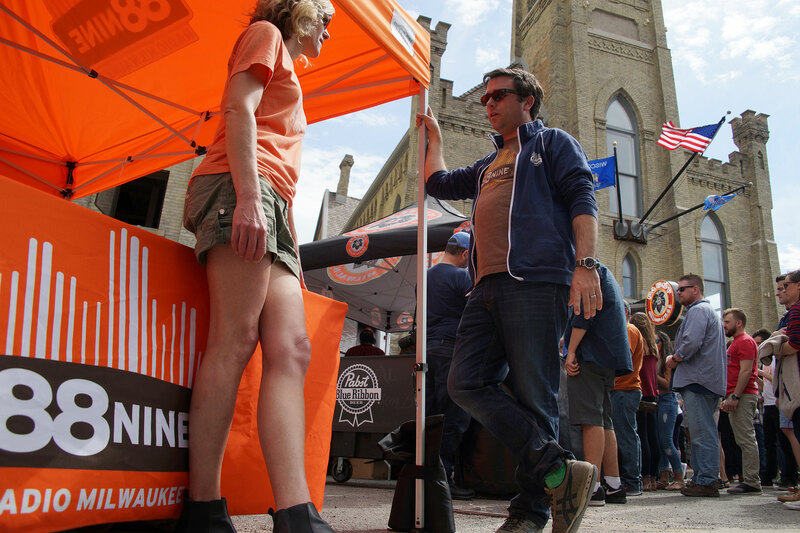 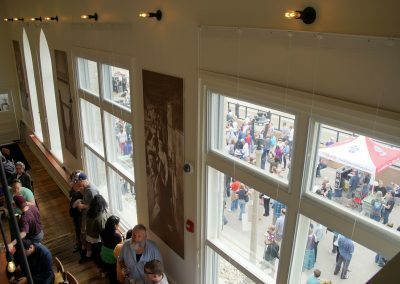 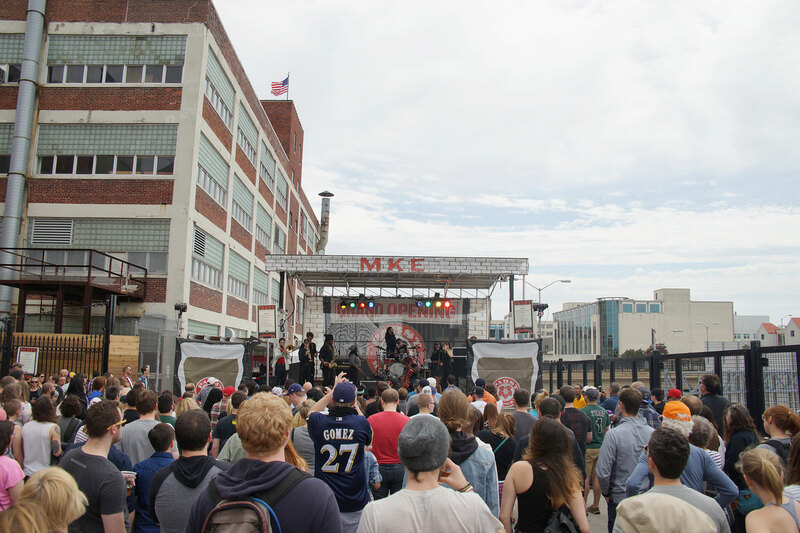 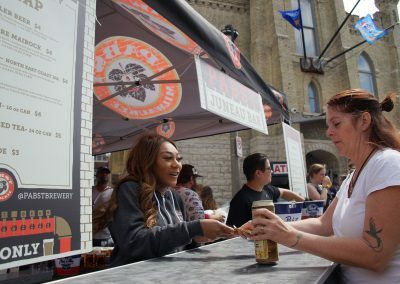 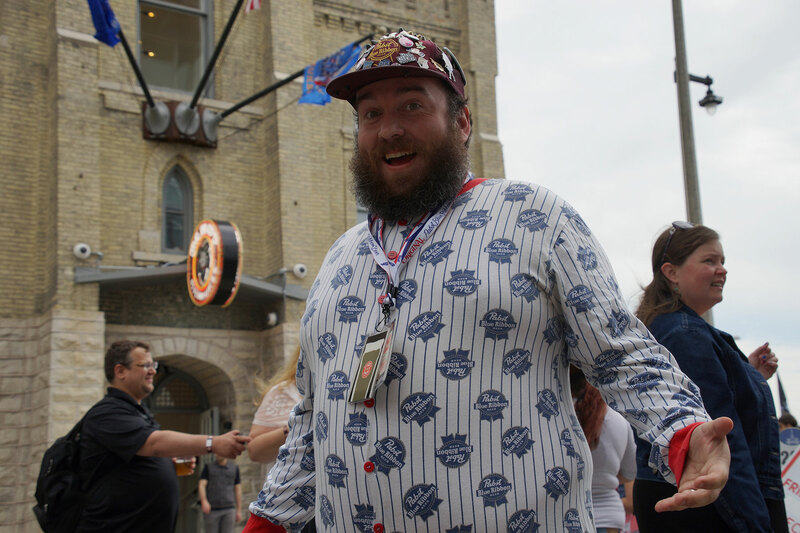 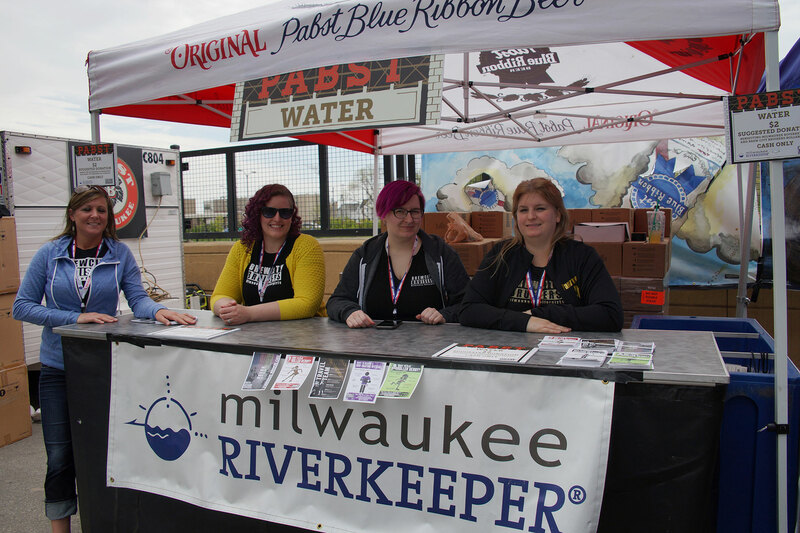 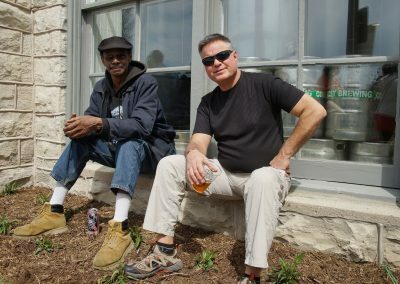 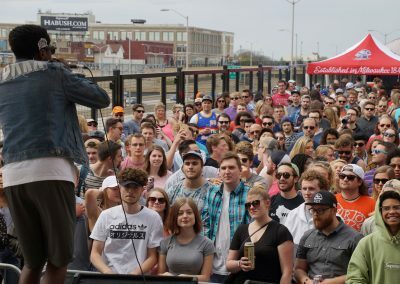 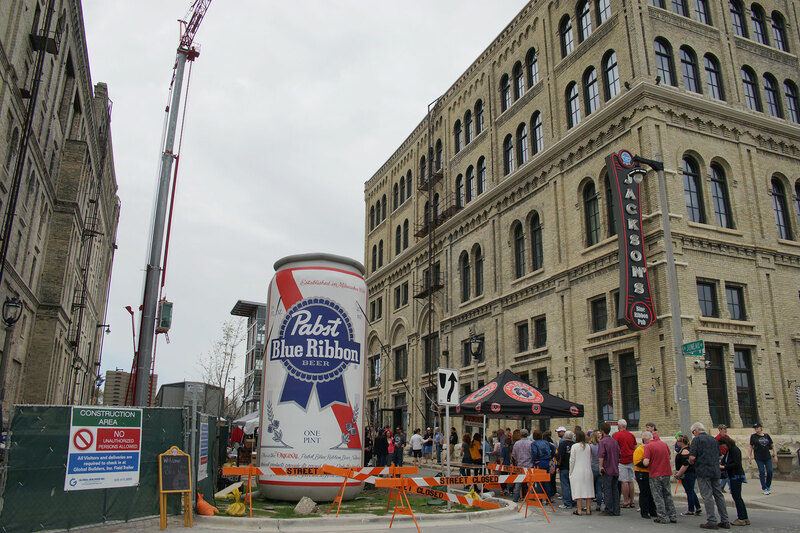 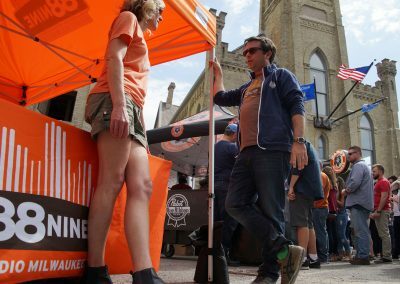 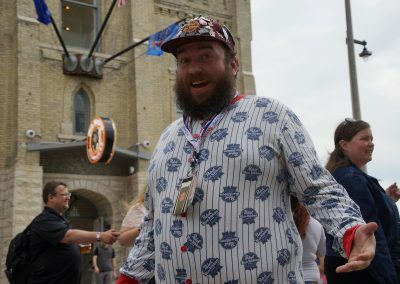 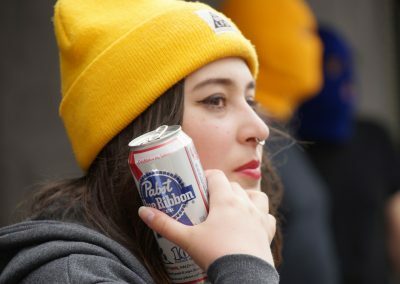 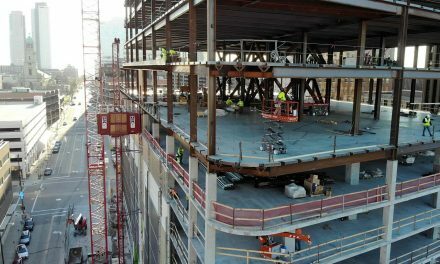 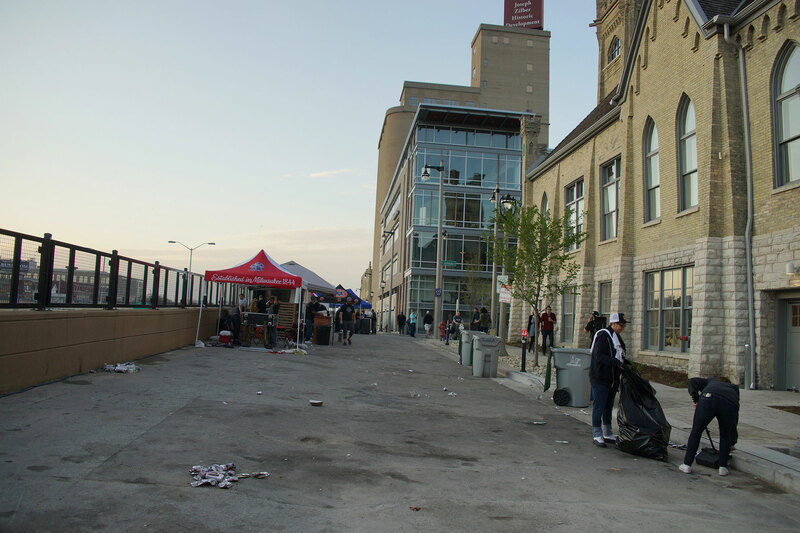 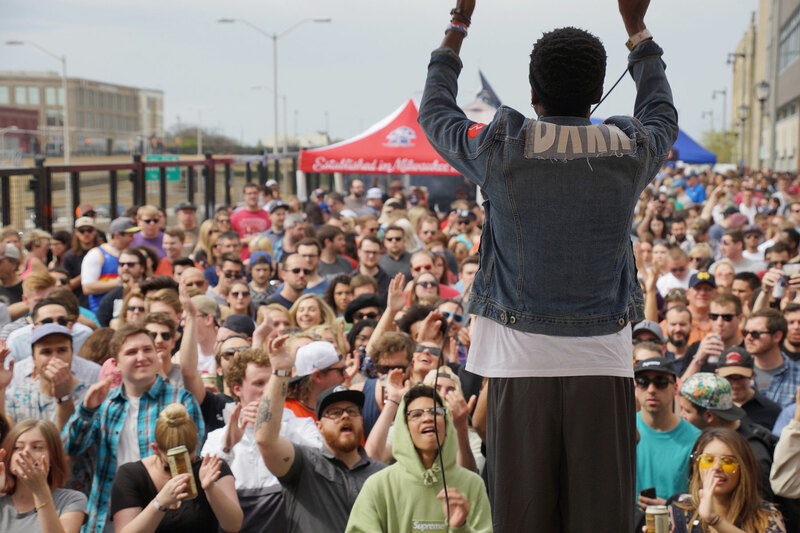 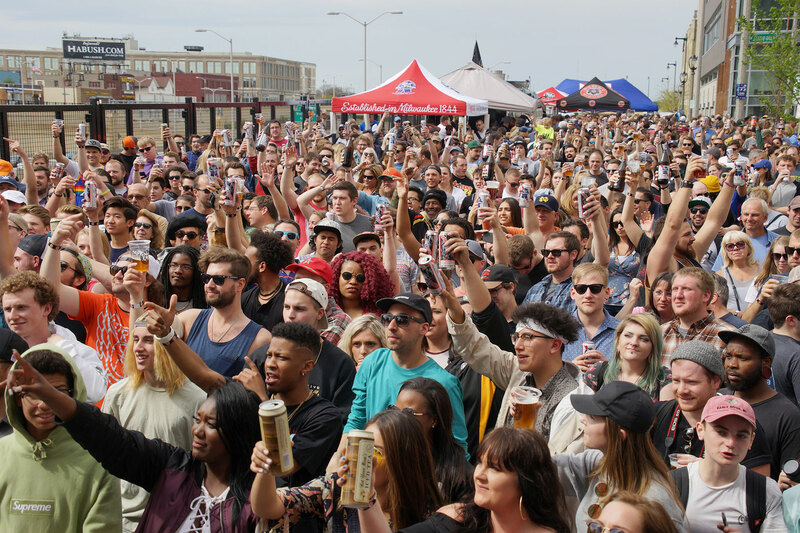 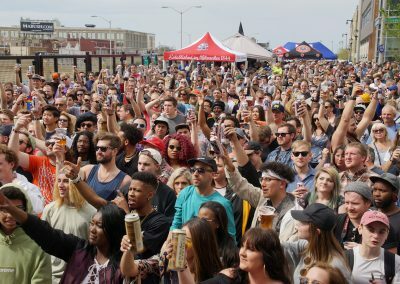 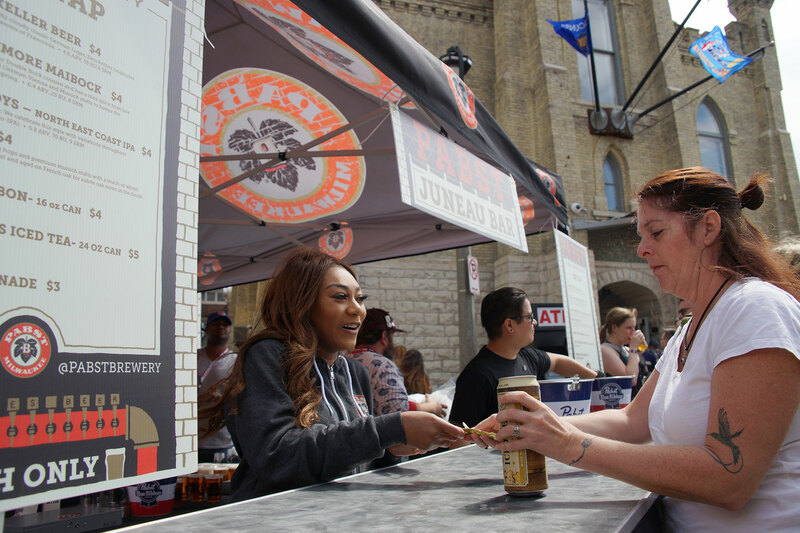 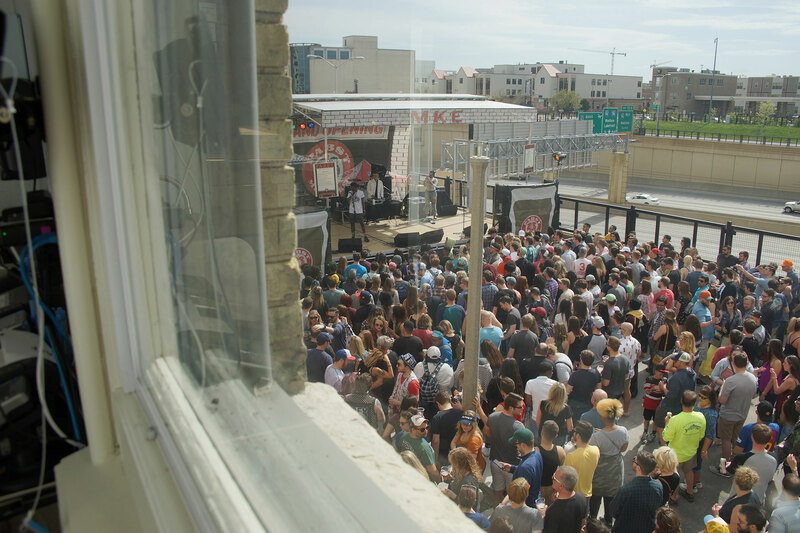 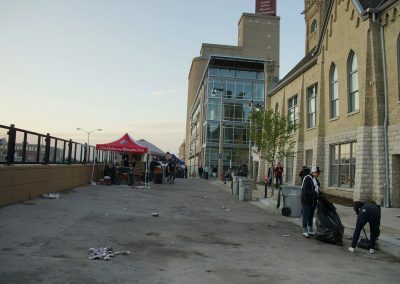 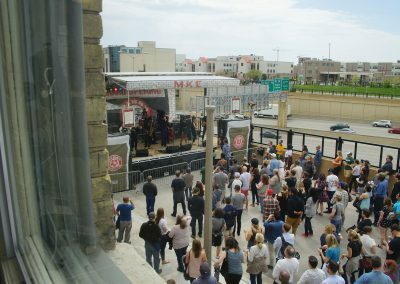 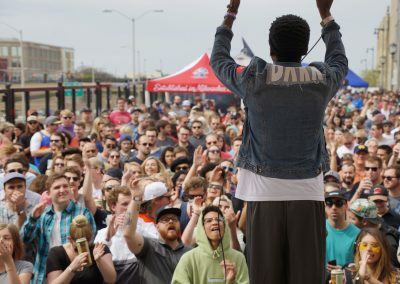 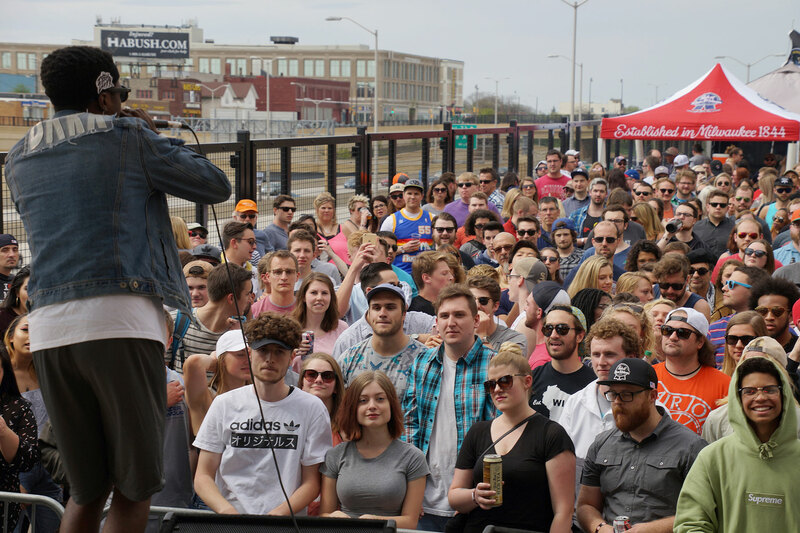 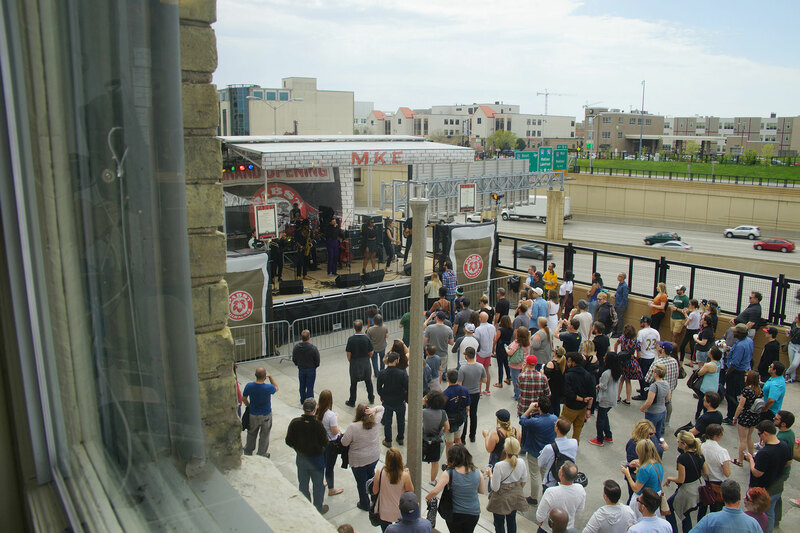 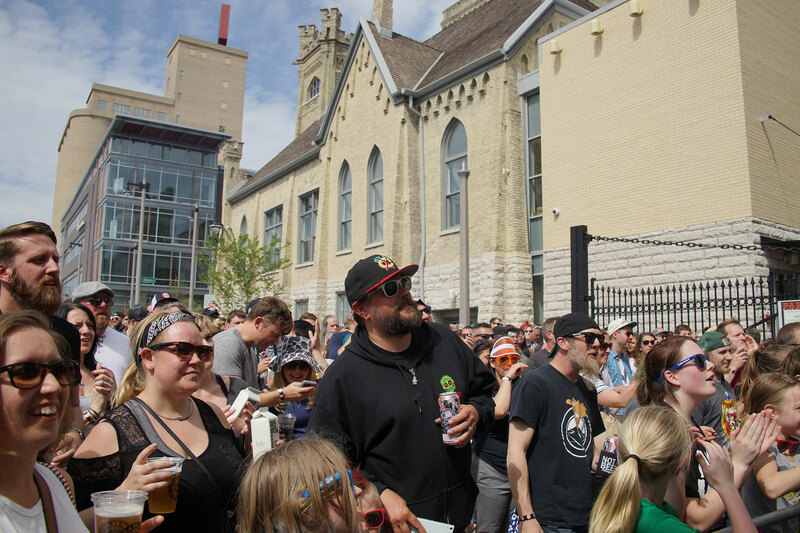 The event brought thousands to the all day event, at a location that had been abandoned for years until Pabst returned to Milwaukee with its craft beer operation. 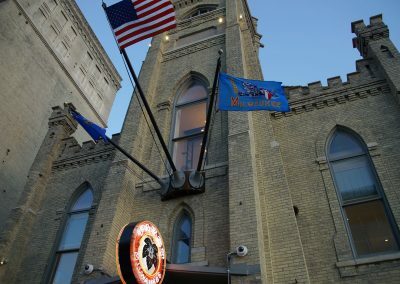 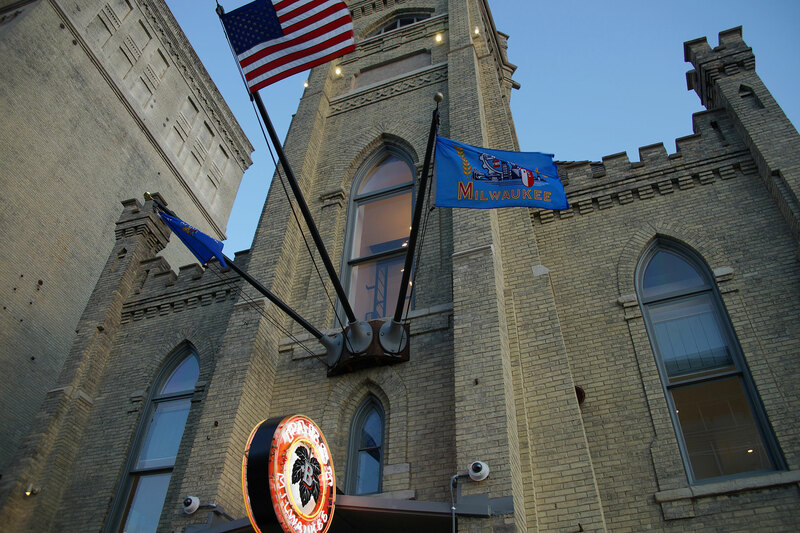 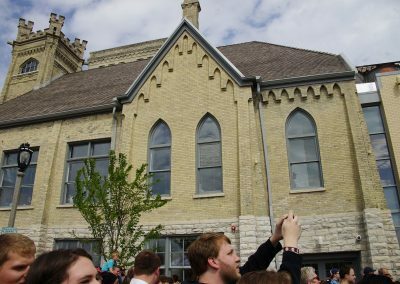 The brewery is located in a historic 144-year old building in the heart of the original Pabst Brewing complex in the former First German Methodist Church at 1037 W. Juneau Avenue. 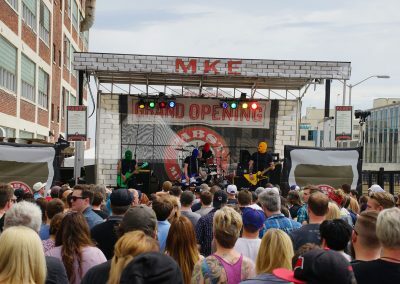 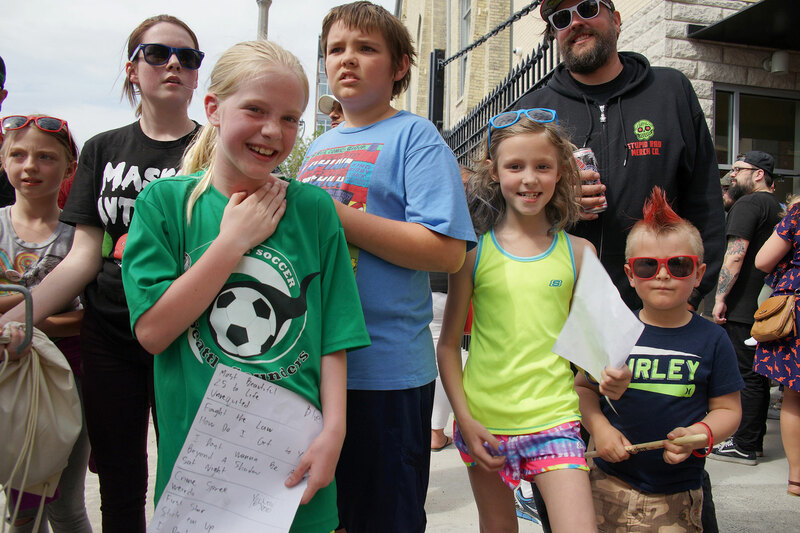 The grand opening street festival was held on Juneau Avenue between 10th and 11th streets and the adjoining area around the brewery. 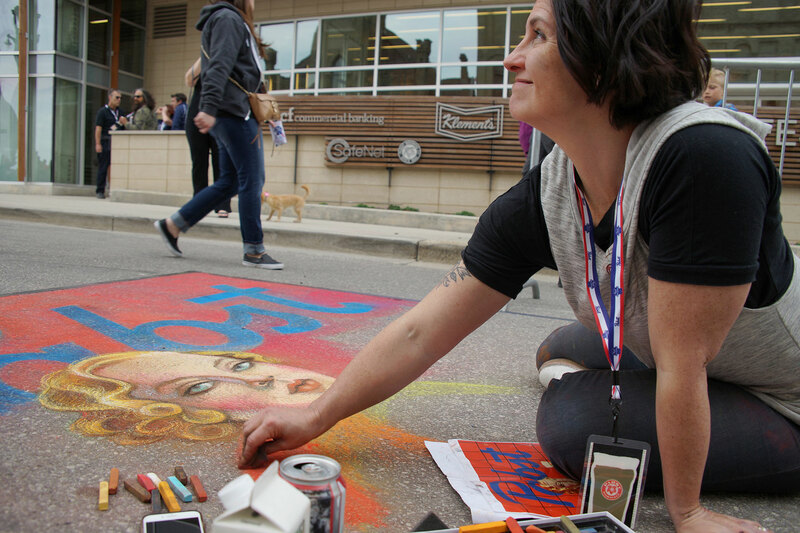 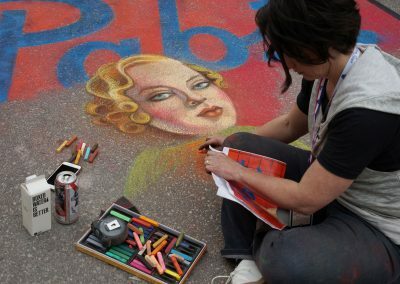 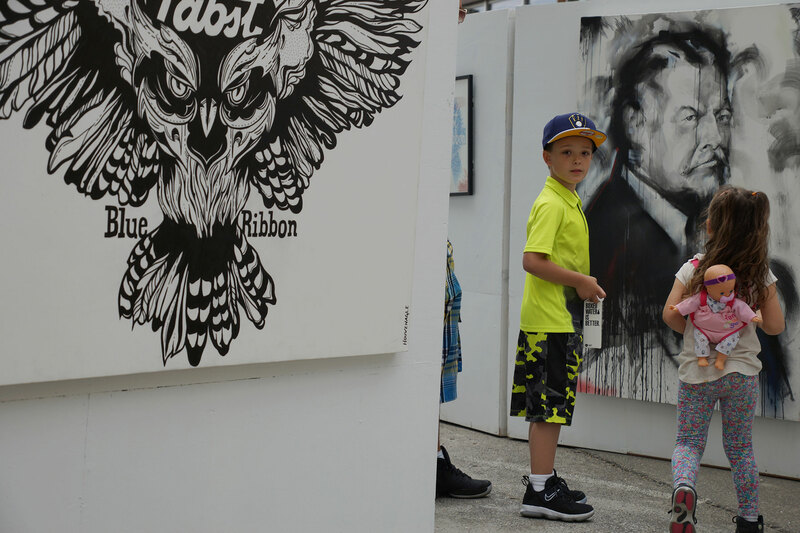 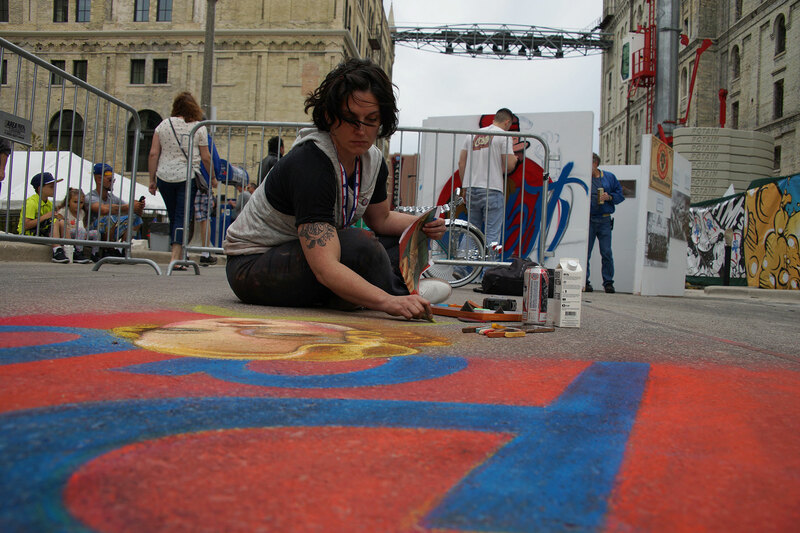 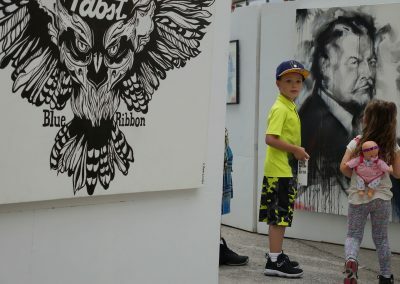 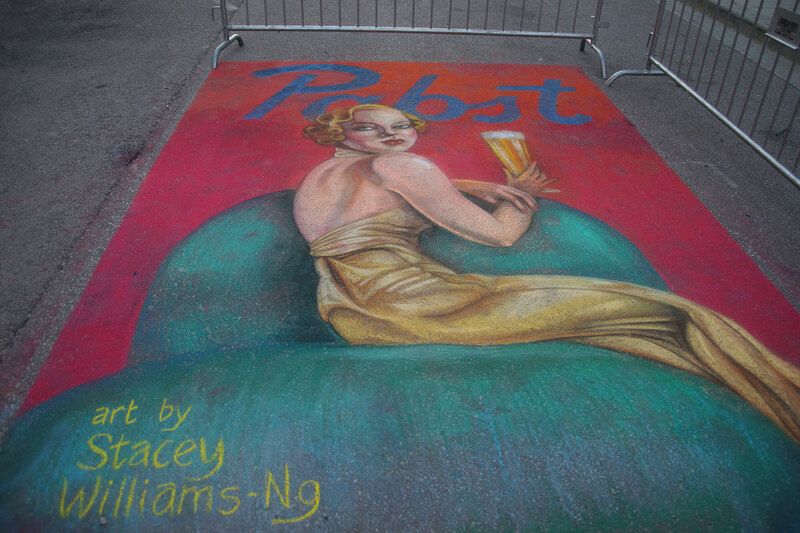 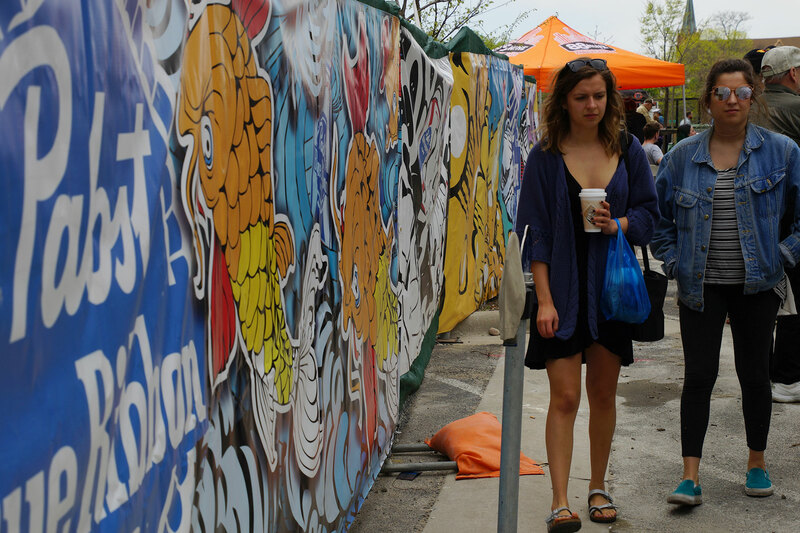 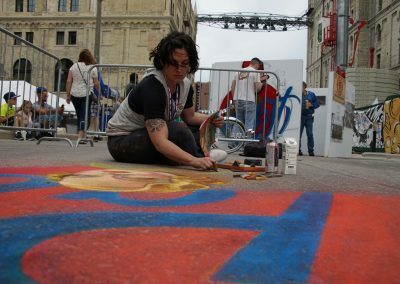 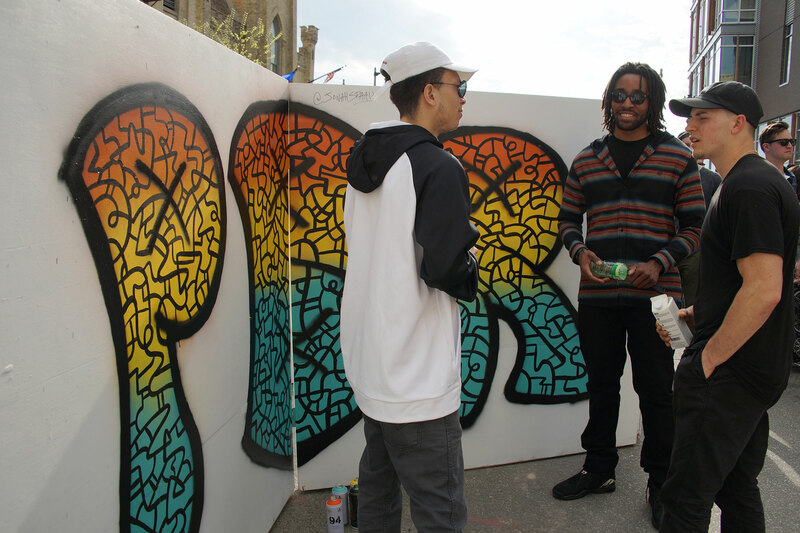 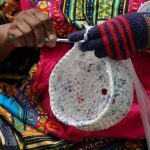 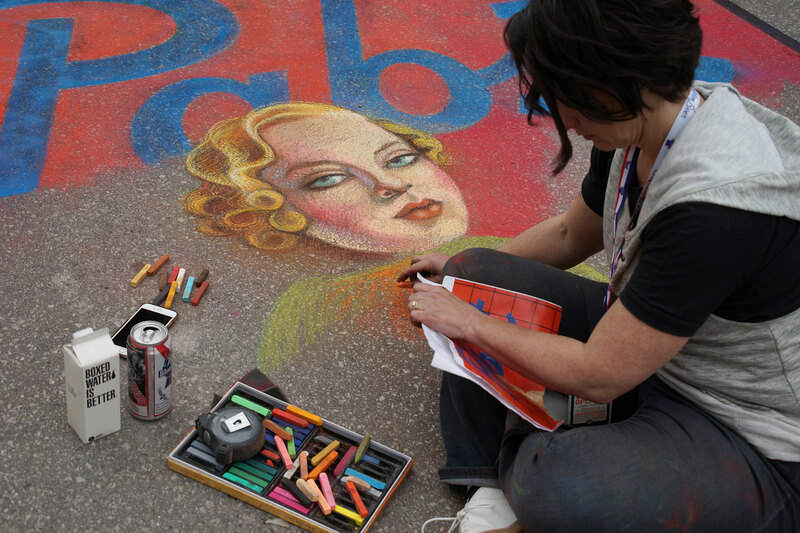 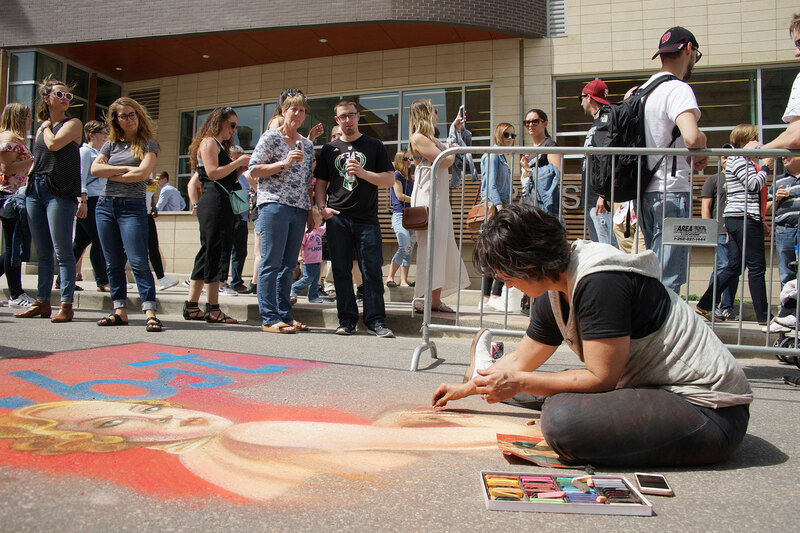 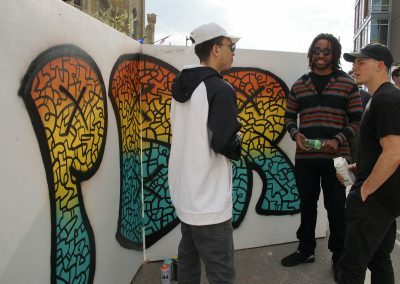 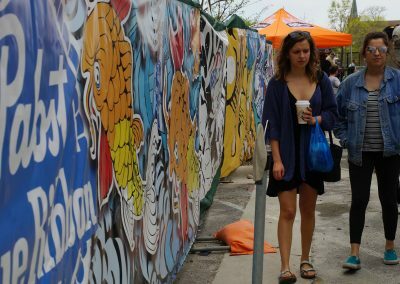 An art gallery was on display for visitors, along with live painting area in a Pabst Open-Air Art Gallery, featuring artist Stacey Williams-Ng who recreated a work from Vargas in a 12’ x 8’ space with colored chalk the street. 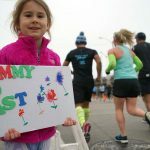 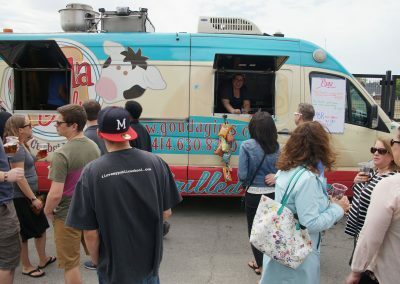 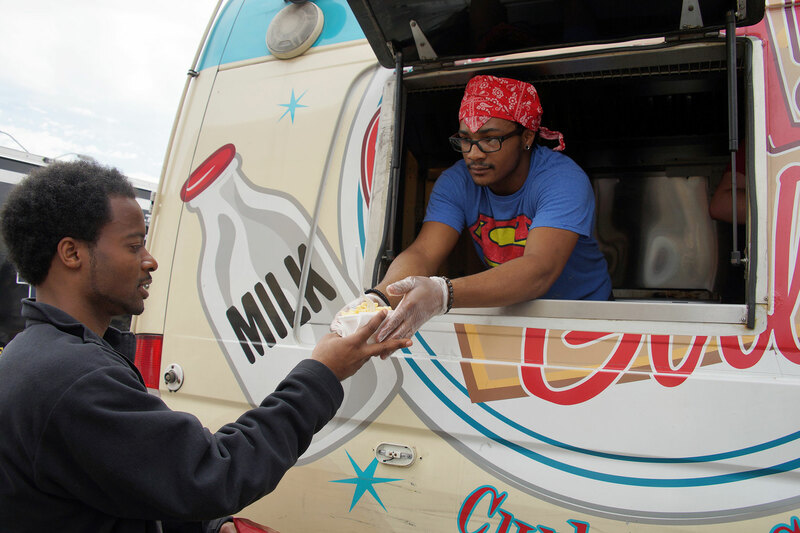 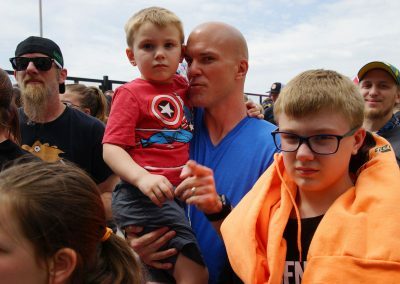 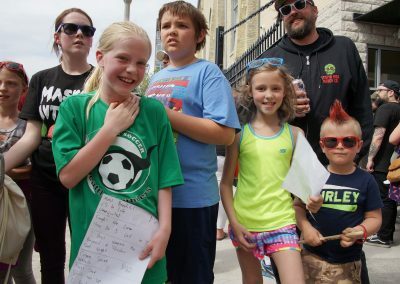 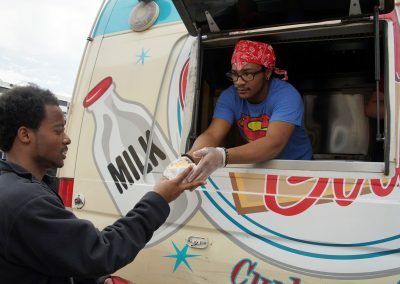 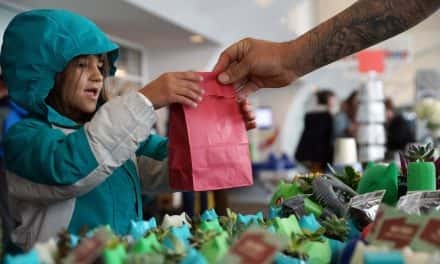 The family event also offered games for kids, and food vendors like the Gouda Girls, who continue to operate their truck at events but opened a permanent location for their award winning grilled cheese sandwiches within the Eleven25 food court at the Pabst complex. 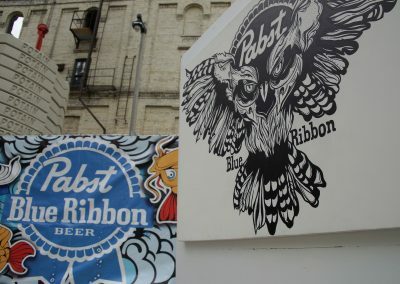 And, of course, there was plenty of Pabst Blue Ribbon Beer and other brews from the new line of products, such as an oatmeal stout, IPA, German lager, and honey wheat. 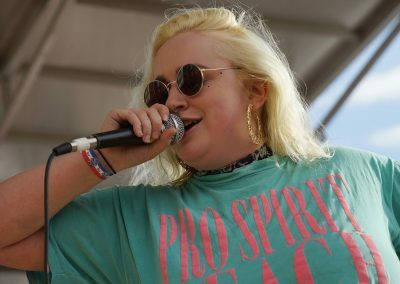 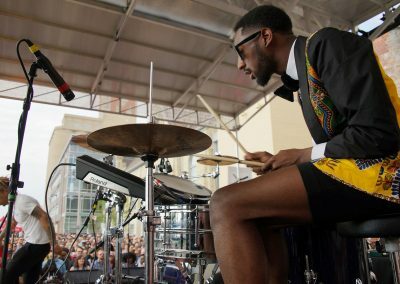 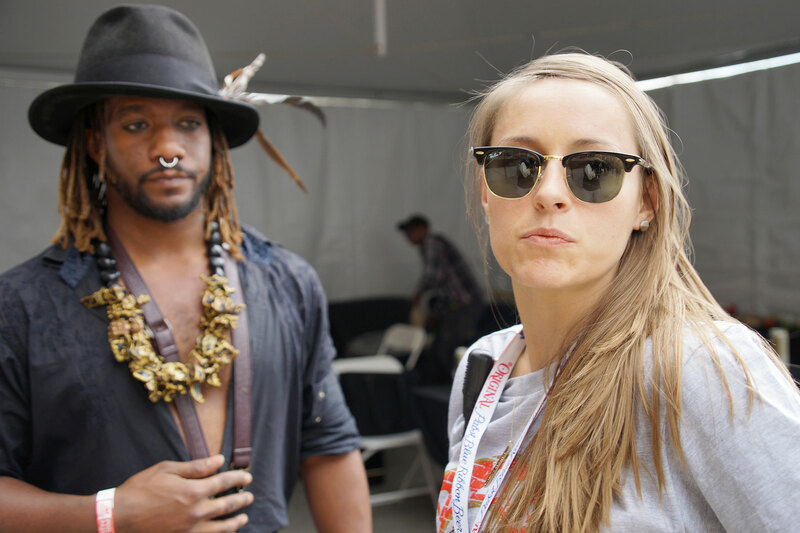 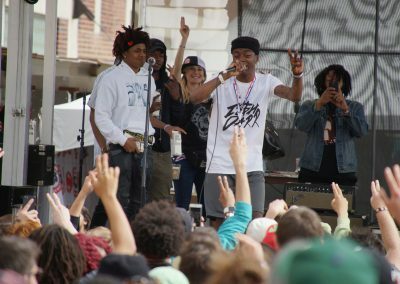 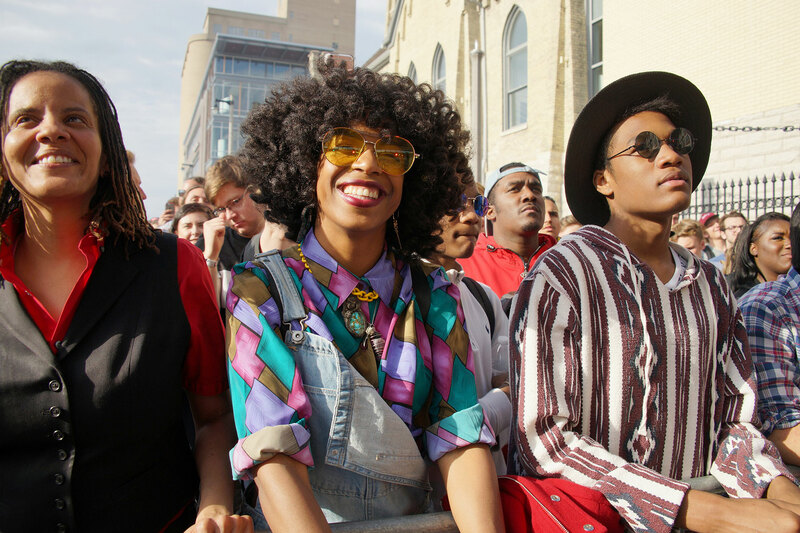 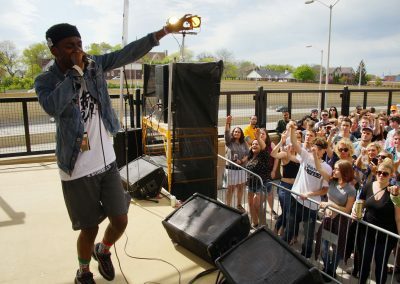 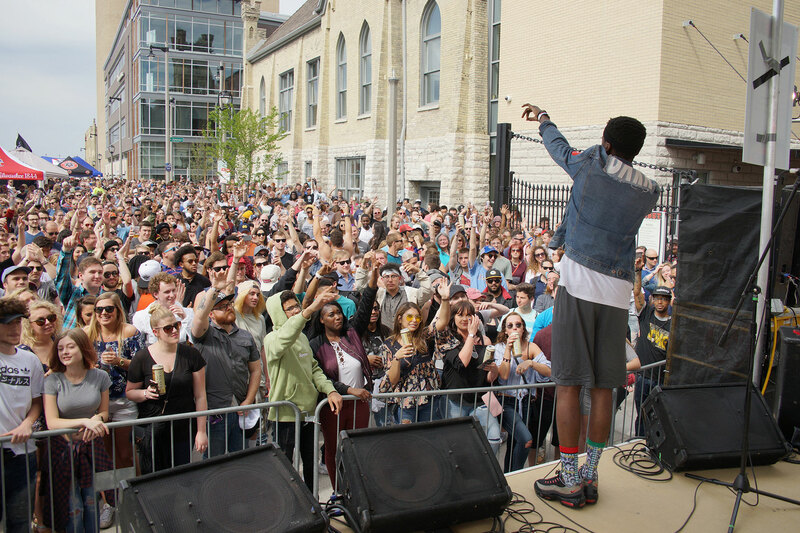 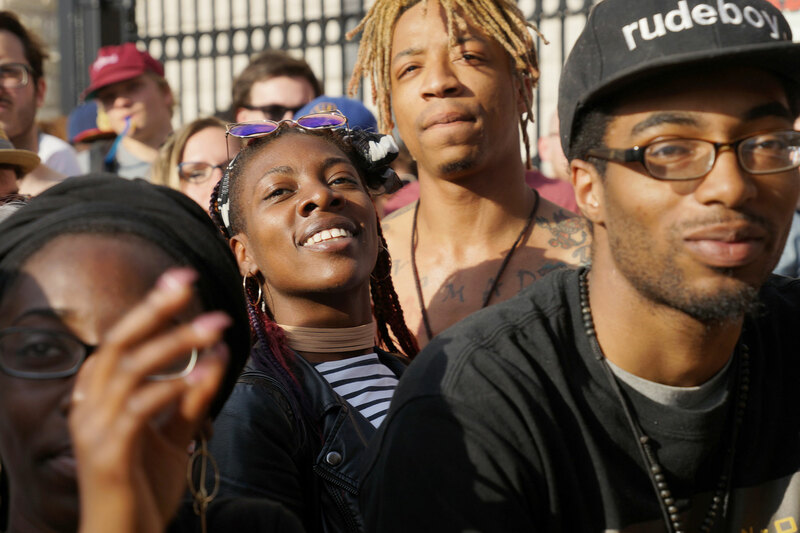 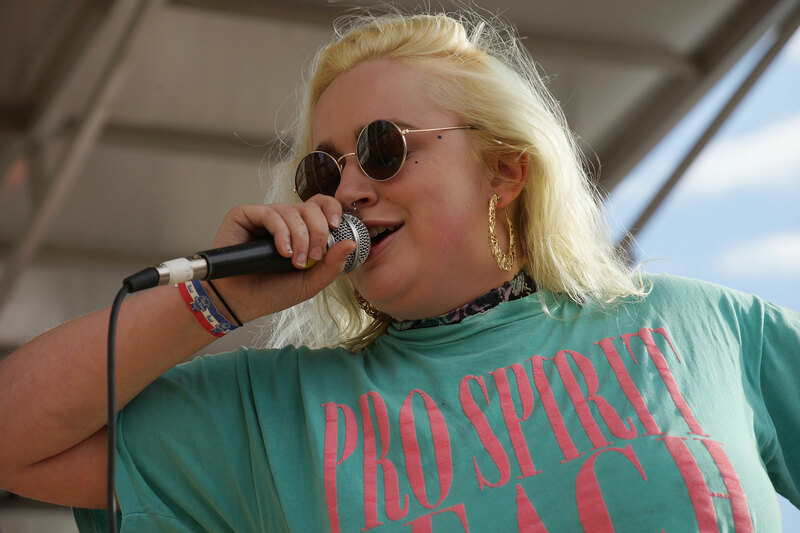 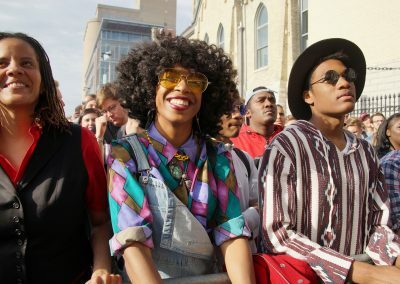 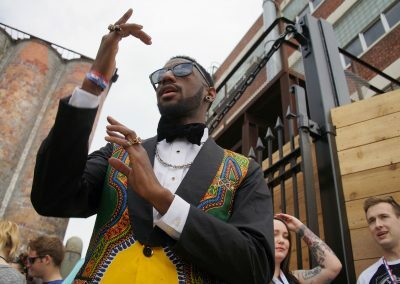 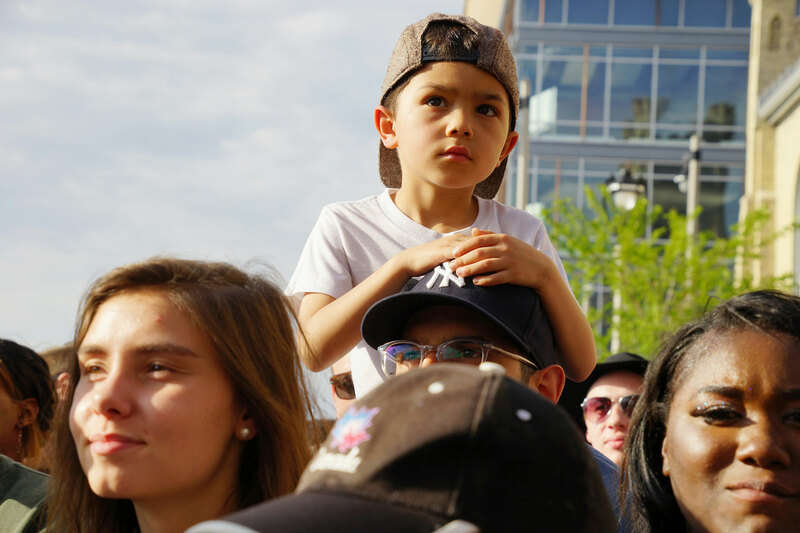 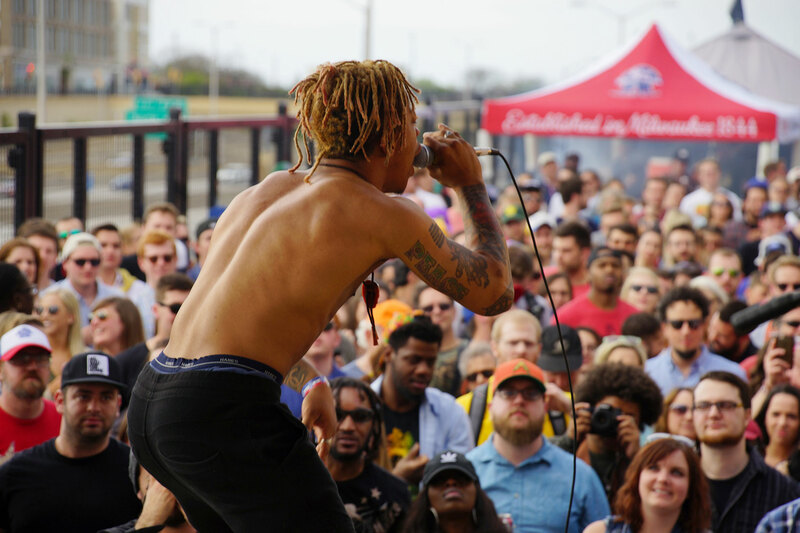 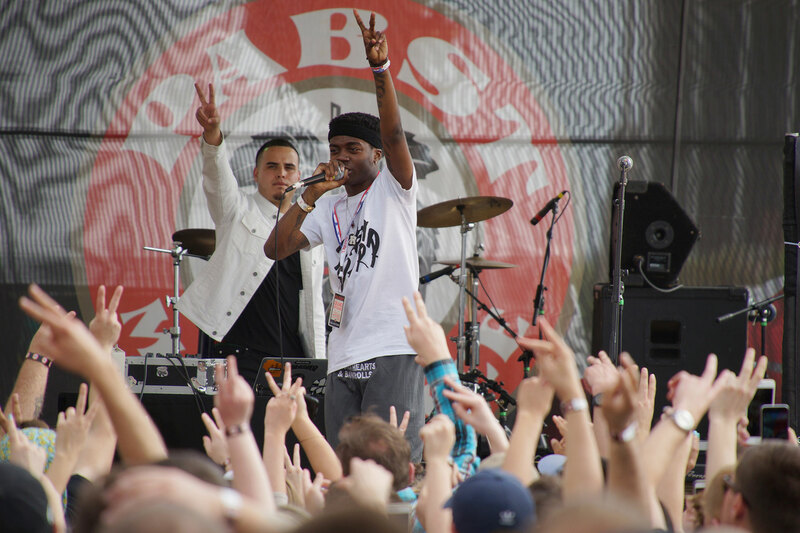 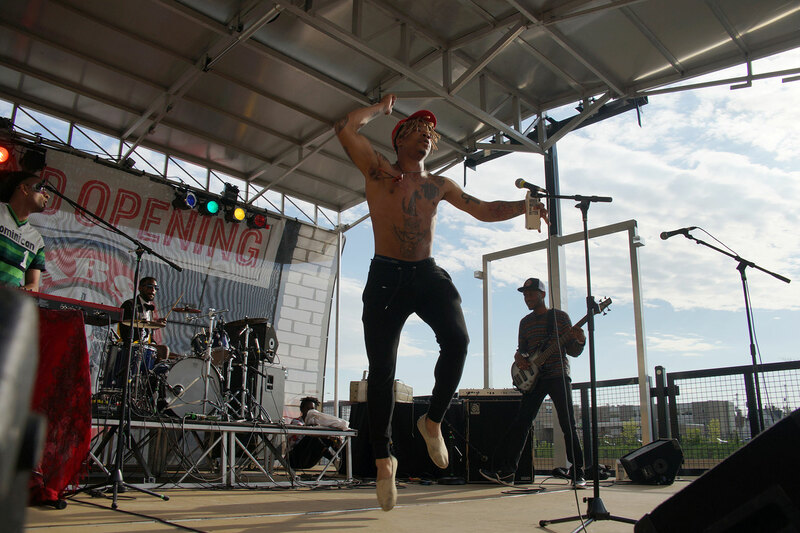 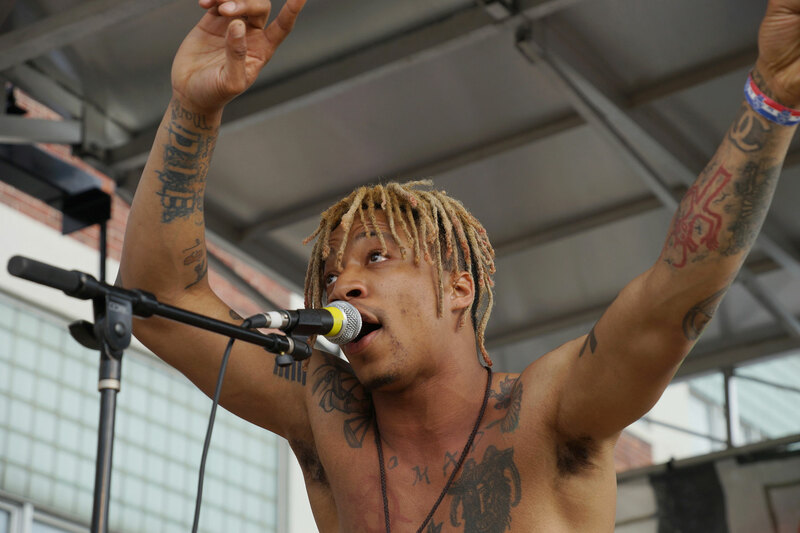 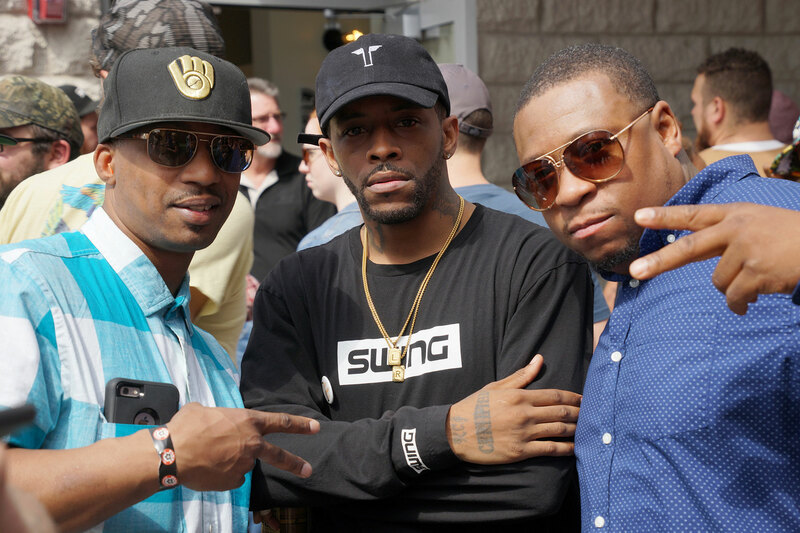 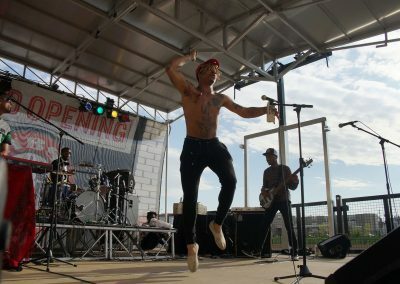 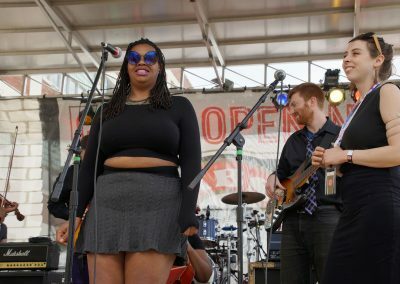 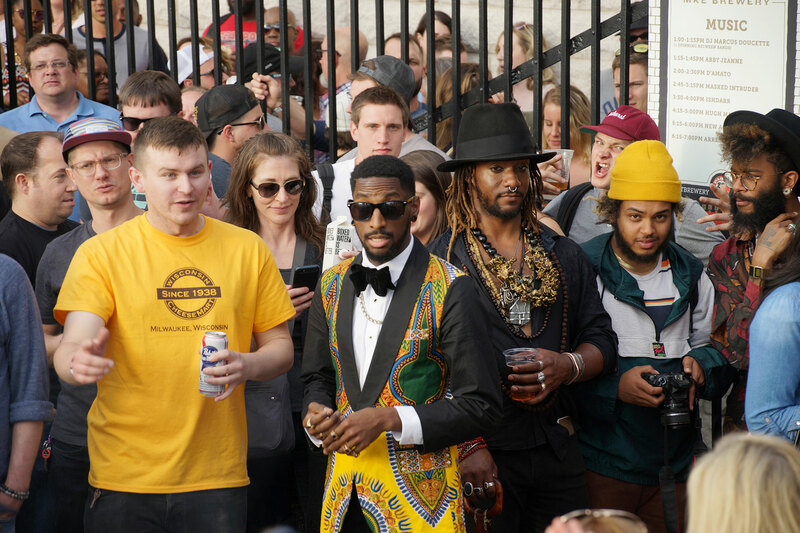 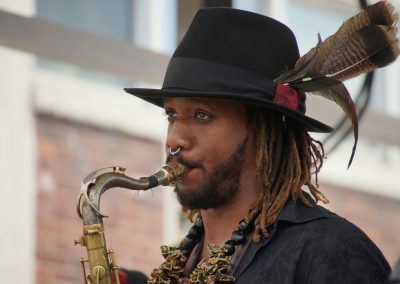 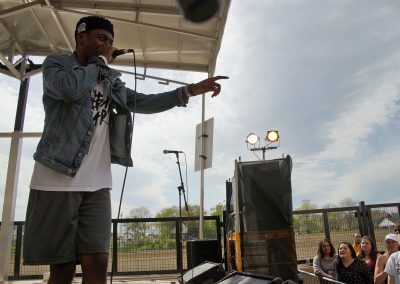 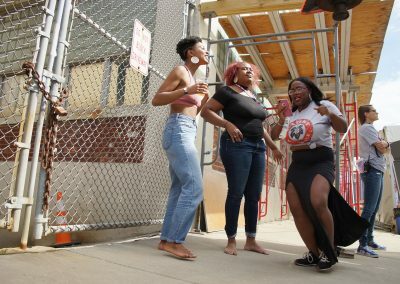 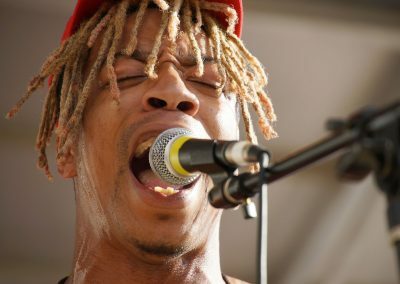 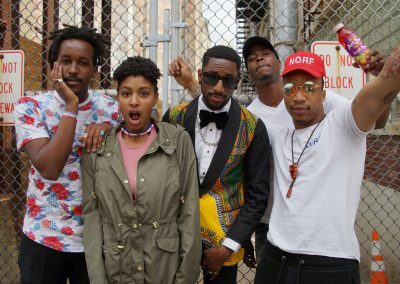 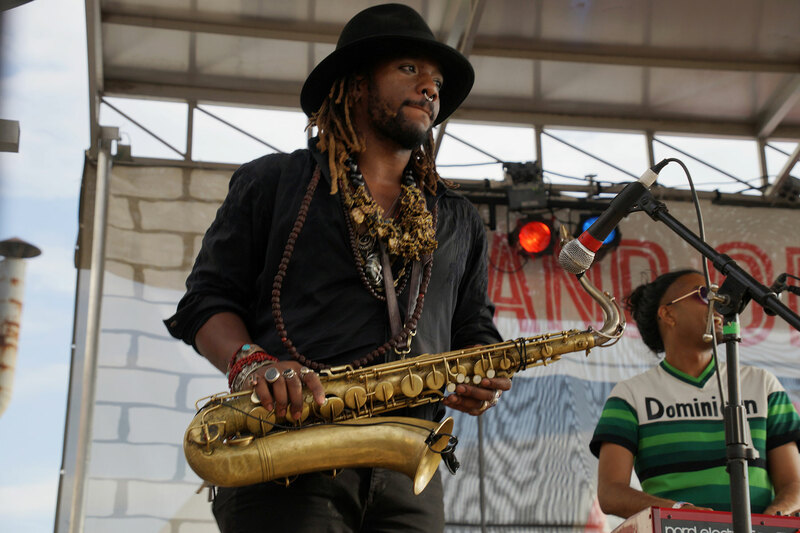 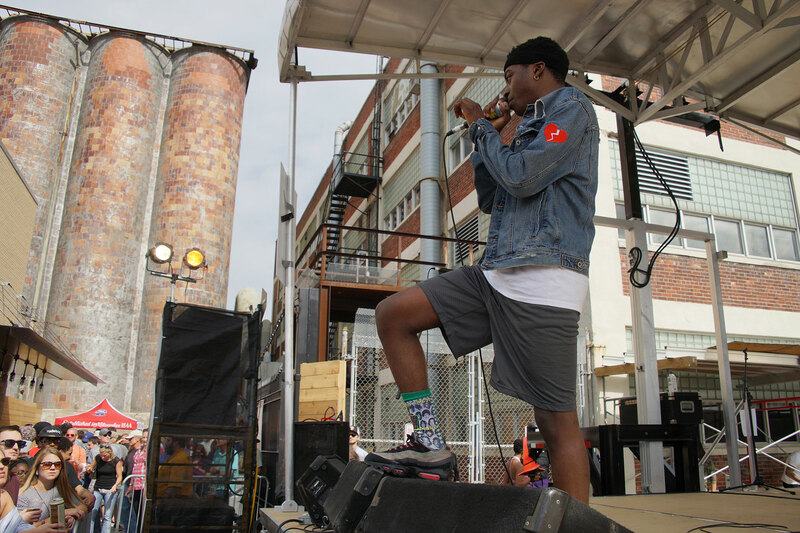 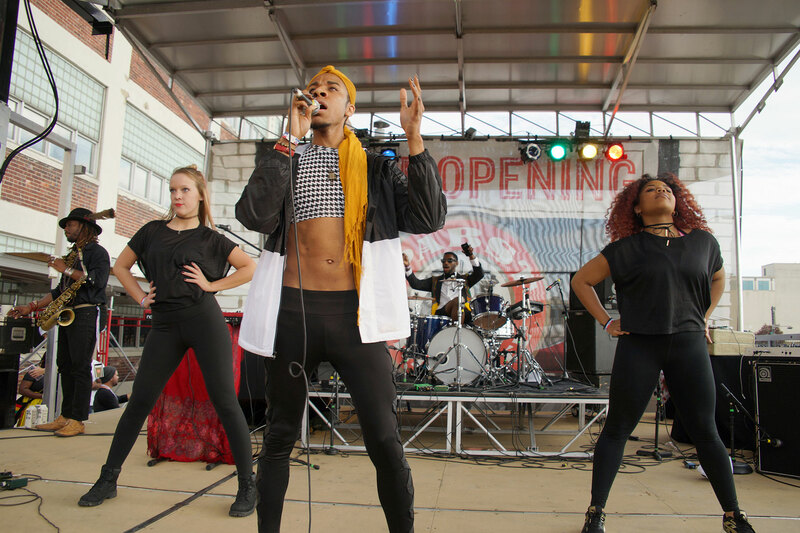 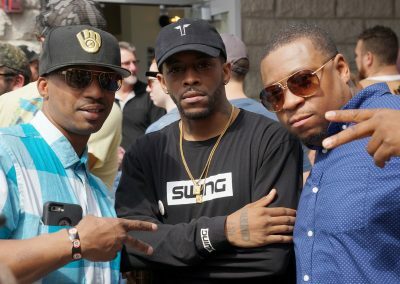 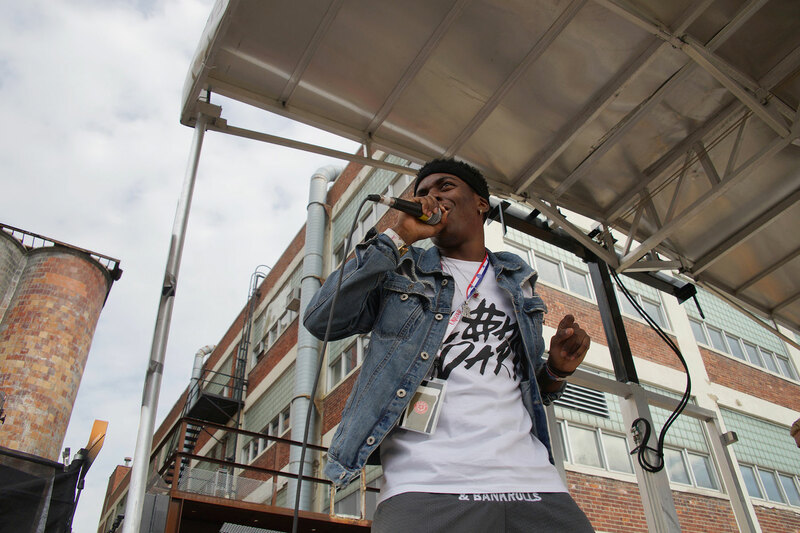 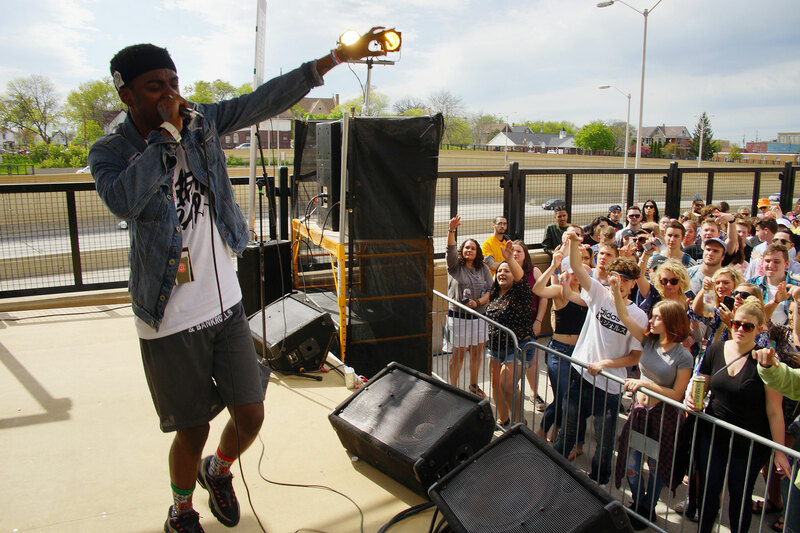 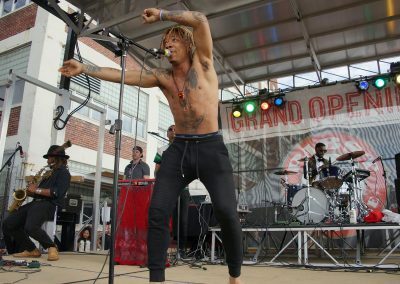 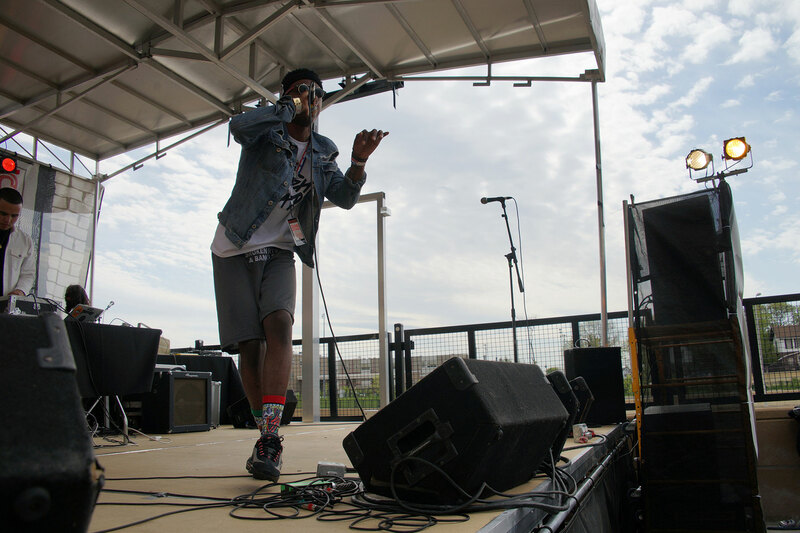 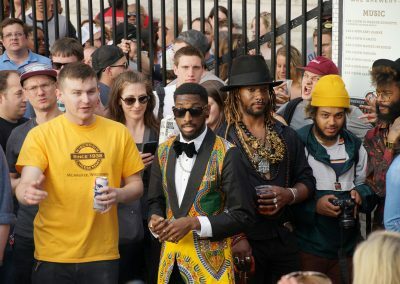 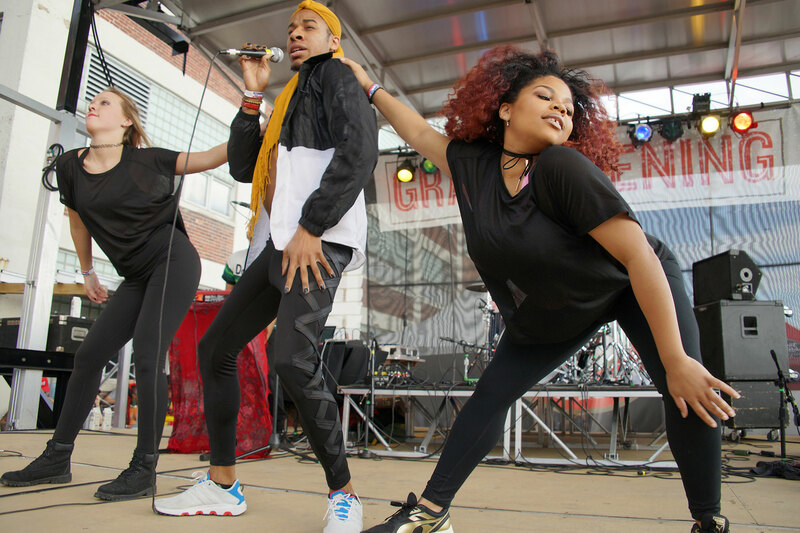 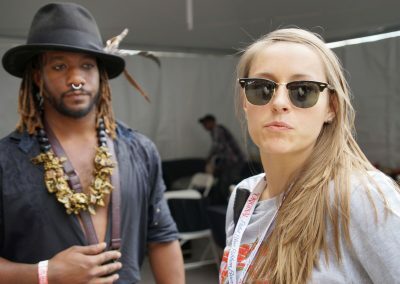 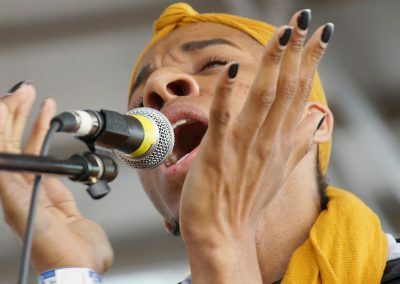 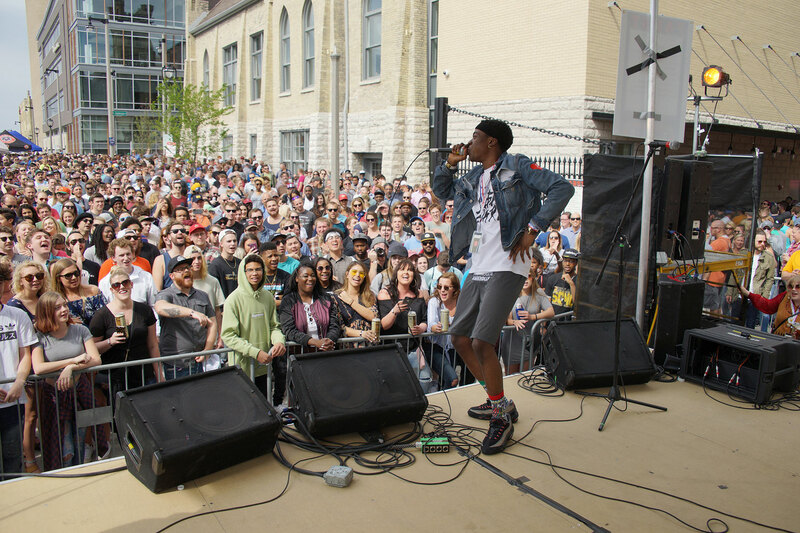 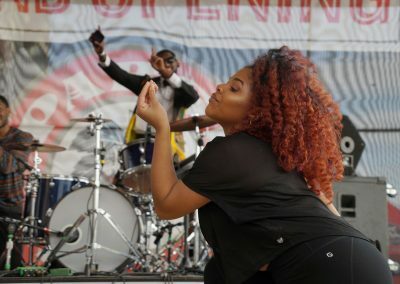 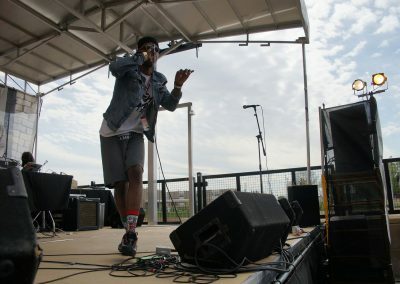 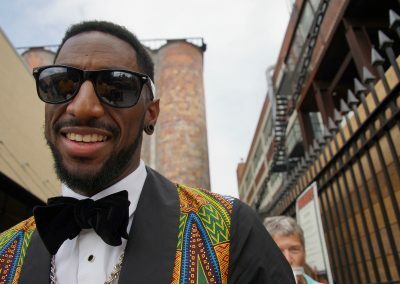 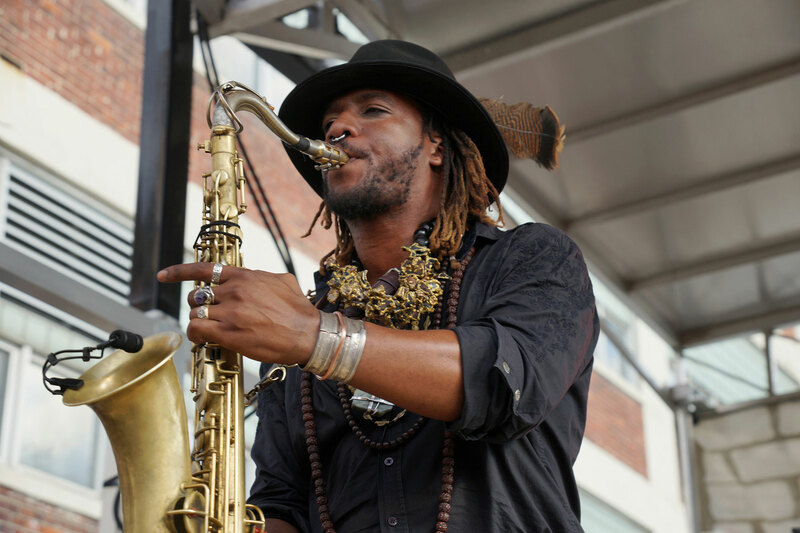 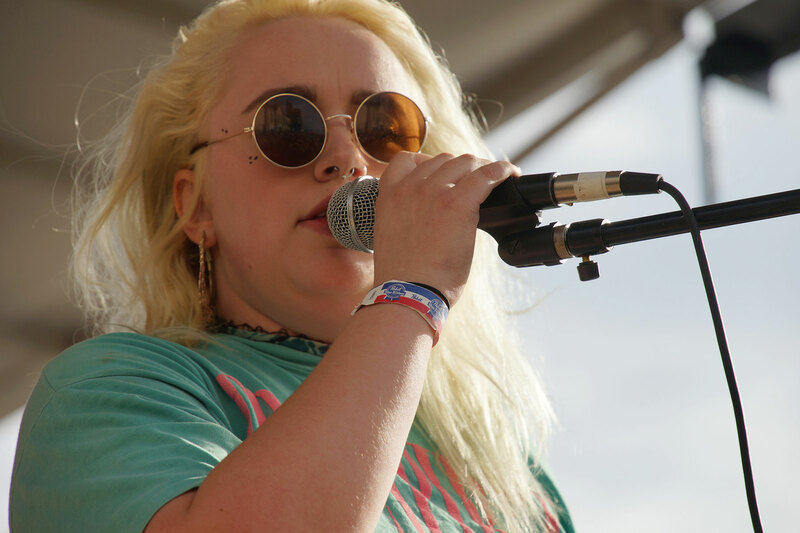 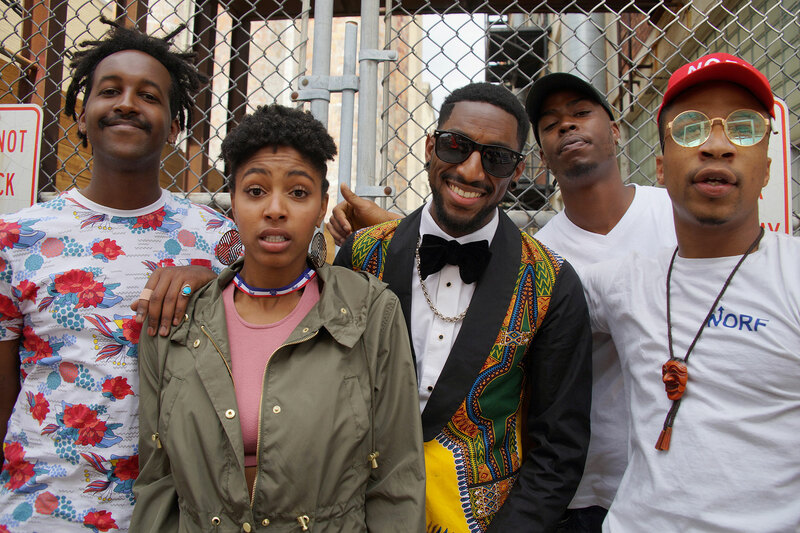 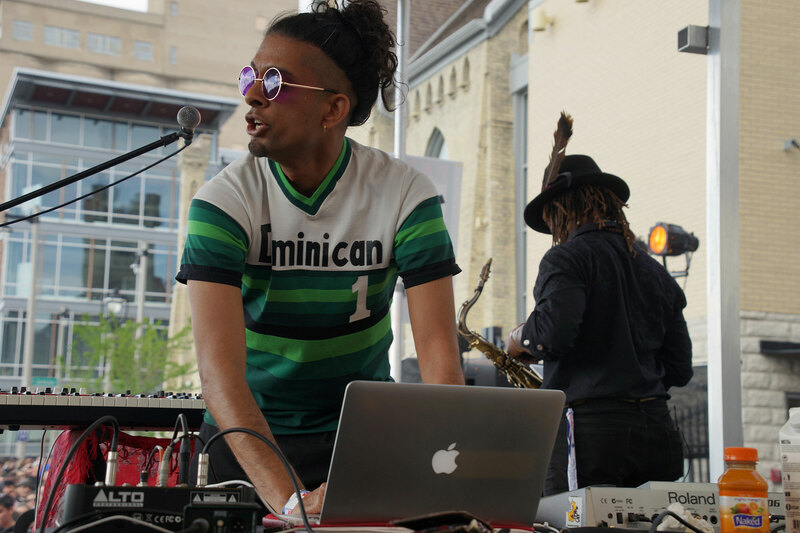 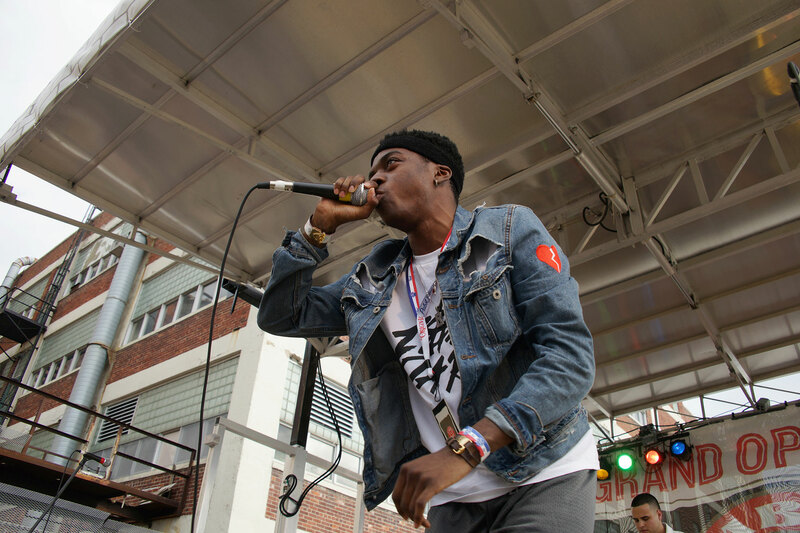 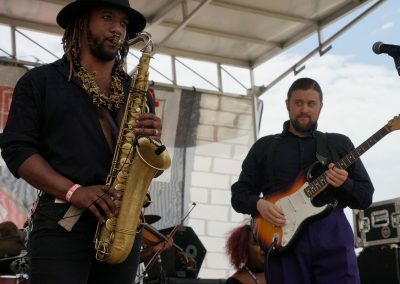 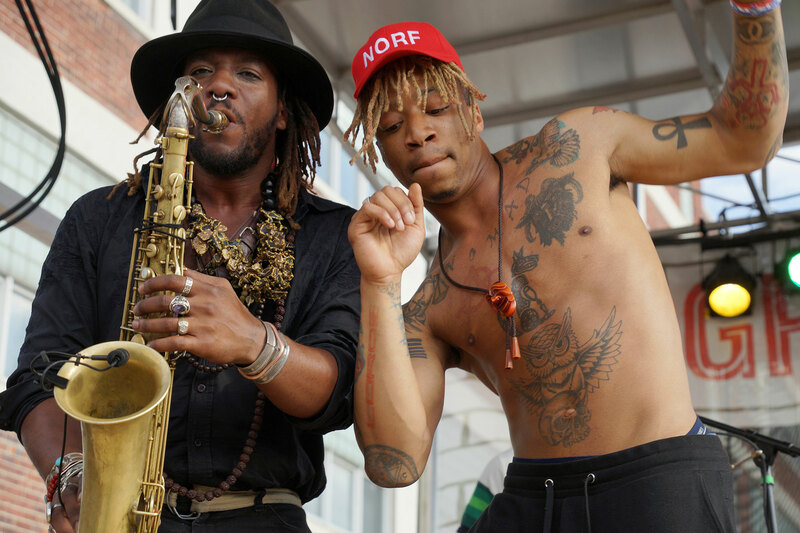 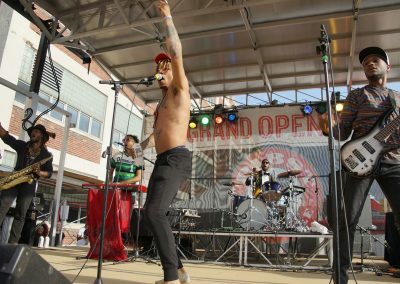 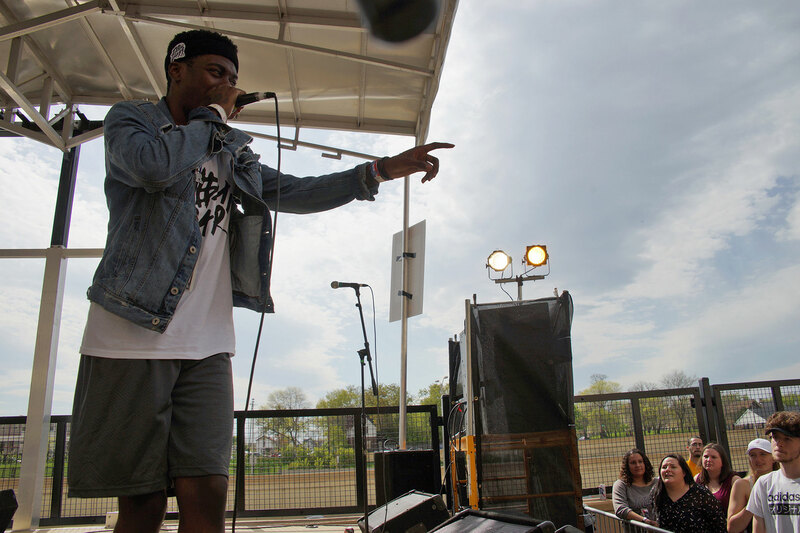 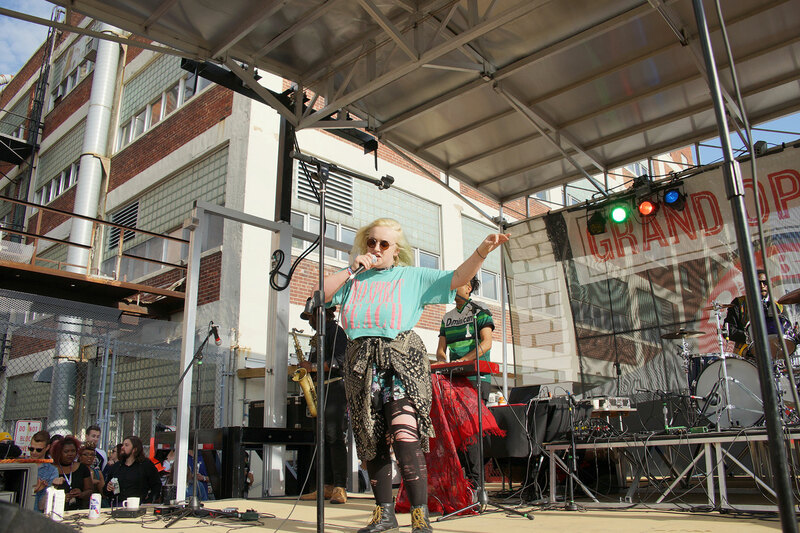 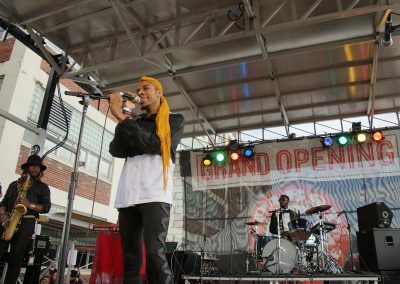 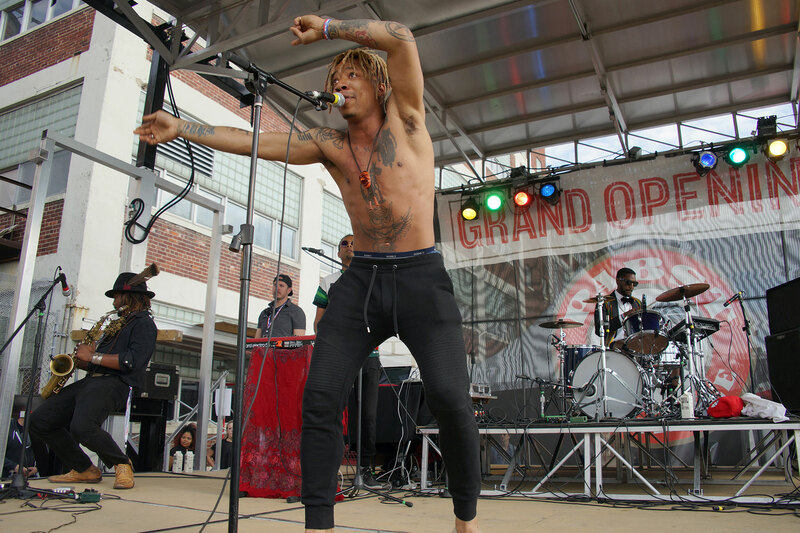 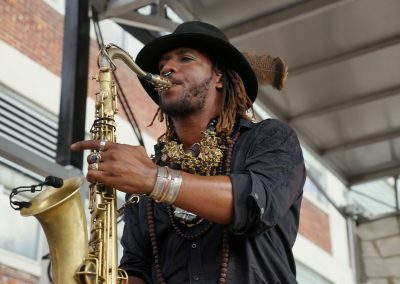 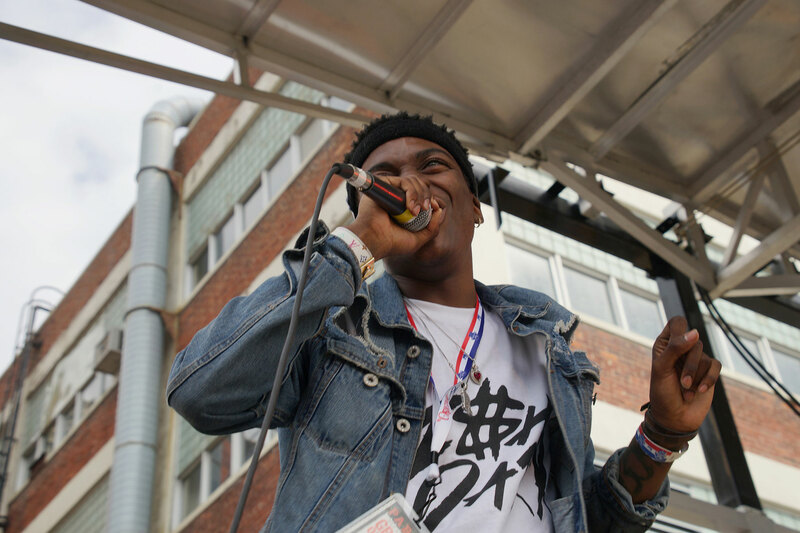 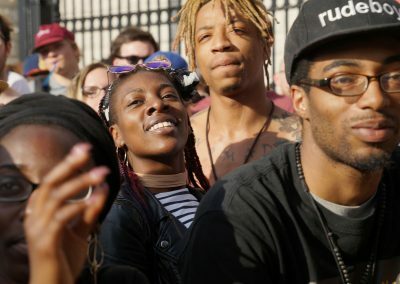 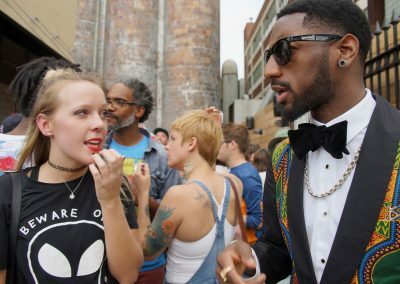 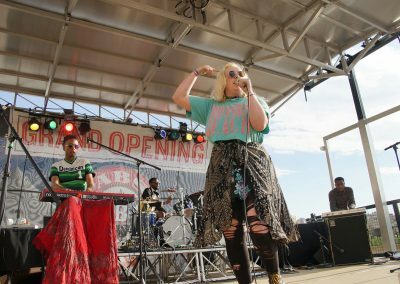 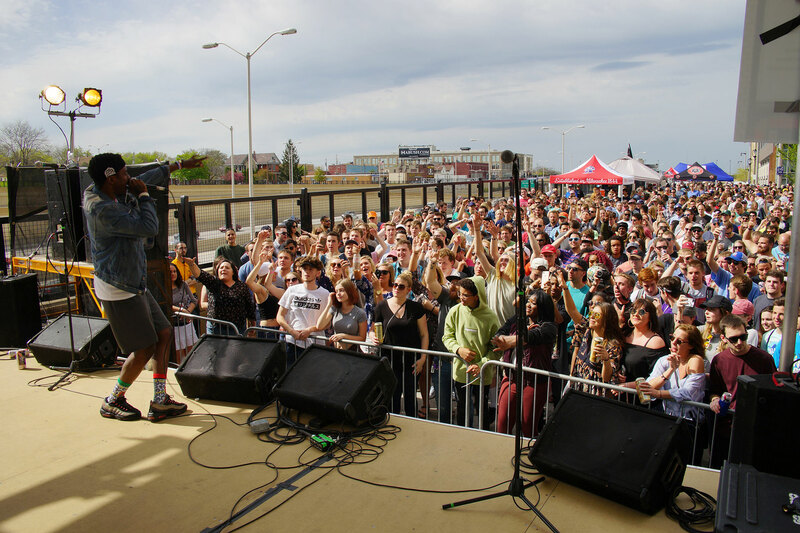 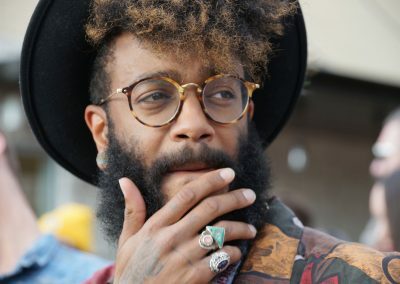 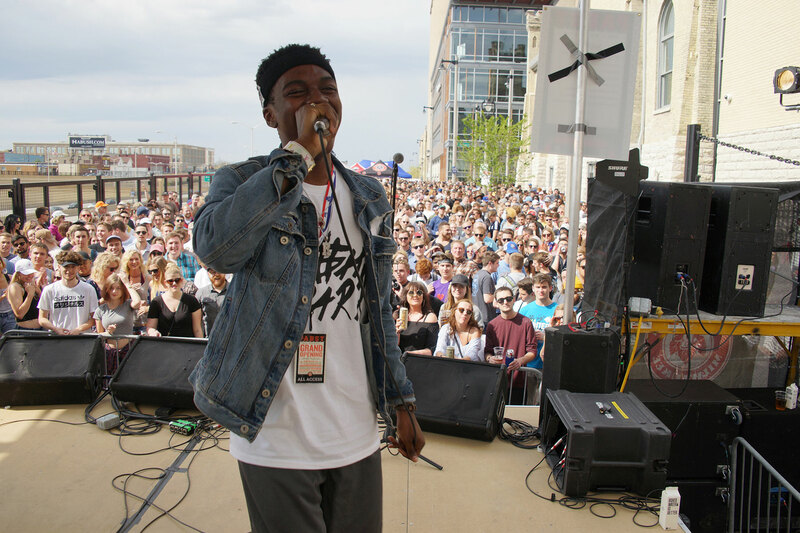 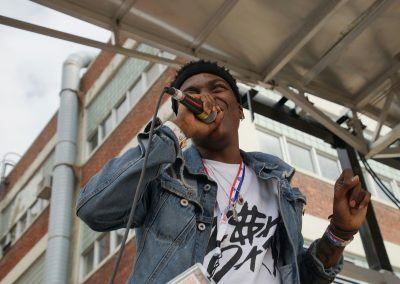 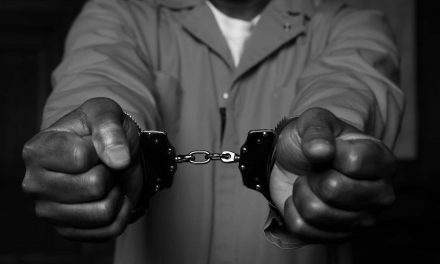 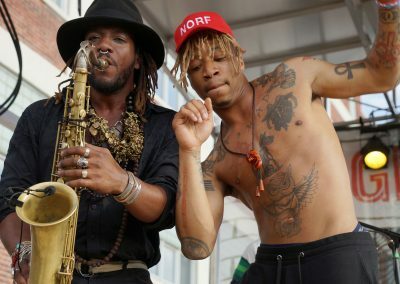 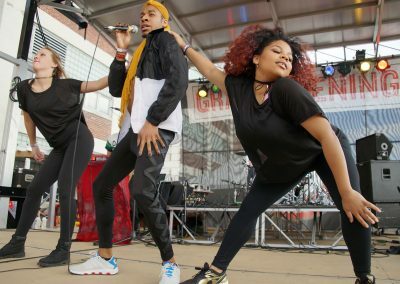 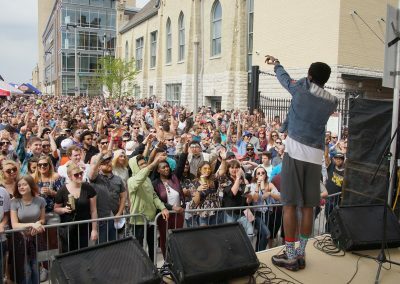 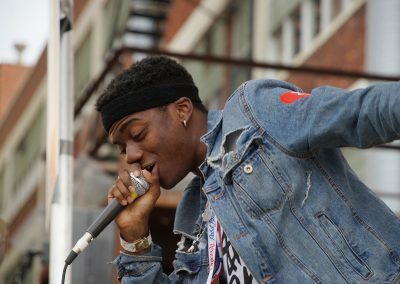 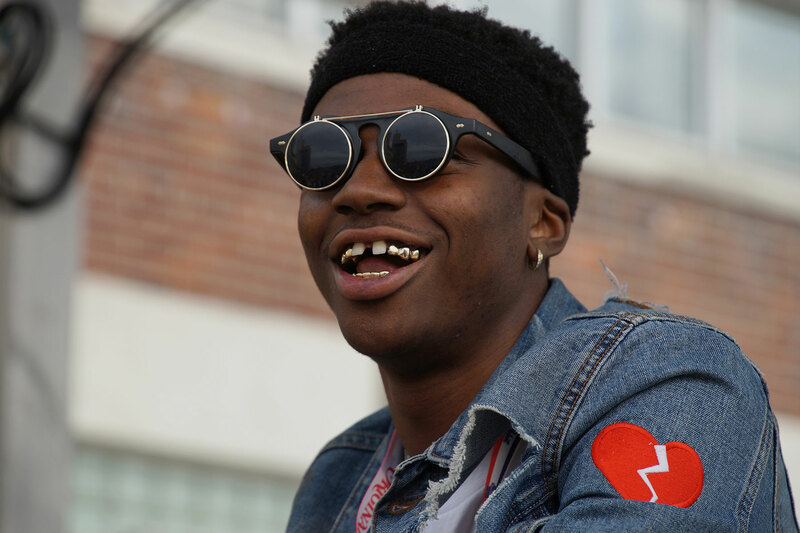 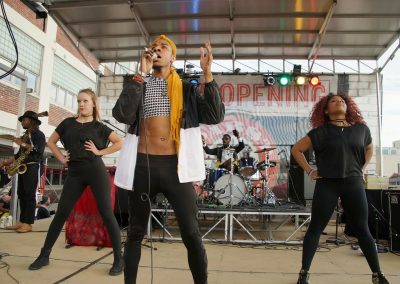 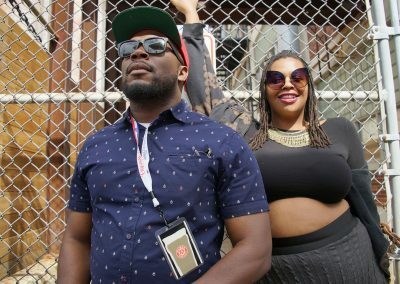 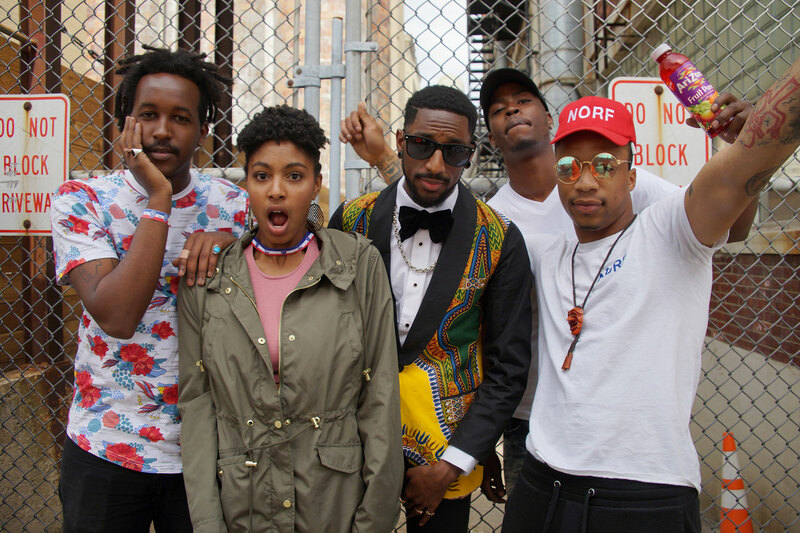 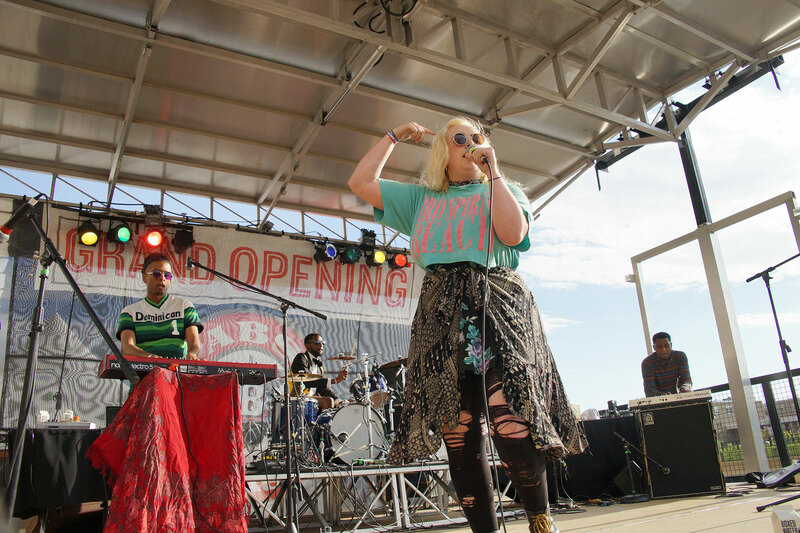 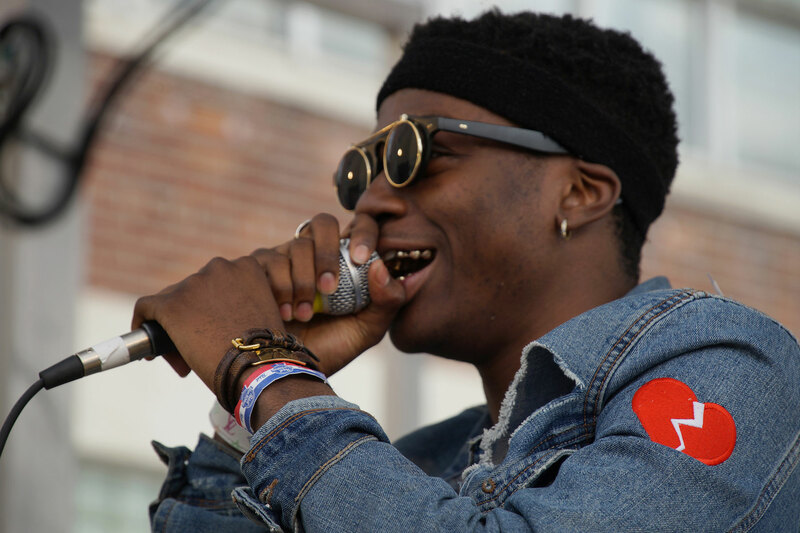 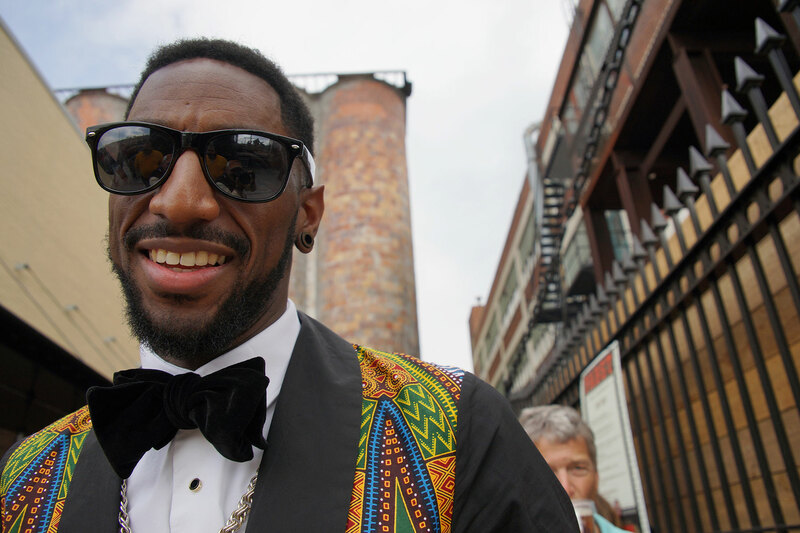 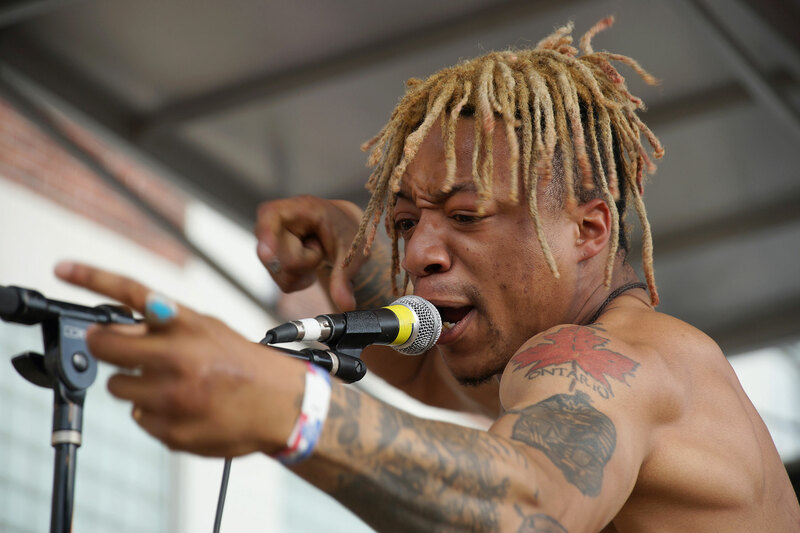 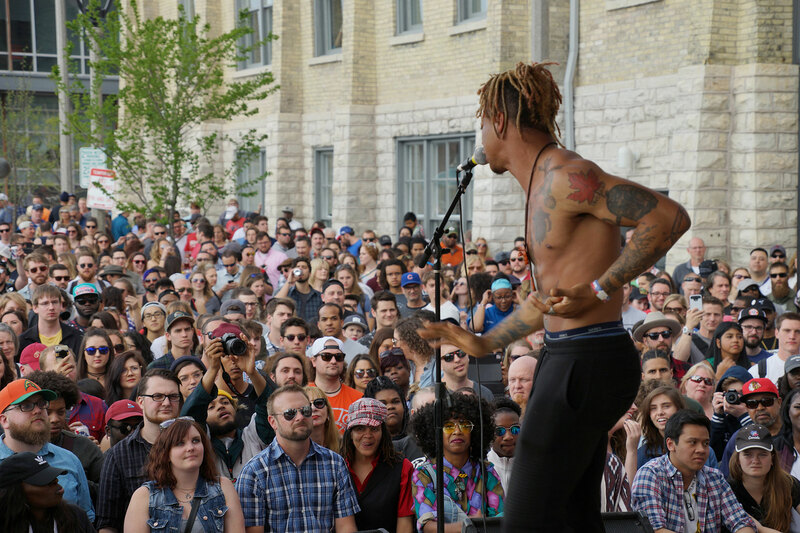 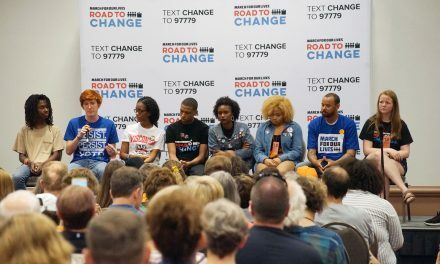 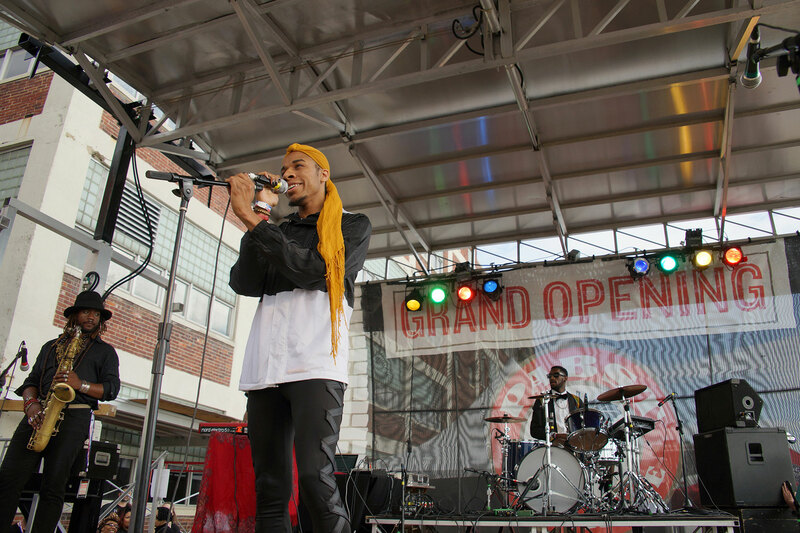 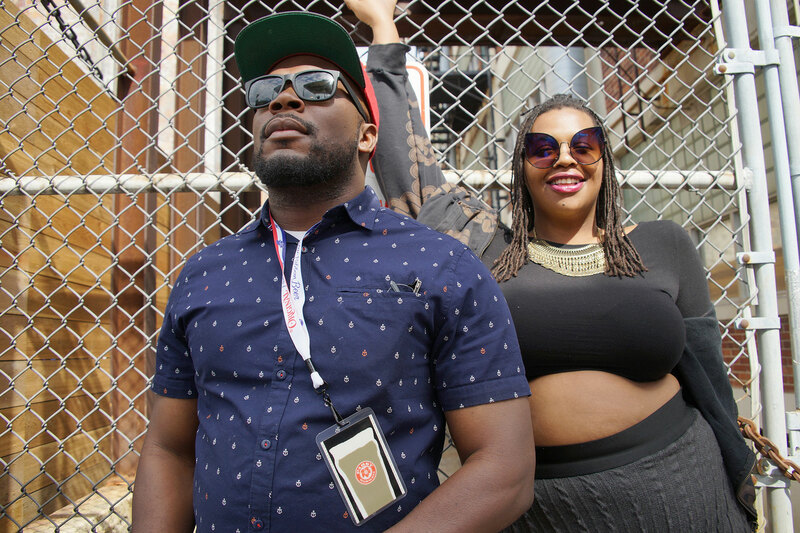 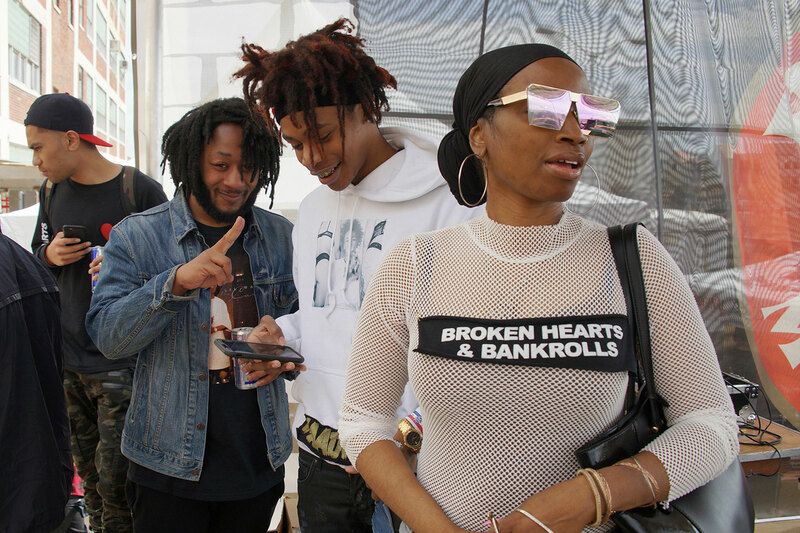 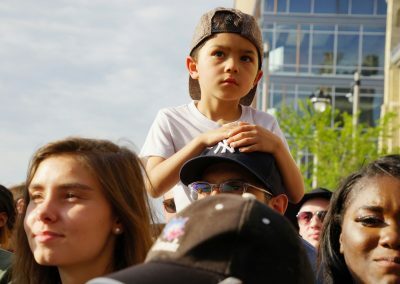 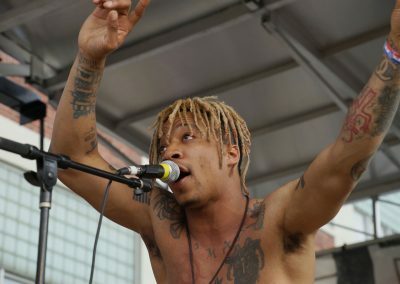 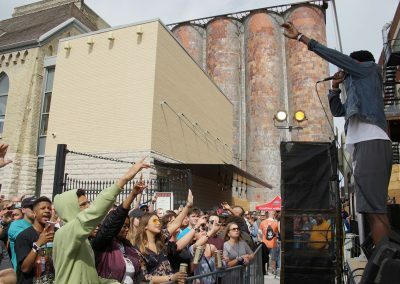 The rest of the daylong party included music from popular local groups, headlined by the two-time Grammy Award-winning hip-hop group Arrested Development. 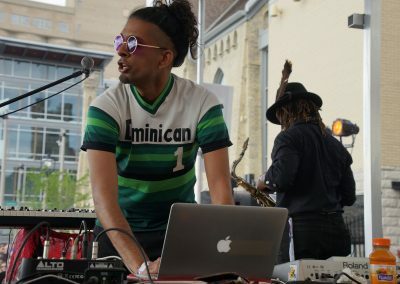 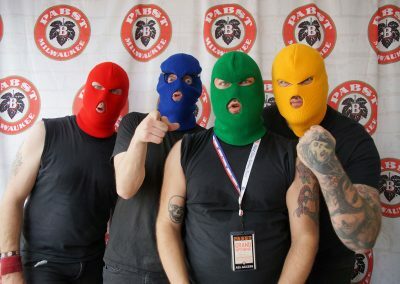 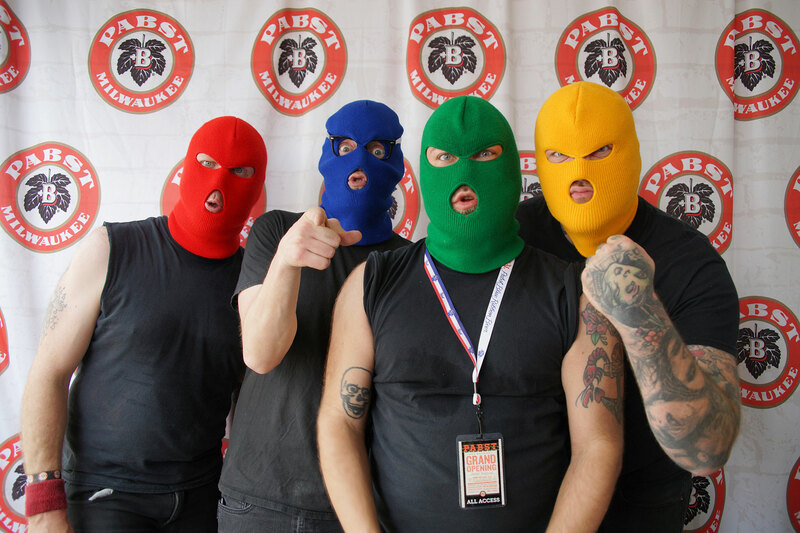 The line up included Ish DARR, New Age Narcissism featuring Lex Allen, Siren, and Lorde Freddee, as well DJ Marcus Doucette, Hugh Masterson, pop punk band Masked Intruder, alternative soul rocker Abby Jeanne, and 12-piece funk group D’Amato. 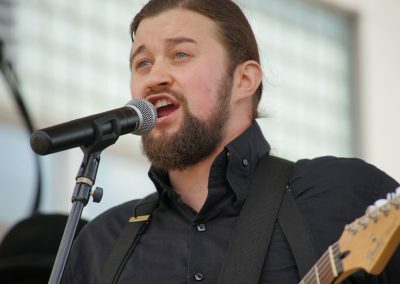 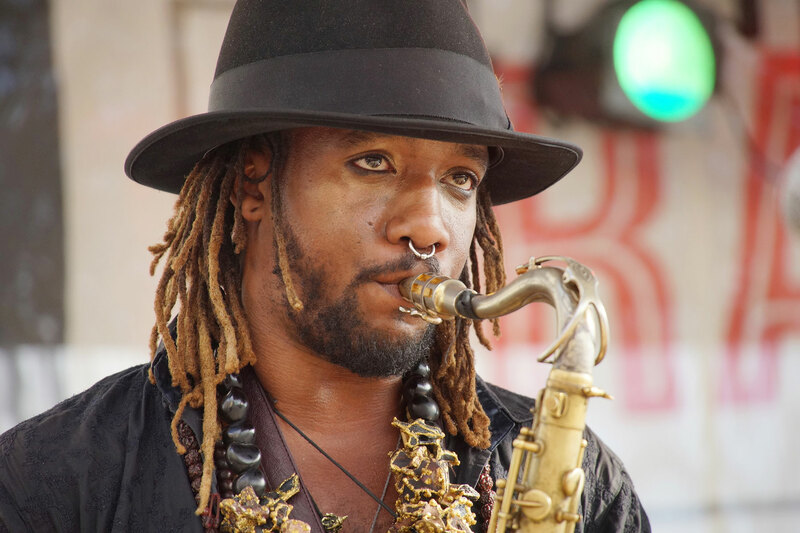 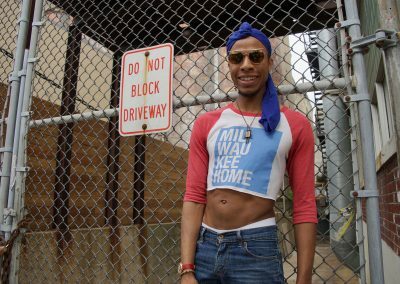 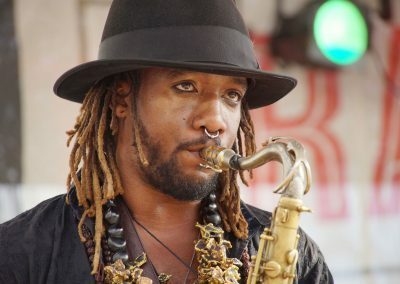 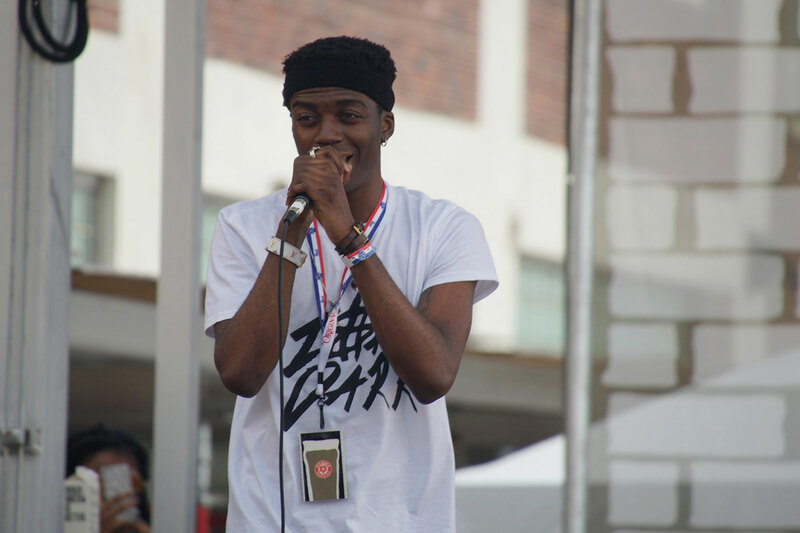 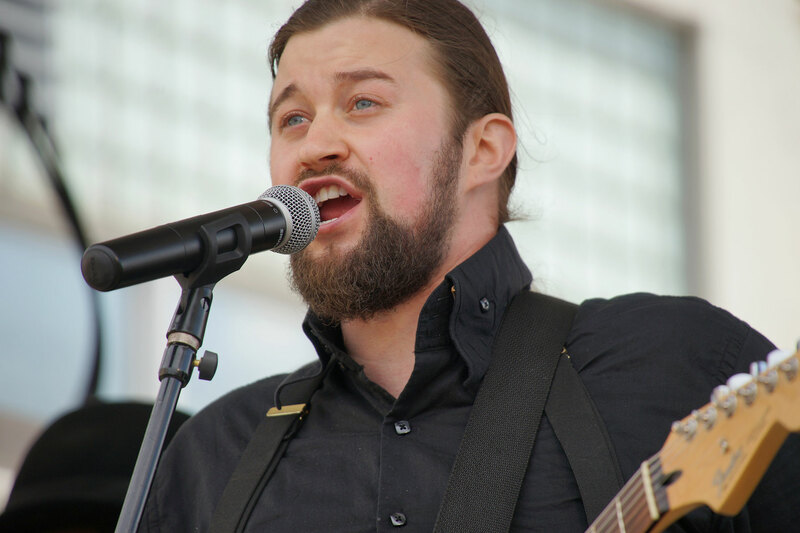 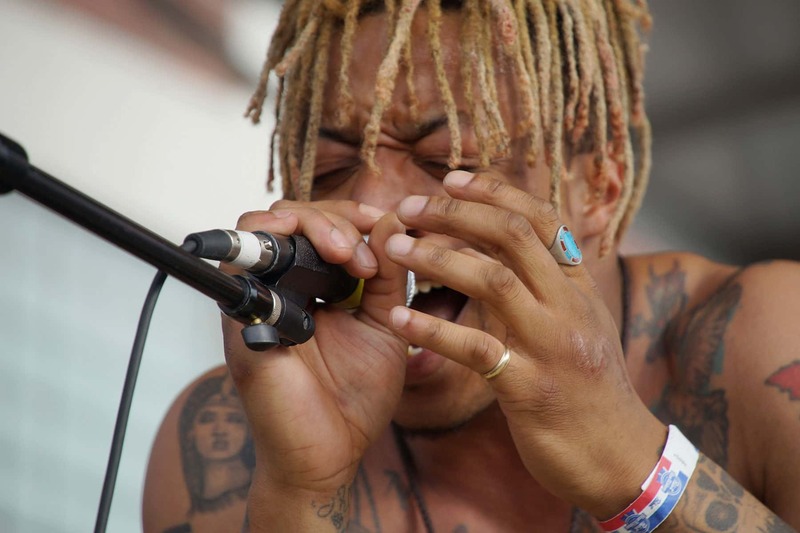 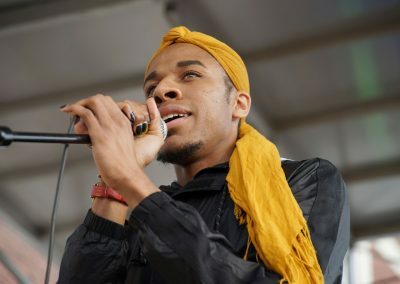 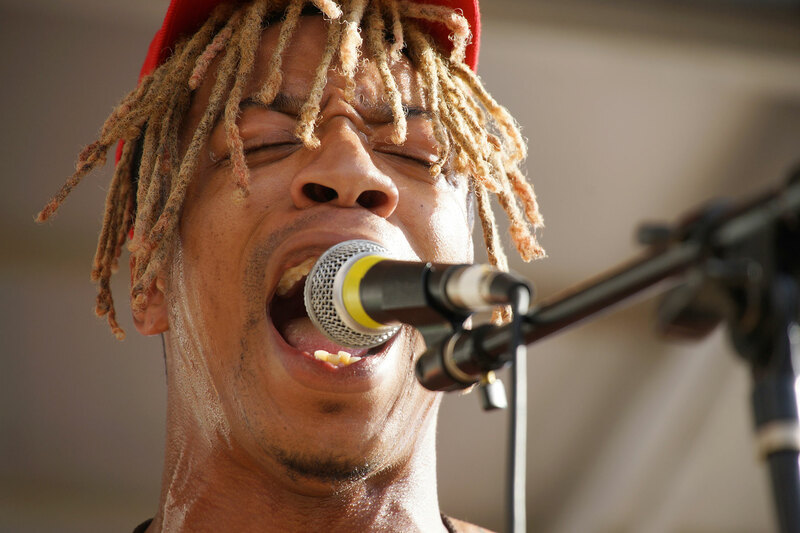 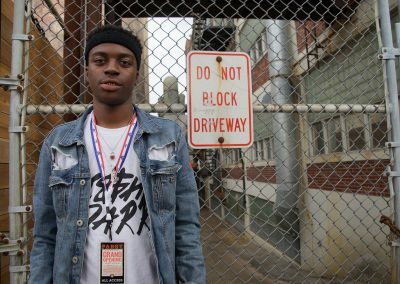 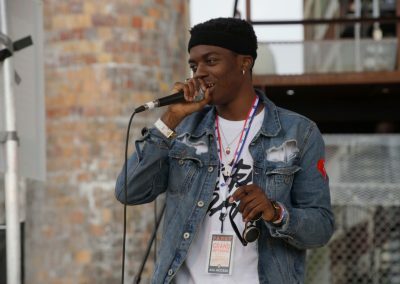 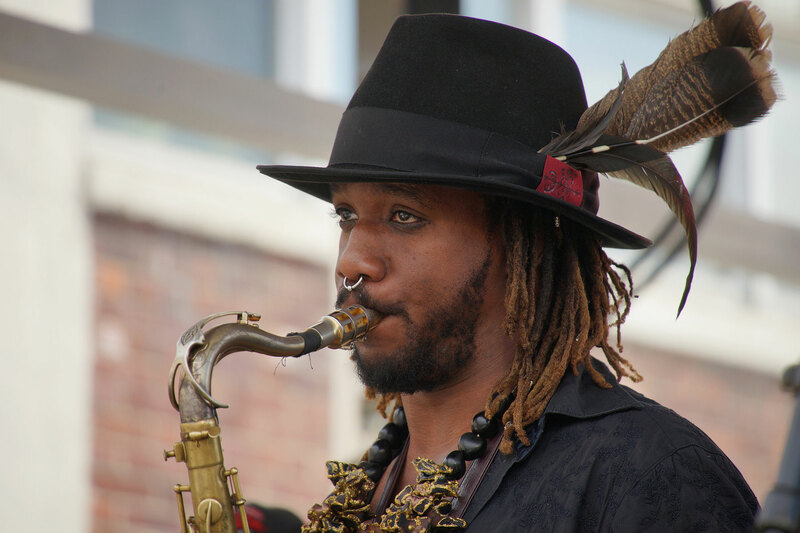 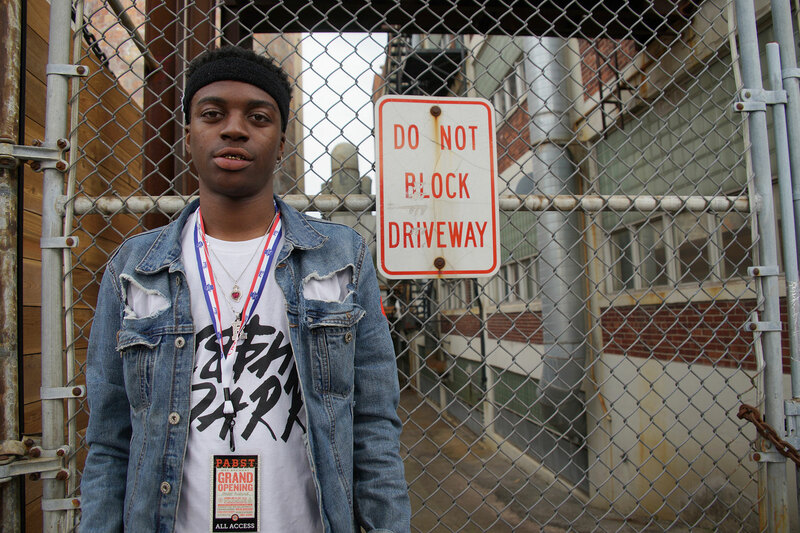 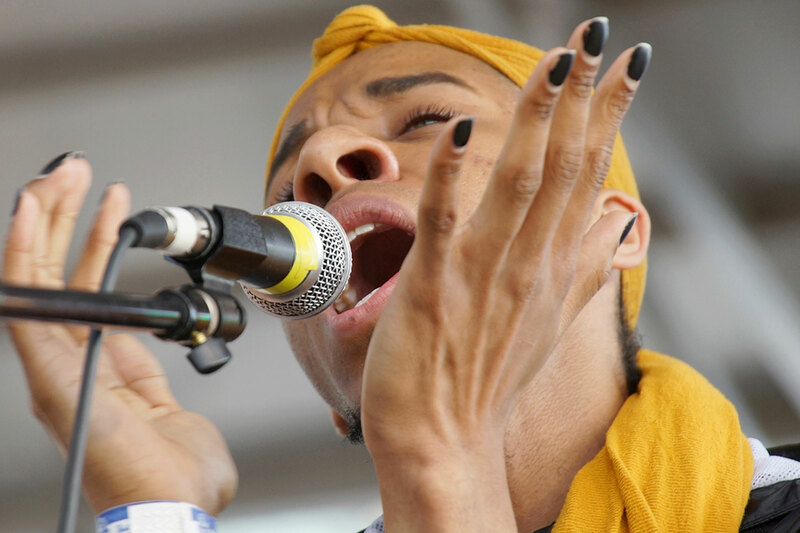 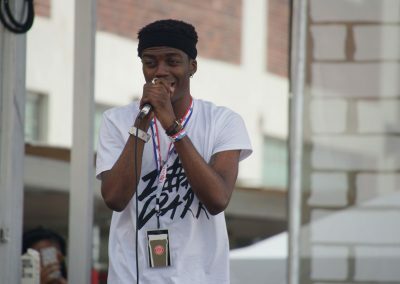 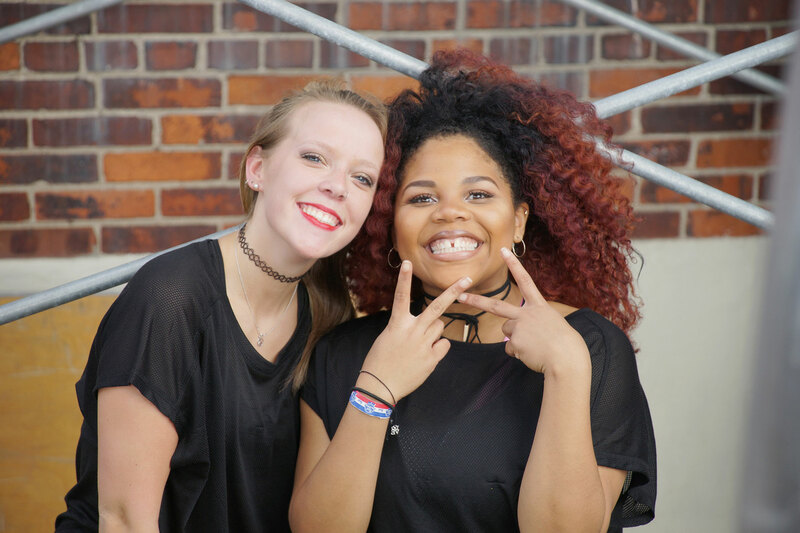 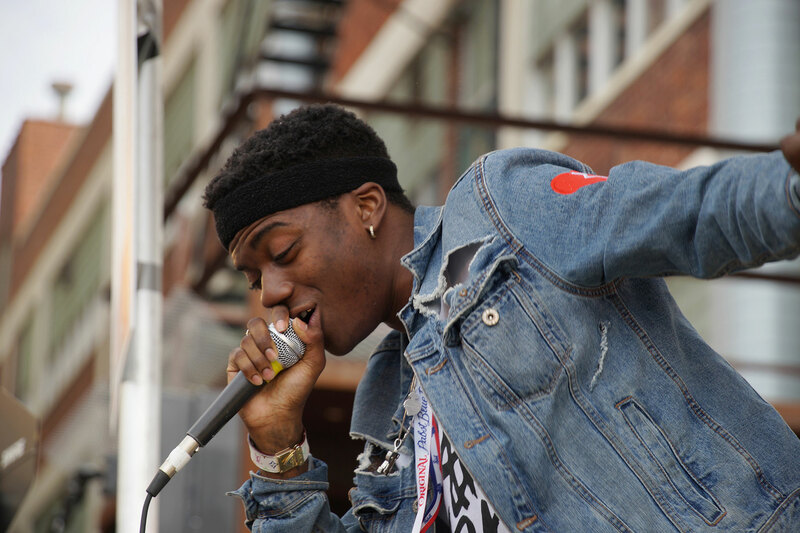 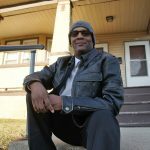 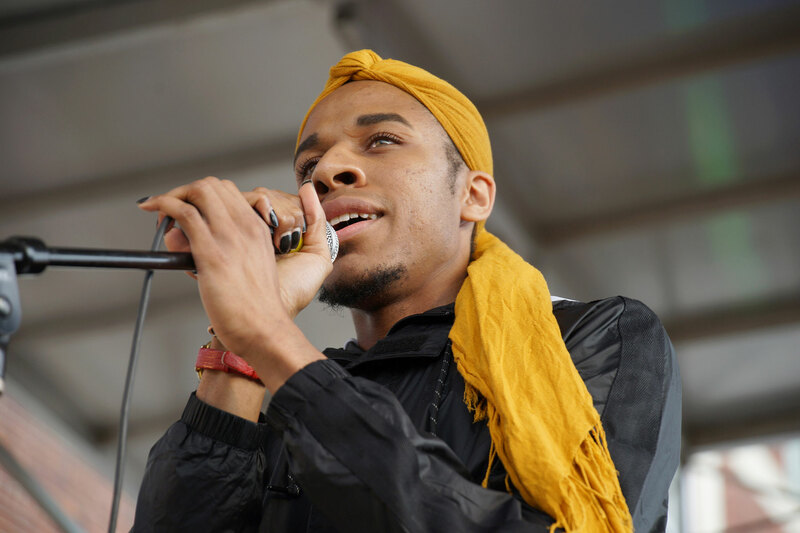 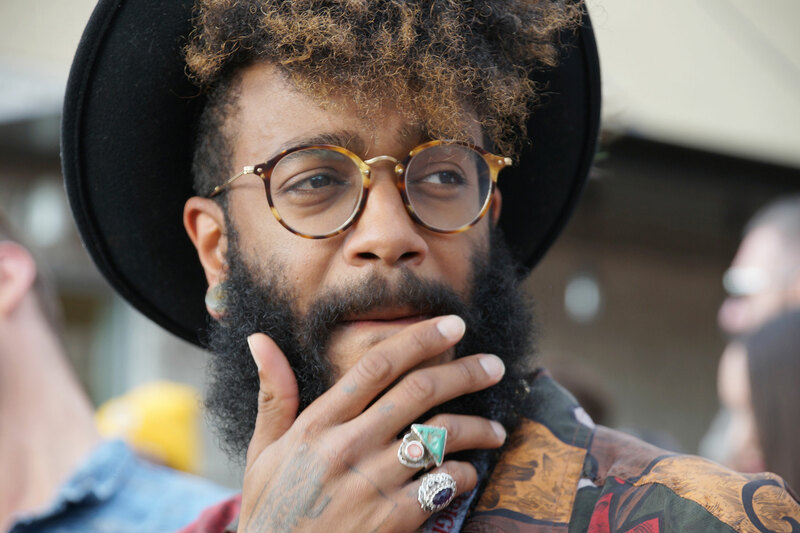 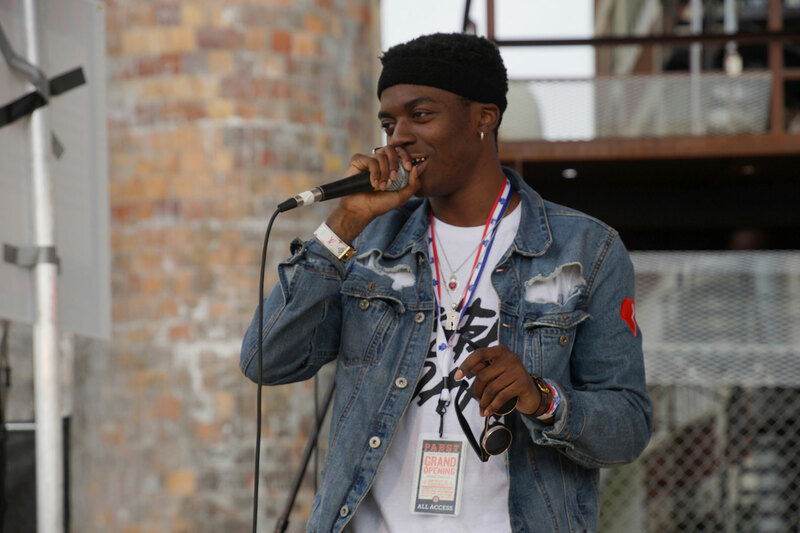 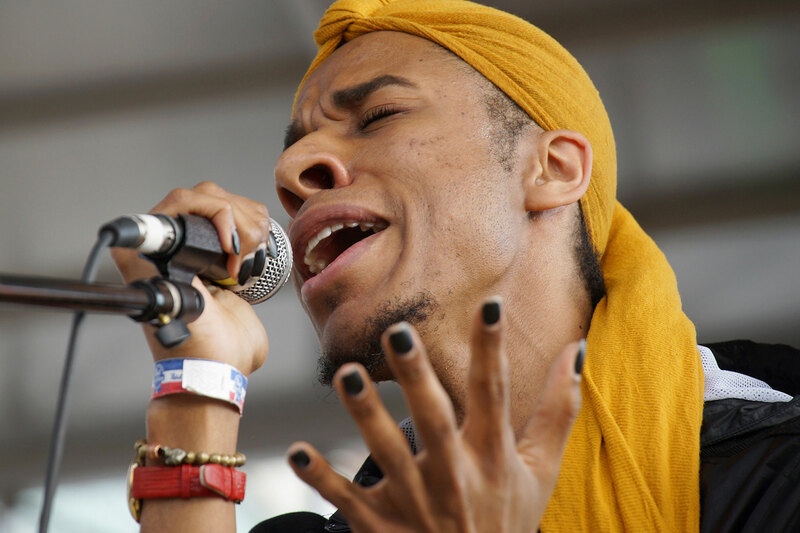 Ish Darr was recently named a stage headliner at Summerfest, and will be on movie screens across the country in the upcoming movie “White Boy Rick” by Sony Pictures that stars Matthew McConaughey. 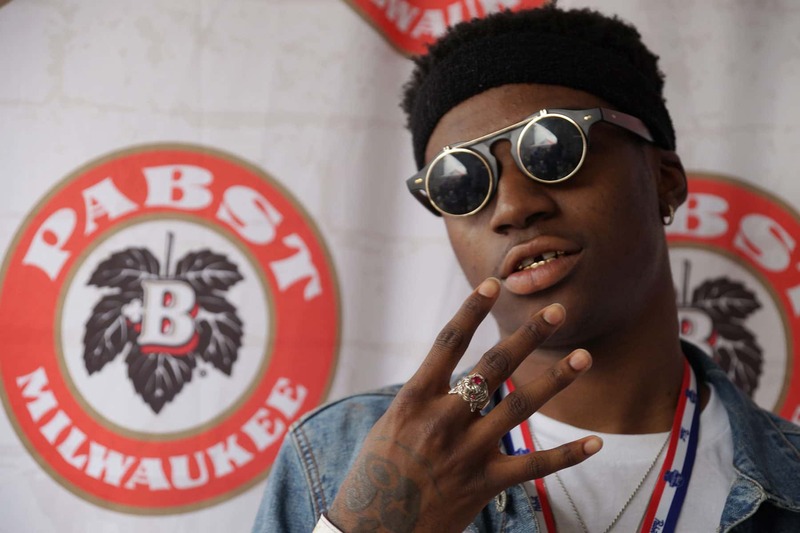 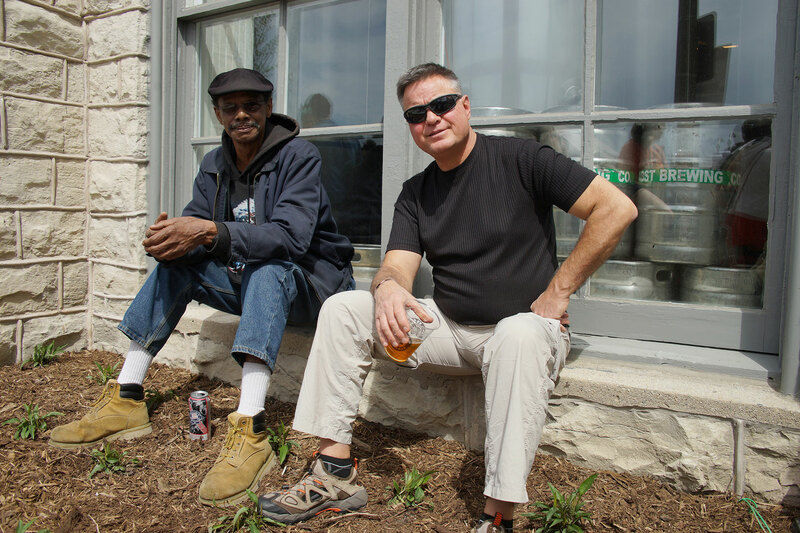 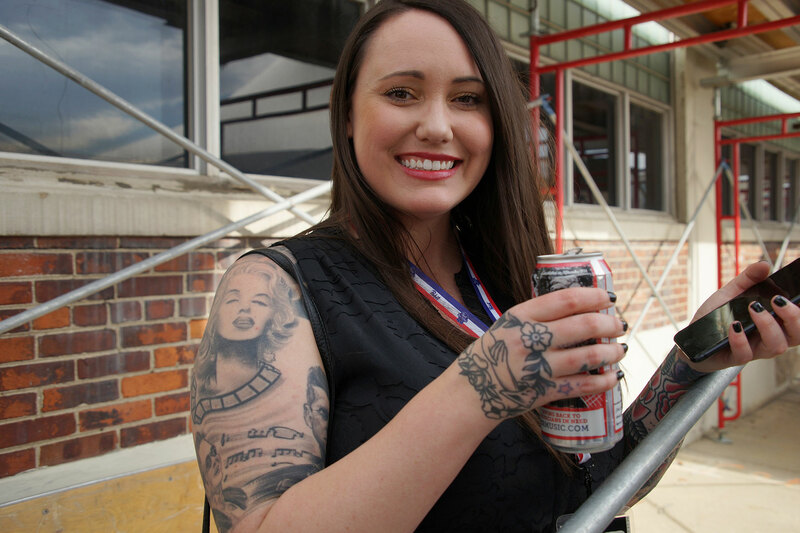 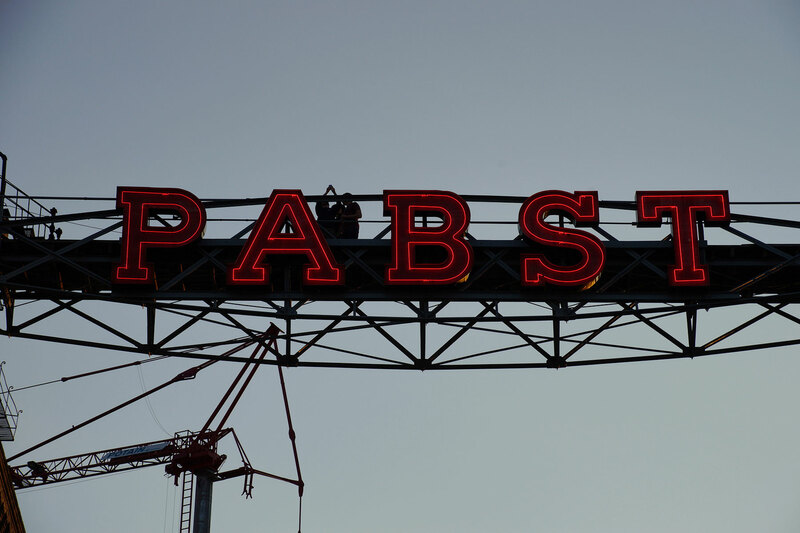 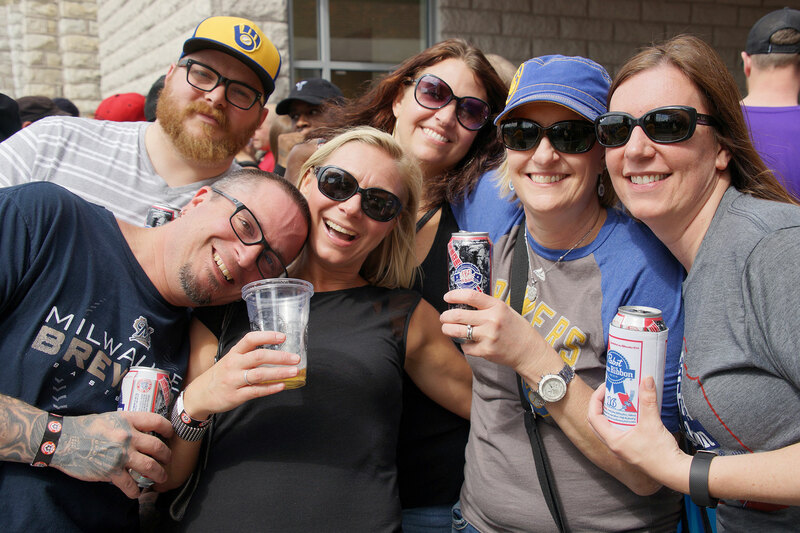 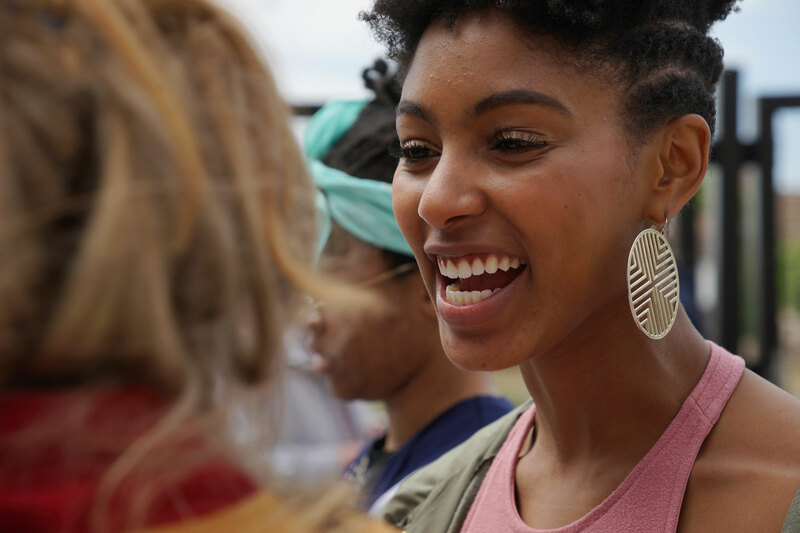 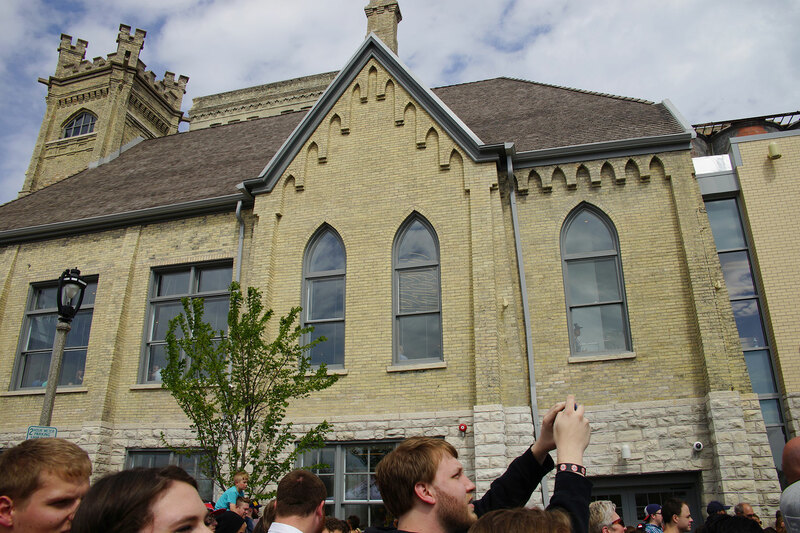 These images captured the day of festivities, drinking, and music, as Pabst Brewery officially celebrated its return to beer production in Milwaukee. 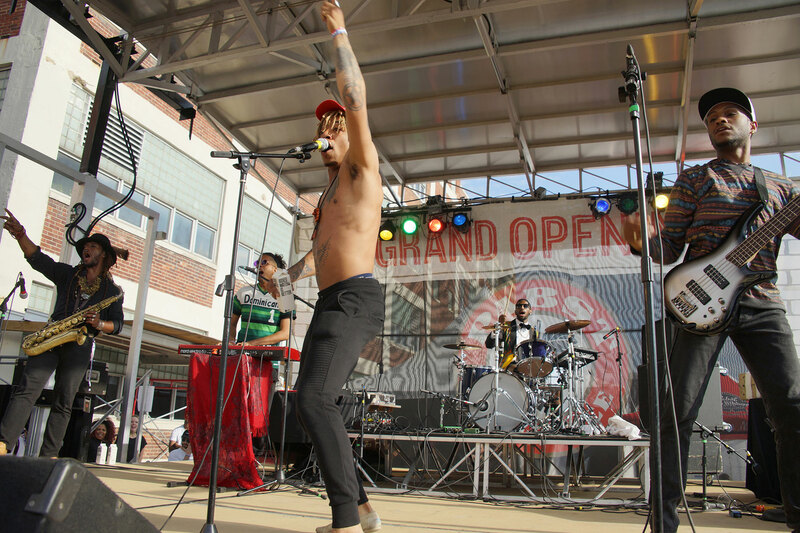 The Arrested Development concert pictures can be found in the companion Photo Essay. 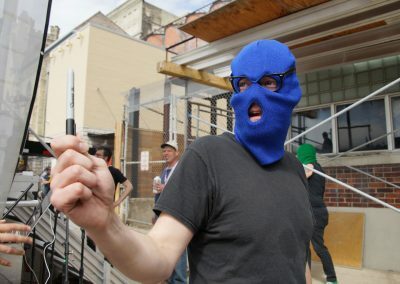 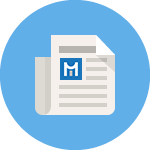 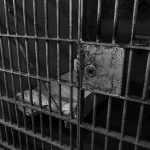 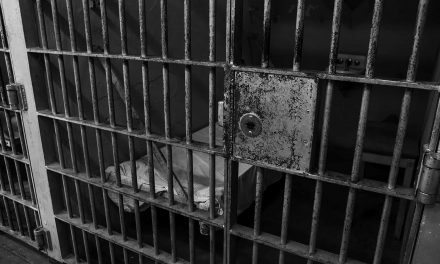 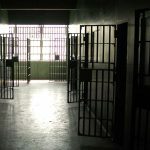 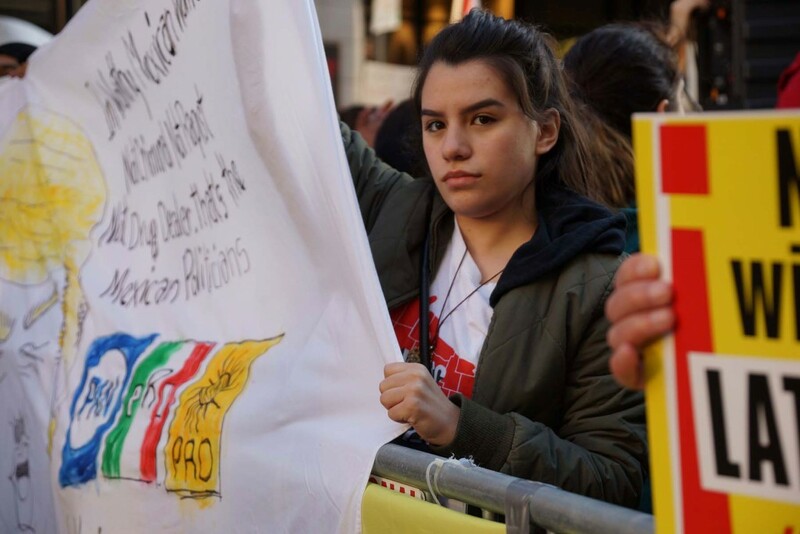 View the extended coverage of this story, with a package of news features.